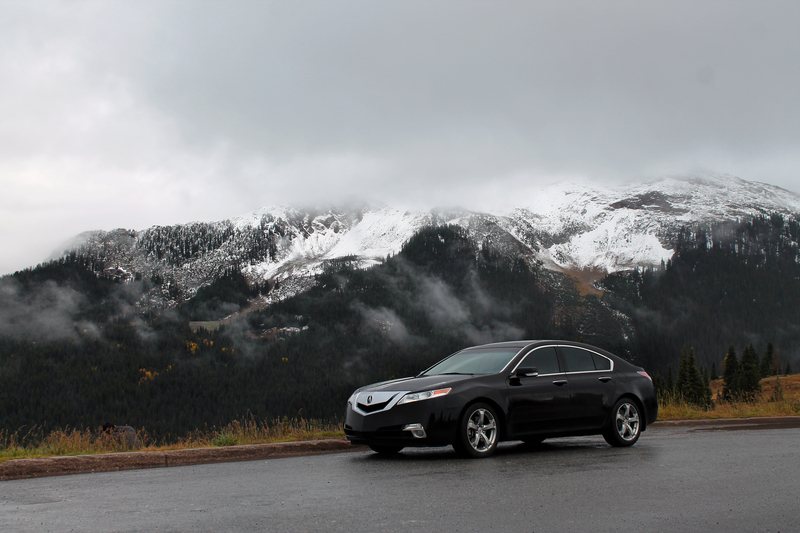 The next day we made our way to Pikes Peak, just 30 miles west of Colorado Springs. First stop along the way was Garden of the Gods. 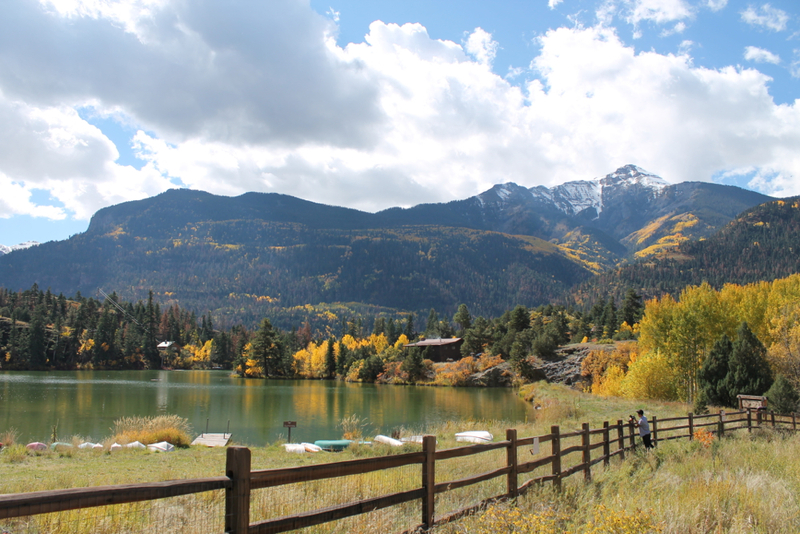 This public park just west of Colorado Springs offers nice views with hiking and Segway tour accommodations. Since we wanted to be mindful of the time, we chose to just drive through. Wait. 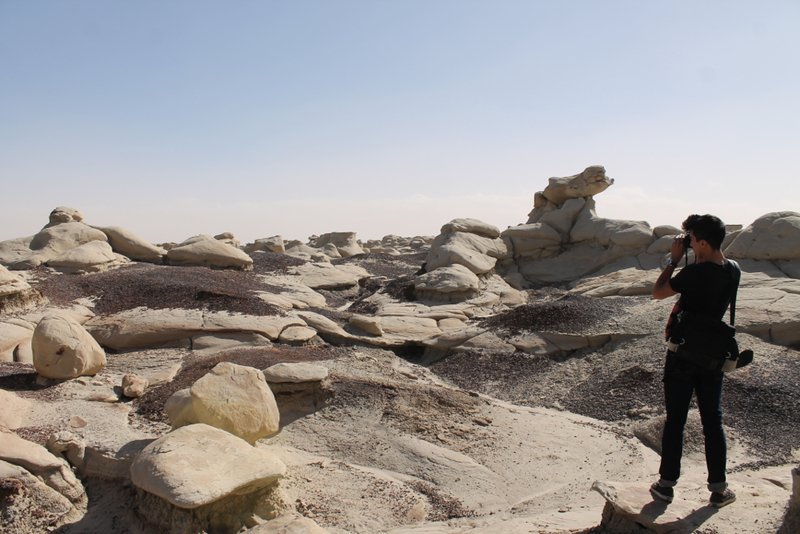 Did we stumble upon another planet? More amazing views. 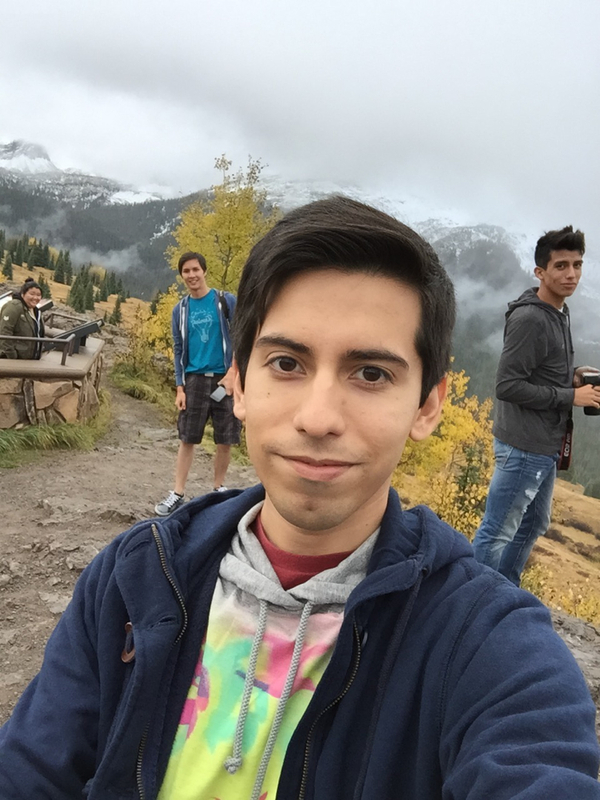 Cheesy photo by “balanced rock” in the park. Now let’s get to the good stuff. 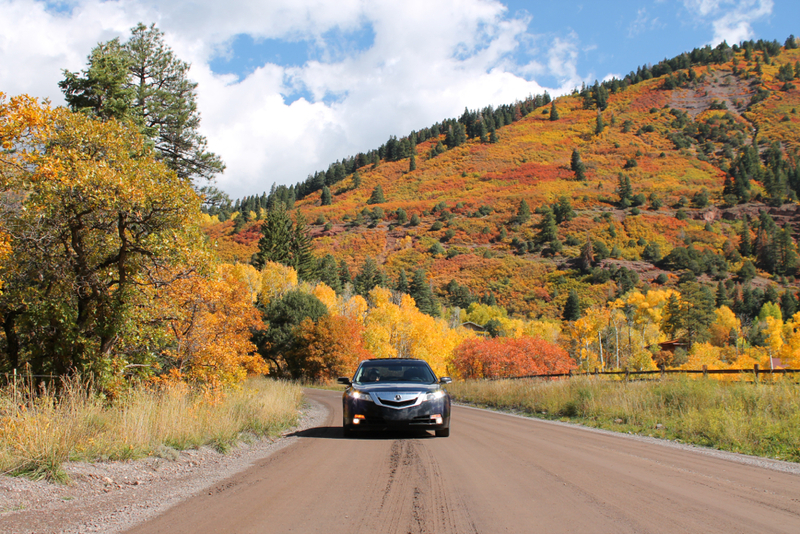 Making our way to Pikes Peak highway was an easy drive. Upon arrival at the tollgate, a rather lengthy line of cars were awaiting their turn to pay the entry fee to continue onward. It wasn’t the cheapest at $30 ($15 per person), but trust me…all was worth it. 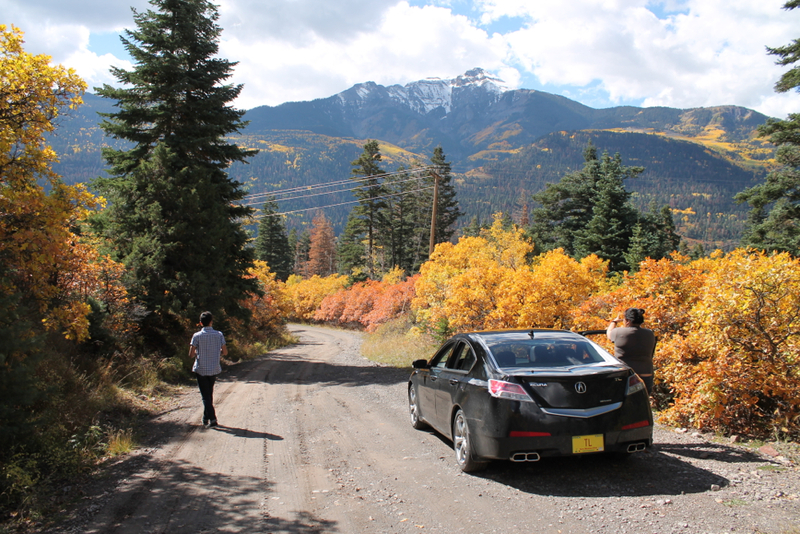 Pikes Peak is regarded as the most visited mountain in North America, and only second in the world next to Japan’s Mt. Fuji. At 14,115 ft above sea level, this is the 31st highest peak out of the 54 in Colorado. 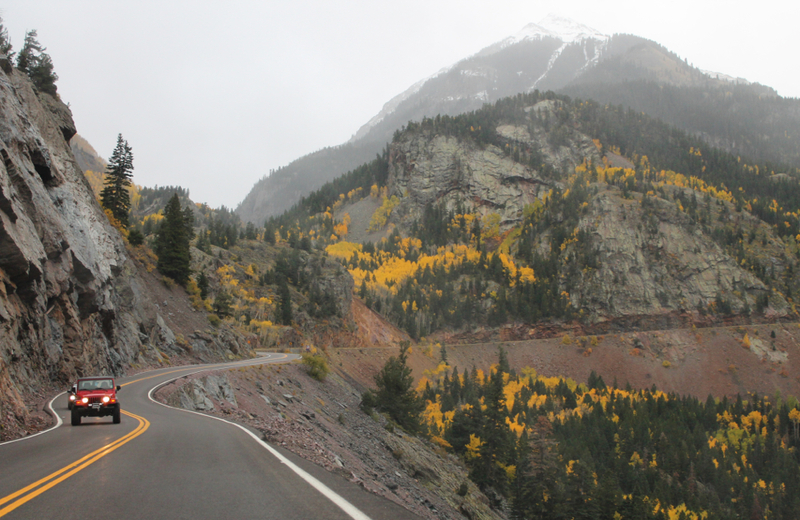 The Pikes Peak Highway from the base to the summit climbs 7,400 ft over just over 12 miles! Four major events take place on this mountain each year, Pikes Peak Ascent and Marathon, Pikes Peak International Hill Climb, Pikes Peak Challenge and the AdAmAn Club New Year’s Fireworks display. Best part for me is simply enjoying the views and crossing off another bucket list item. Making our way up to the summit. We are now beginning the 7,400 ft climb. THIS GETS STEEP! …and steeper! (now at alpine level) It’s certainly an odd feeling being nearly eye-level with the clouds. 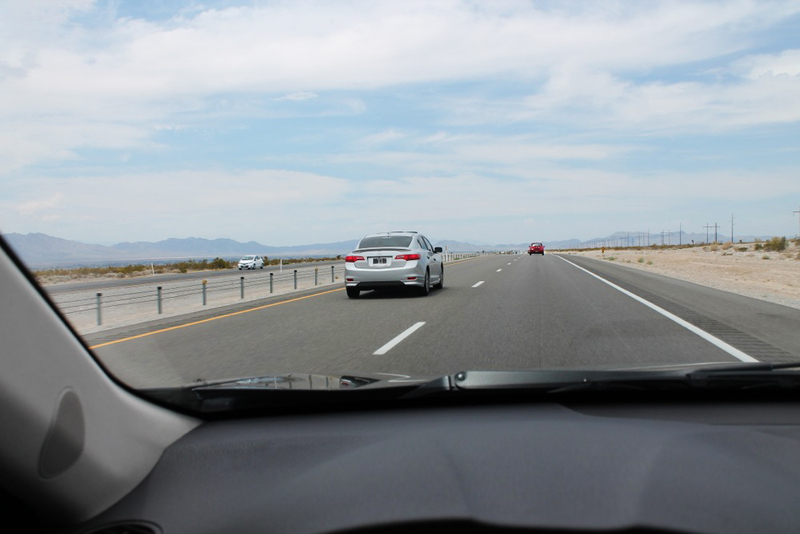 Nah, you don’t need no stinkin’ guardrails here. 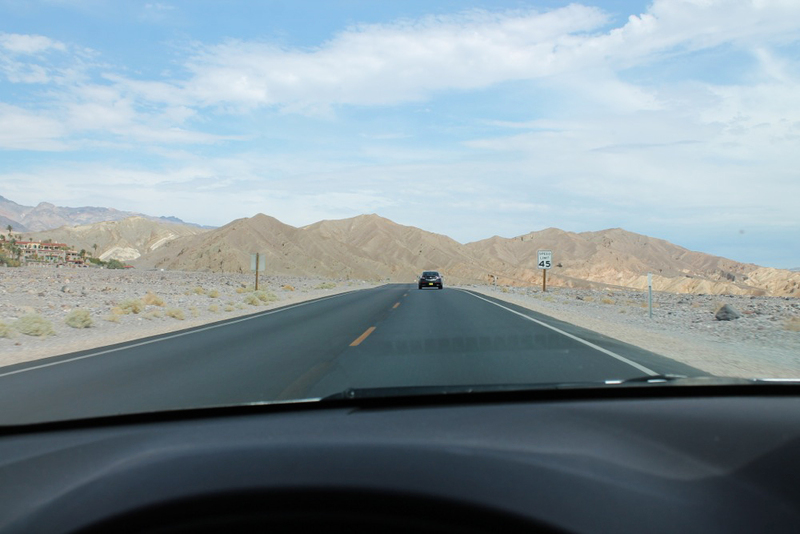 Some areas you would fall to certain death if you got a little careless with driving. The views were quite intoxicating, and most curves were perfectly banked for some decent fun. Mostly though, we just took our time at a steady pace. After a little under an hour which included many photo stops, we made it! 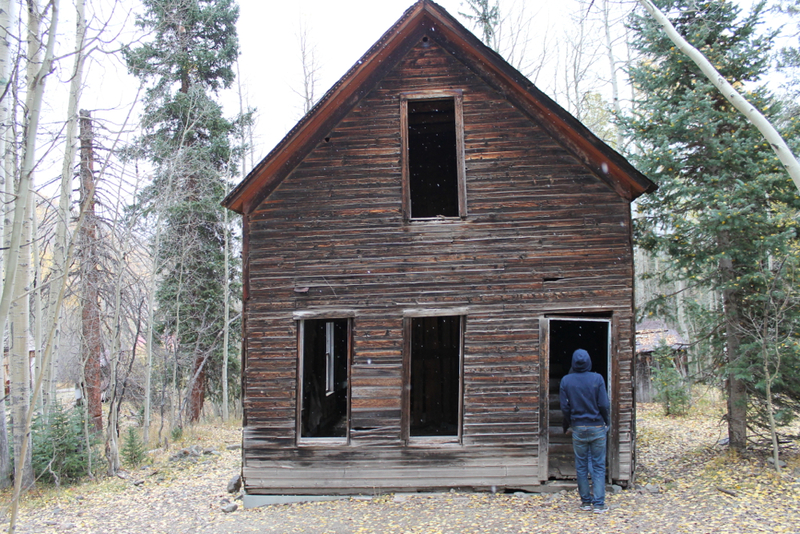 We checked out The Summit House which was the only facility at the summit. 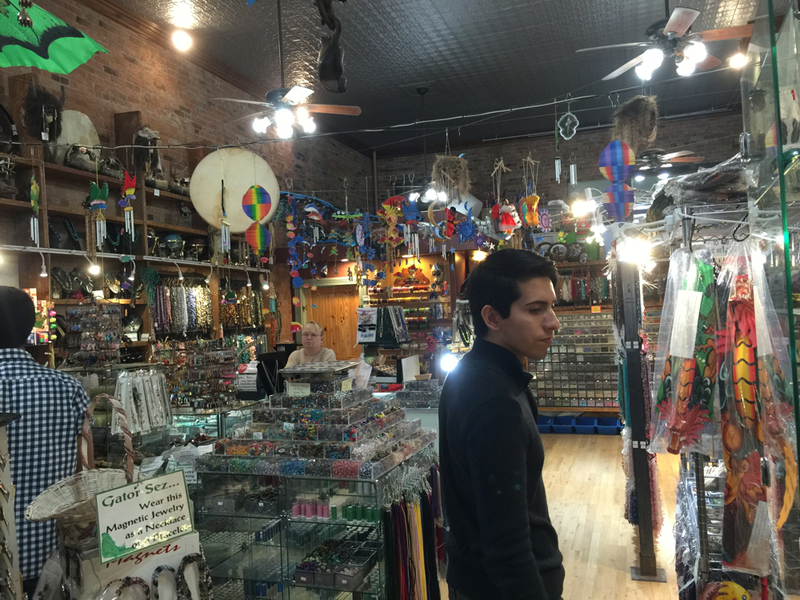 Stuffed full of endless souvenirs and a small cafe, you could get lost in there for quite some time. A small burger and milk shake sure hit the spot and I did manage to buy a few items. 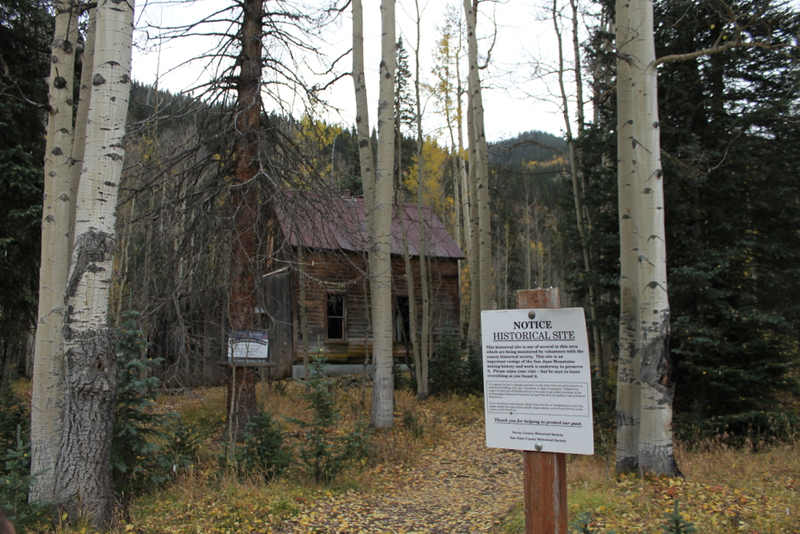 Outside the Summit House, you’re free to walk around with no barriers, fencing or other obstructions and take in the scenery. When it was time to start the descend, I was surprised that 1 – 2nd gear and 4,000 rpms were all I could use to comfortably control the speed. Rain started to come down which made me even more cautious. Midway down the mountain, there was a mandatory brake check where a nice lady actually checked each vehicle’s rotors and pads with a temperature gauge. 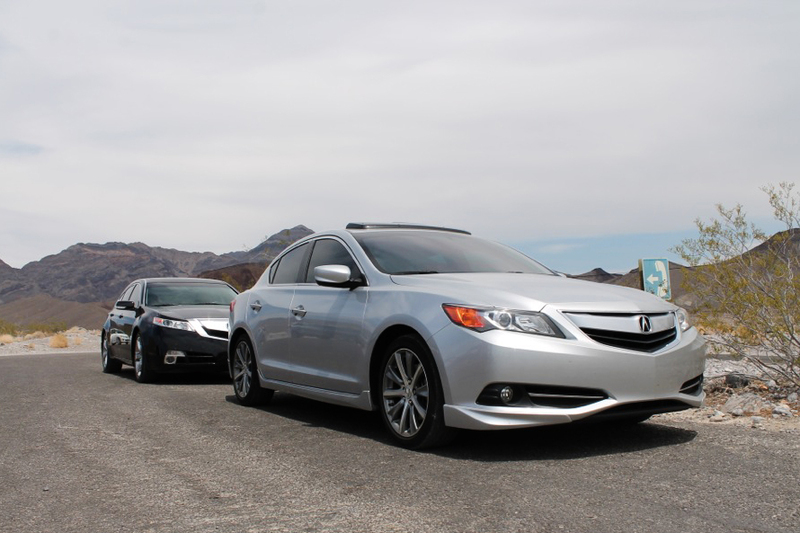 If your brakes were too toasty, you have to pull aside to let them cool before proceeding. This was serious stuff here. Luckily, we sailed on by with no issue. Sometimes past drives are so memorable that I just need to get back for another go. I’ve had this goal for many places I’ve visited, but one that tops the list was Mt. 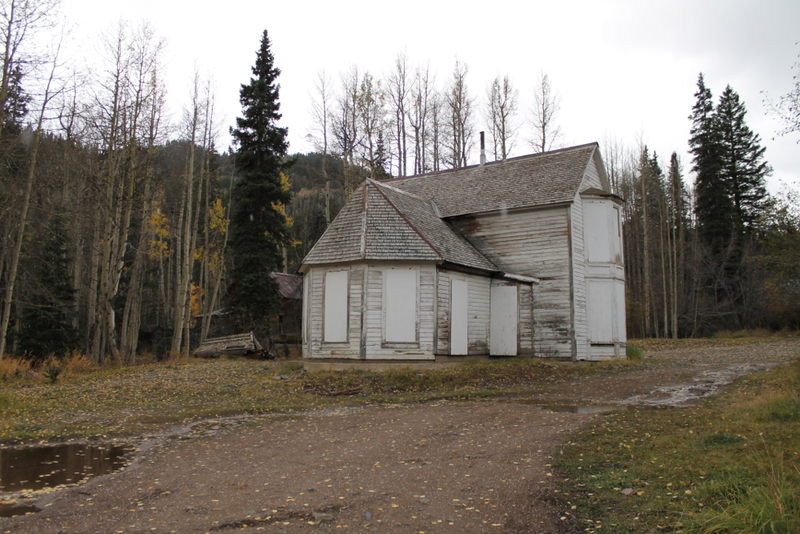 Evans in Colorado…the highest paved road in North America. I actually didn’t plan this much in advance. It was more of a last minute trip idea, and not going to be a blog post until I decided to throw in one more stop, Pikes Peak! This trip happened in early August of this year, so the weather was just right…cool temps with light spots of rain. 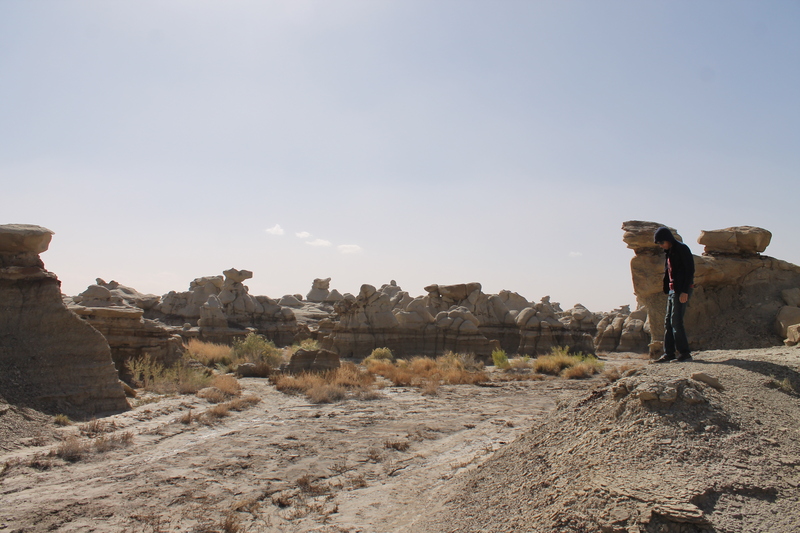 My buddy, James Zamora, and I decided that a four-day weekend was in order to escape the humid heat of the desert in search of those cooler temps. You may remember my first drive to Mt. Evans in 2013 with James and Tyson from drivetofive. 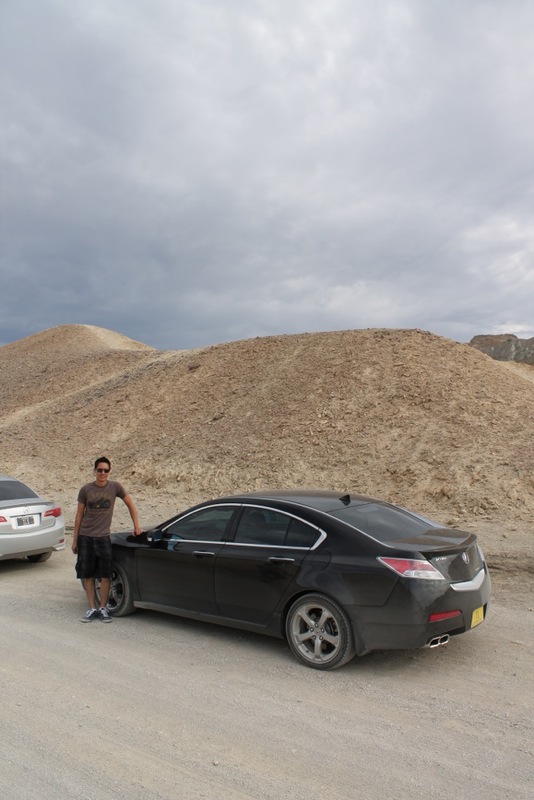 I drove my 2004 Honda Accord Coupe V6 6spd then and never forgot the experience. 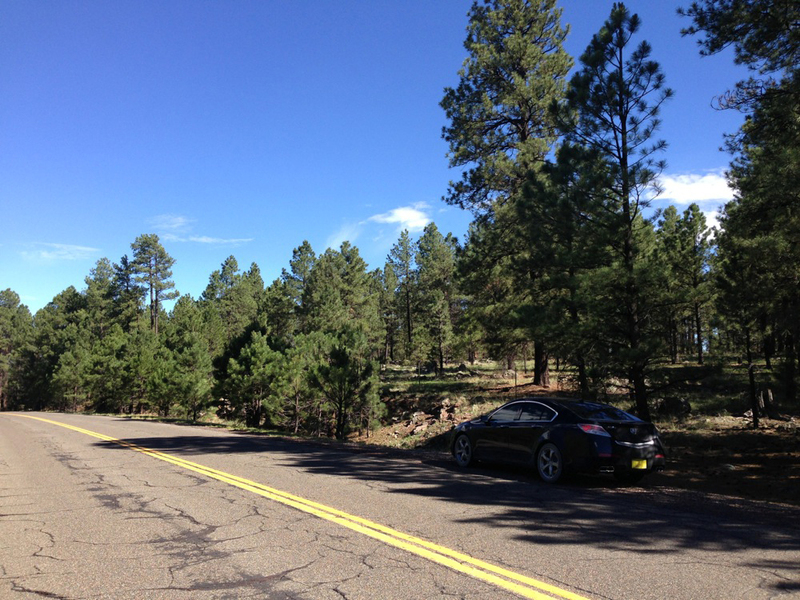 We planned to visit Pikes Peak as well, but it was closed for a bike event. Mercifully, it was open this time so I couldn’t pass it up. 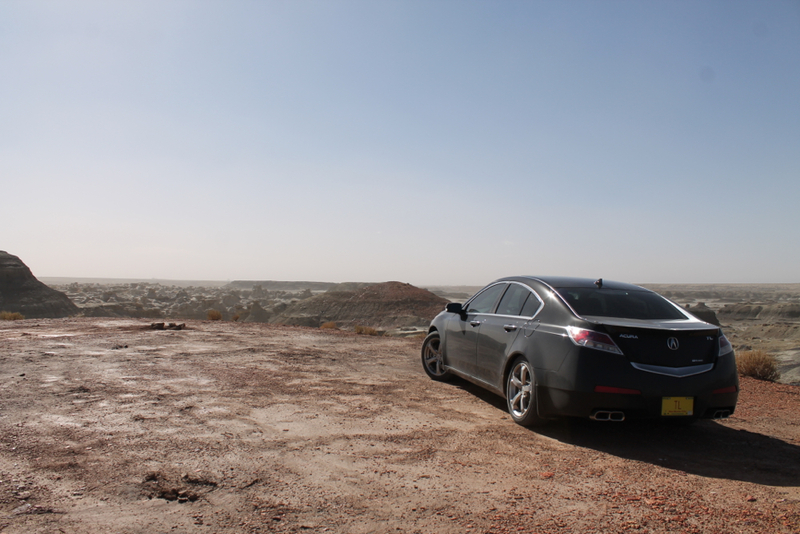 Now, let’s give my Mazda 6 that same Mt. 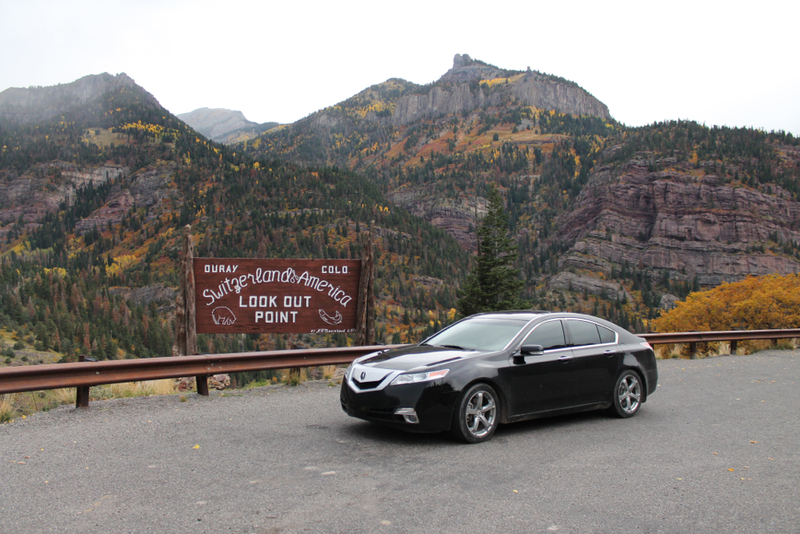 Evans experience and see how the 230,000 mile motor handles 14,000+ ft above sea level…twice! While Mt. Evans soars to 14,211 ft, Pikes Peak isn’t that far behind at 14,112 ft. More importantly, how would I handle those heights since I’ve not been in the best shape lately. Let’s find out! Getting into Colorado with a gentle mist in the air. Note this was the time I was trying out those chrome alloys! Oh, what’s this? 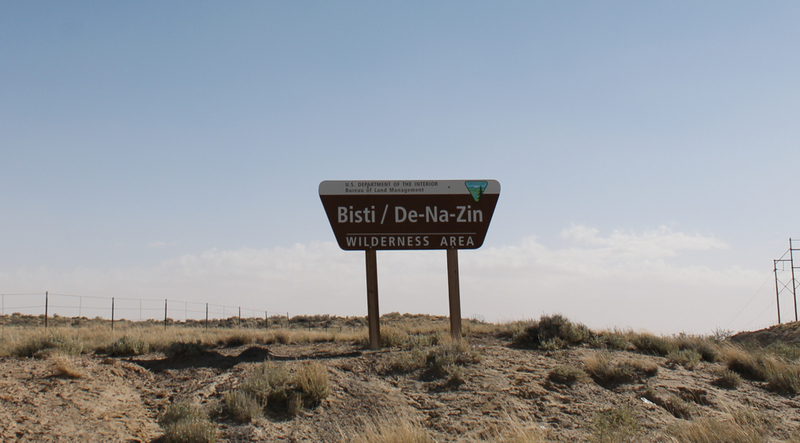 A national park along the way? It’s the Great Sand Dunes National Park, and we both had never been. Time to rectify that. A rather underrated National Park, the Grand Sand Dunes lives in southern Colorado and is known for being the tallest sand dunes in North America. 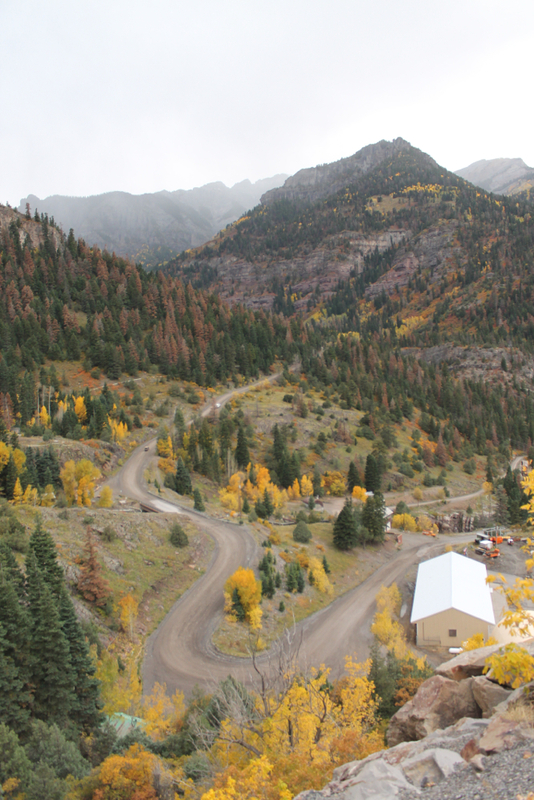 Being at the base of the Sangre de Cristo Range, it offers some of the most majestic scenery around Southern Colorado. I highly recommend a stop to just let your feet sink into the sand. 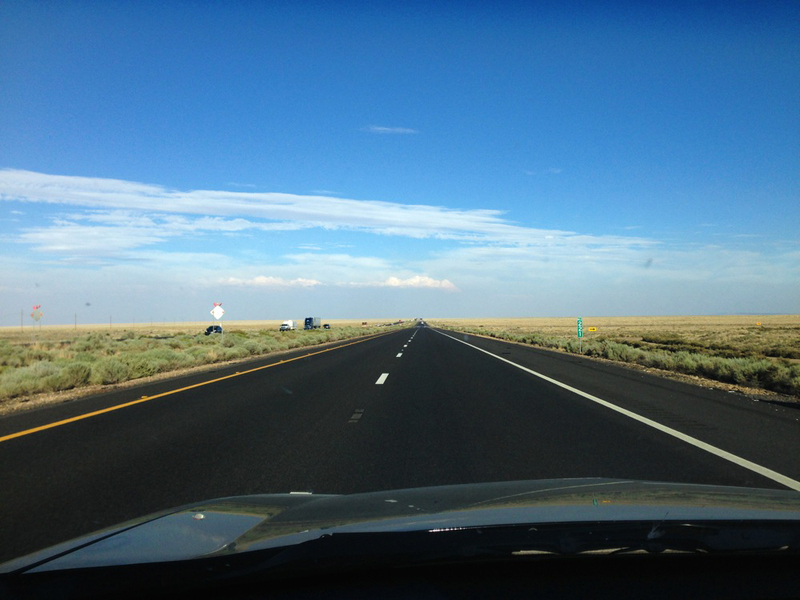 We continued onward to Denver for the night. Hotel of choice was the Hyatt Business center which had the best rates on the south end of town. 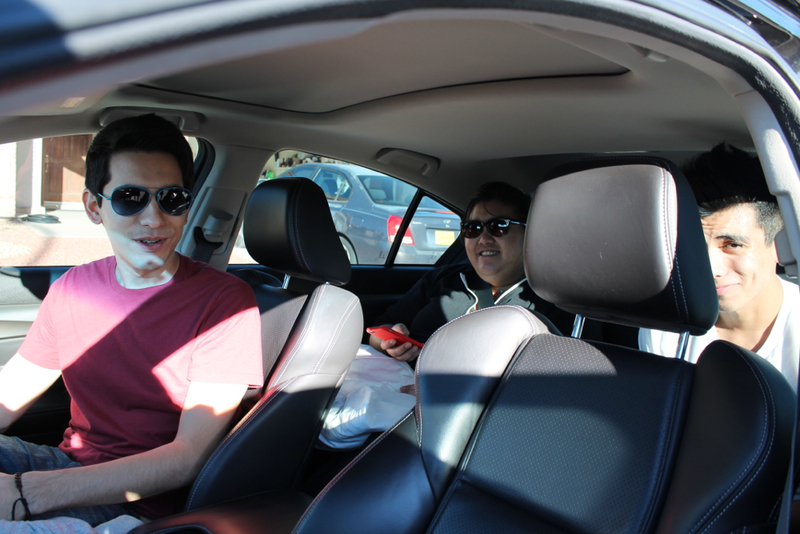 The following day gave us bright and sunny weather for the drive to Mt. Evans. 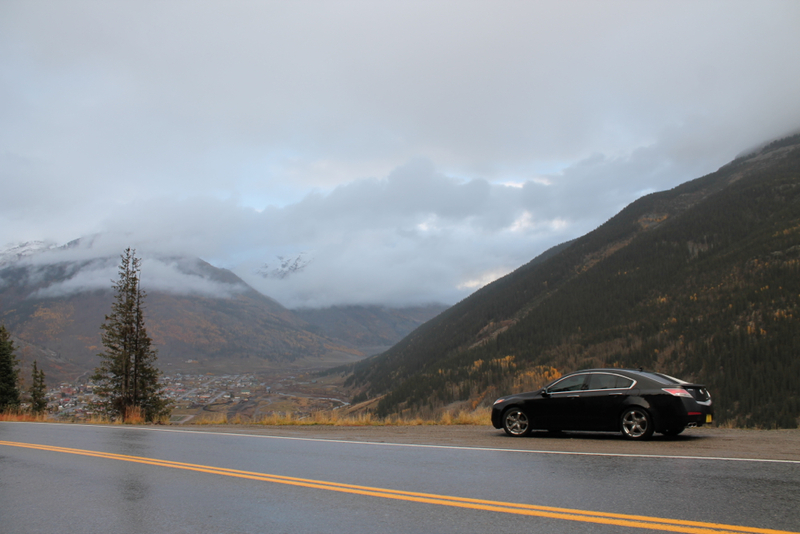 I was thrilled to be once again driving this highest paved road in North America. 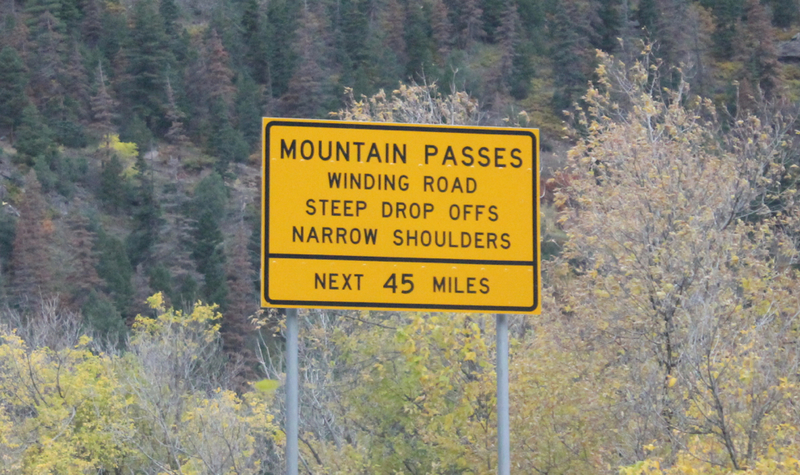 Lots of switchbacks with no shoulders or no guardrails await! Didn’t take long to get up into alpine country. Stop at Summit Lake, just 5.5 miles from the top of Mt. Evans. Thanks to James for helping out with the photography. This selfie mirror shot is starting to become a tradition. Made it to the top! Parking was a little tricky since there were quite a few tourists at this time of year. 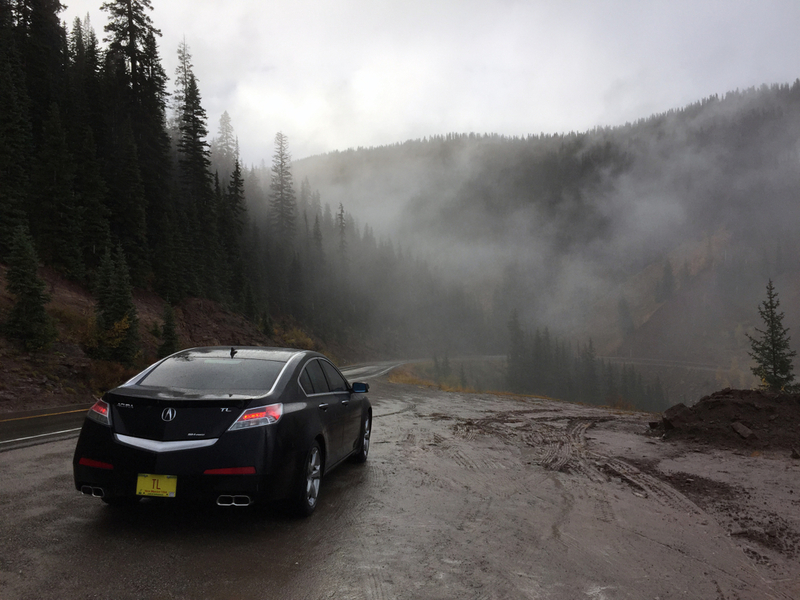 The little 6 charged up the mountain without incident. And it wouldn’t be a 14,000 ft+ experience without spotting the occasional big horned sheep and mountain goat! Heading back down. Luckily, we didn’t suffer any ill effects of the altitude aside from a very slight headache I felt coming on. This could also have been my lack of water intake that day, though. 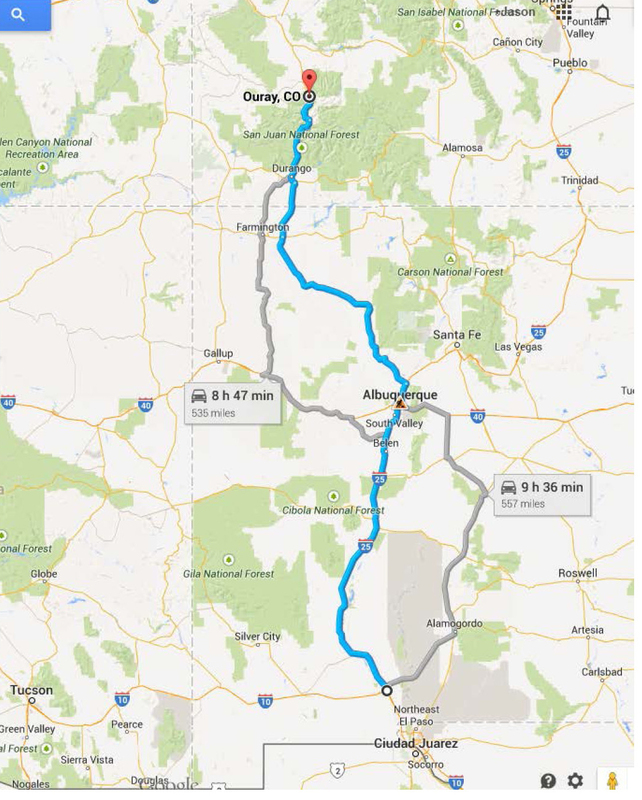 We wrapped up the day with an easy drive to Colorado Springs for the night. 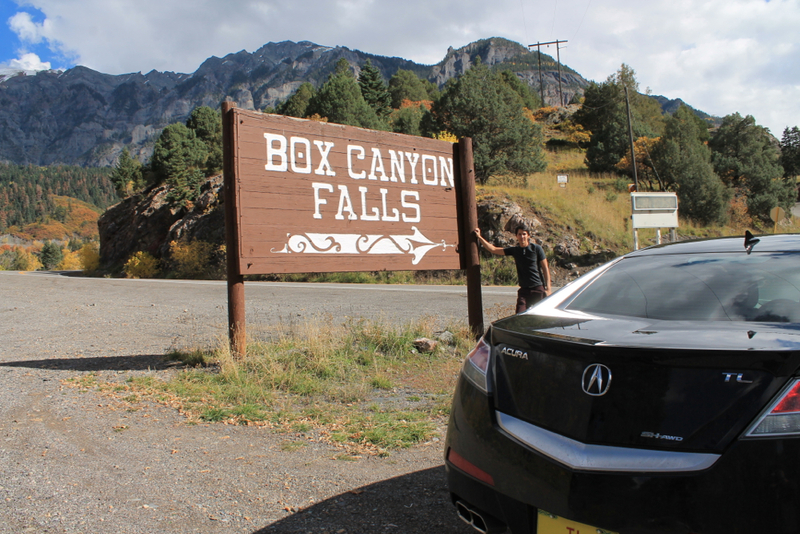 Stay tuned for Part II of Pikes Peak! Greetings! Summer is here in Las Cruces, NM and the heat is definitely on. 100s all week and into the next. I don’t mind at all as it’s just part of the summer experience. 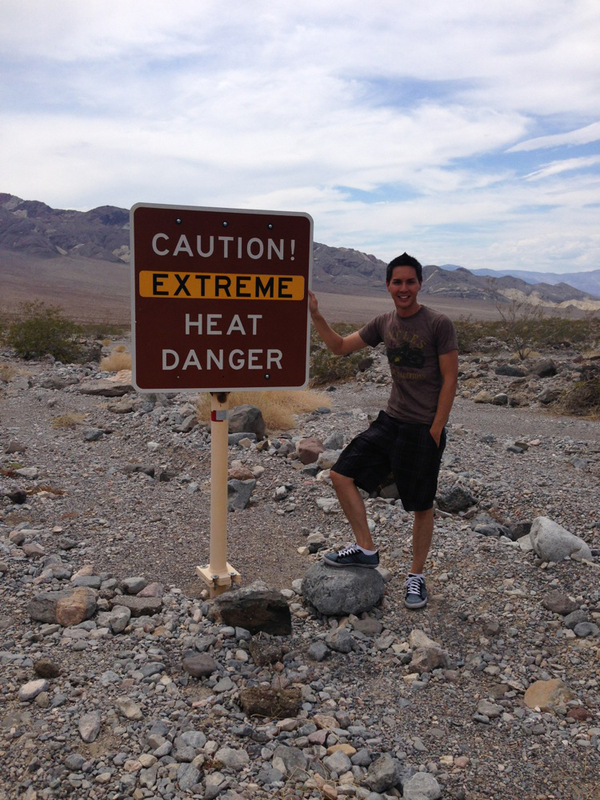 Speaking of heat, I recently was asked to attend a training in Las Vegas, NV for work. 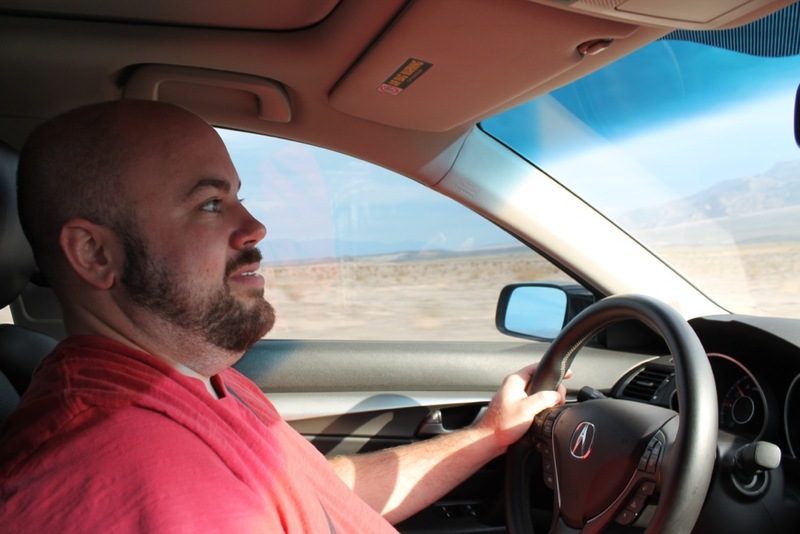 Road trip while getting paid? You bet! 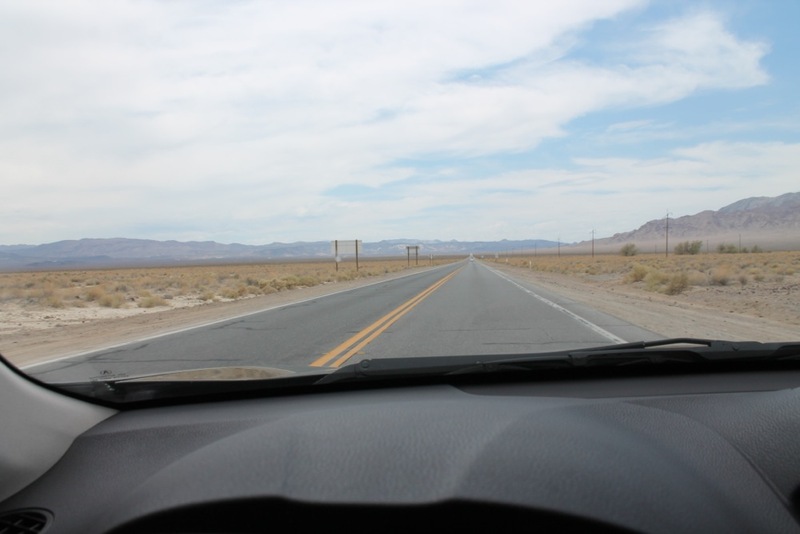 Flying was offered as an option, but I chose the longer, driving route. 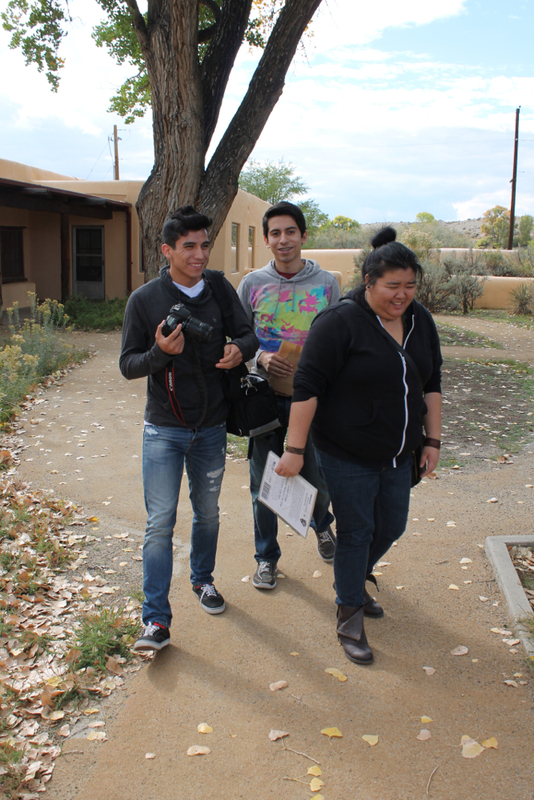 While it was quite warm in Las Cruces, it was dang HOT on this trip. First stop was in Phoenix, AZ (about half way) where I had 5-star accommodations at my buddy’s (Tyson’s) place. From Phoenix, it was an easy 4.5hr drive to Las Vegas. 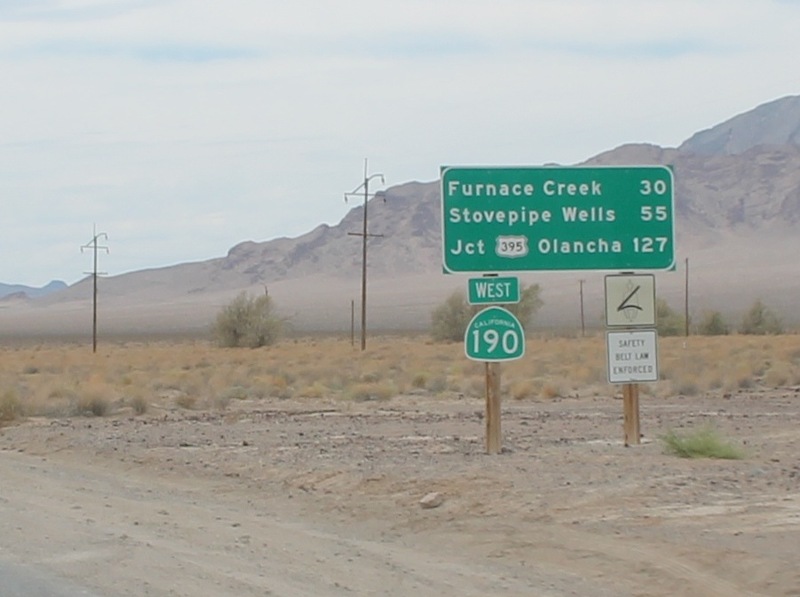 Phoenix was around 110 degrees where ‘Vegas was ONLY 109! 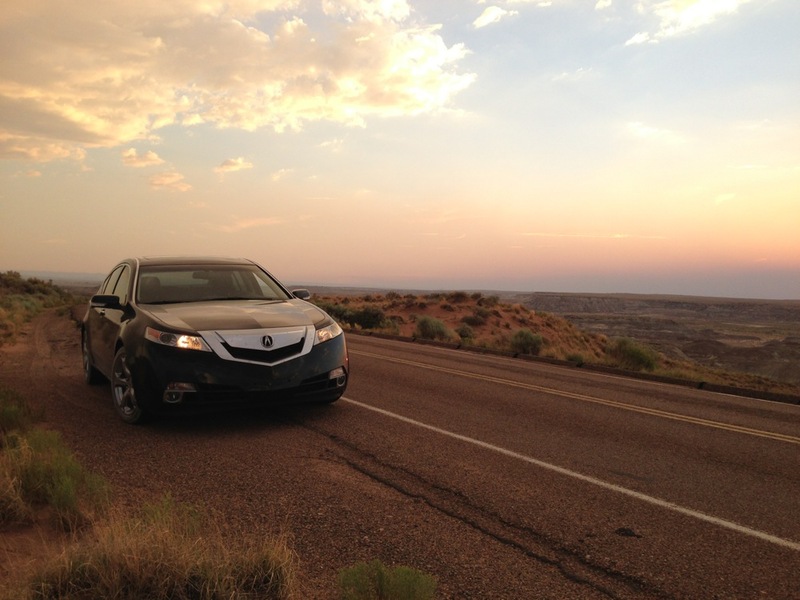 Total drive: 1,400 miles and ~22hrs of windshield time. Here’s the montage of the journey. Enjoy! Arrival at Tyson’s place in Phoenix. Even though he was away in Utah at that particular time, he generously allowed me to stay at his new place (purchased last June). Inverted pyramid building in central Phoenix. I snuck into Tyson’s newly renovated garage to grab a few photos. 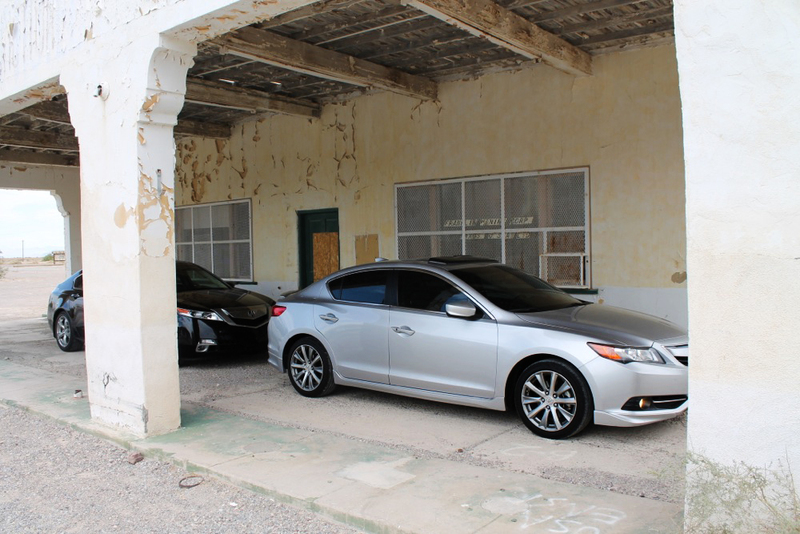 This garage accommodates a whopping five cars, and is a showroom for his complete (sans an SLX) 90s Acura collection. So clean, you can eat off the floor! Next day I hit the road for ‘Vegas. Quick stop at Nothing, AZ. My second time here. Crossing the mighty Colorado River into Nevada! My conference and two night stay was in Caesar’s Palace on the strip. 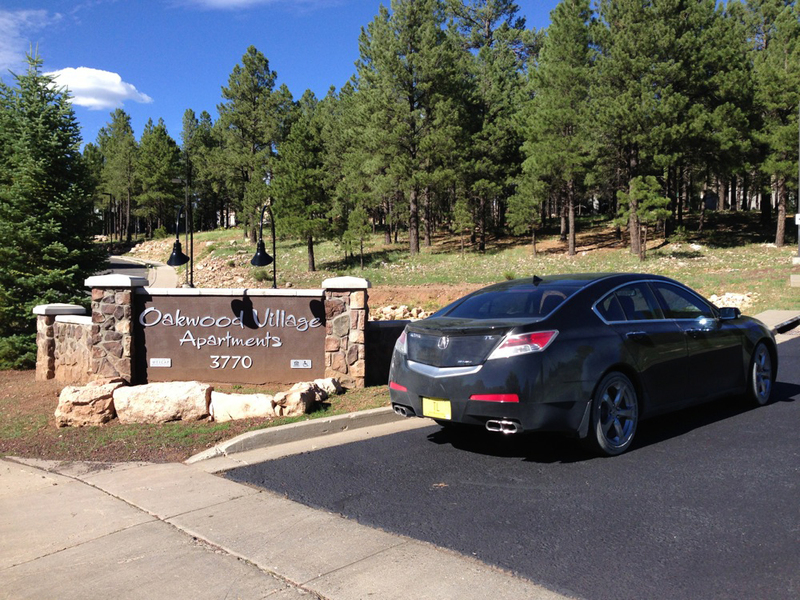 Checking in…accommodations weren’t bad at all. A little exploring since I had the evening to myself. No gambling for me, though. It didn’t take long before I was pooped. Since the conference started early the following morning, I hit the hay while the rest of the Strip hustled and bustled throughout the night. 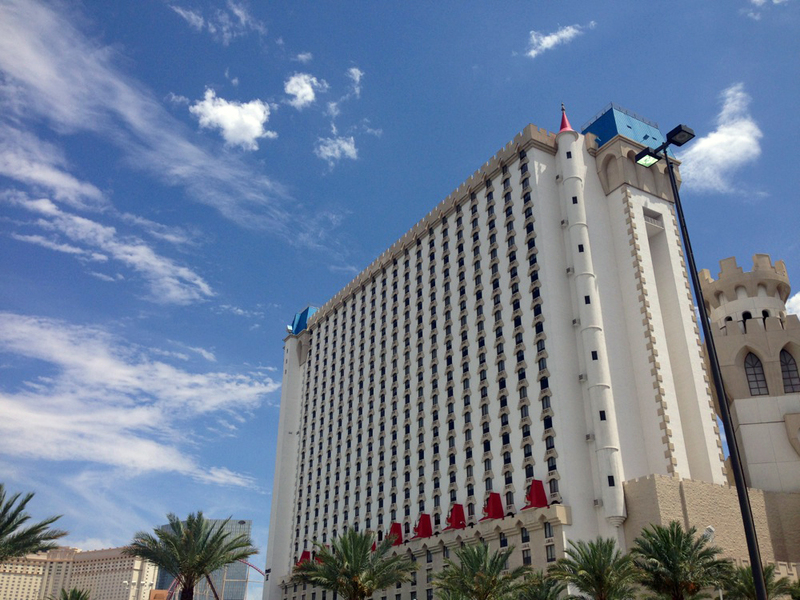 The following two days of training was here at Caesar’s conference tower. My last night at Caesar’s, I discovered a TV in the bathroom mirror? Return trip back home, and one more stop at Tyson’s. 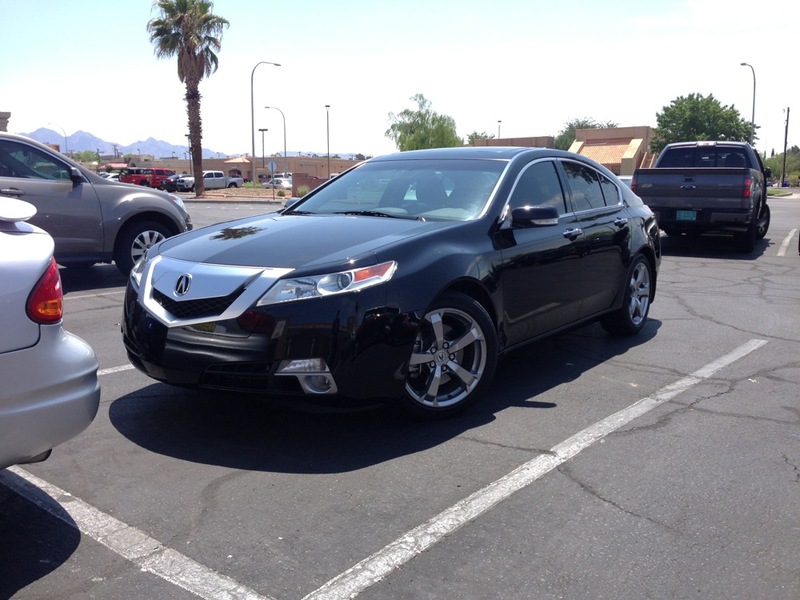 I gave his gorgeous 2007 Kinetic Blue 6-spd TL Type-s a quick drive. 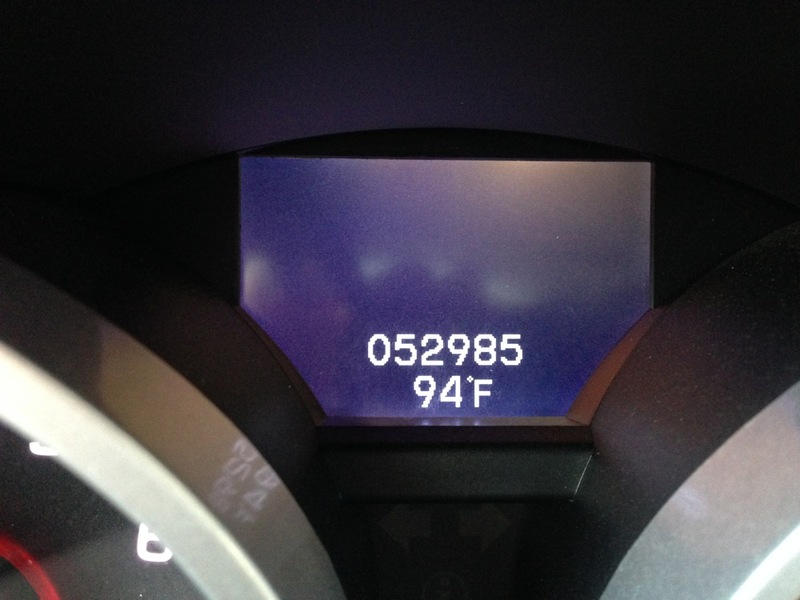 At 97,000 miles, it felt as though it just left the showroom. Someday, I might just have to grab one of these in black. 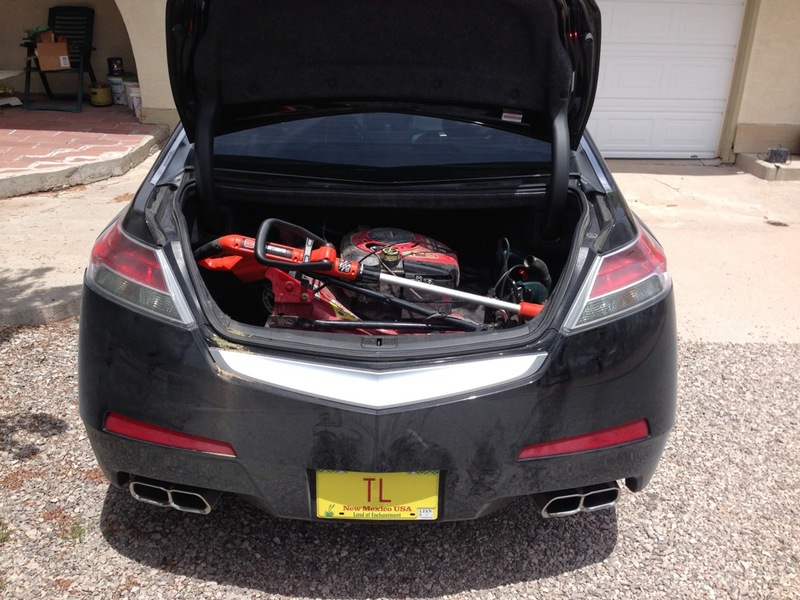 Before heading out for Las Cruces, I started a new tradition by having significant folks who have ridden or driven the 6 in the past sign the trunk lid with a silver sharpie. 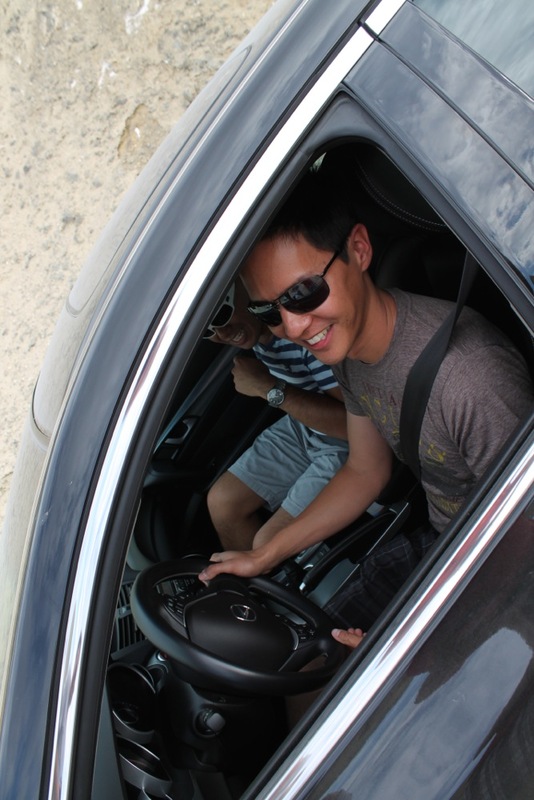 Tyson and James Lee of sixspeedblog.com happily started us off. Interstate 10 all the way home, and I hit some nice cool rain along the way. 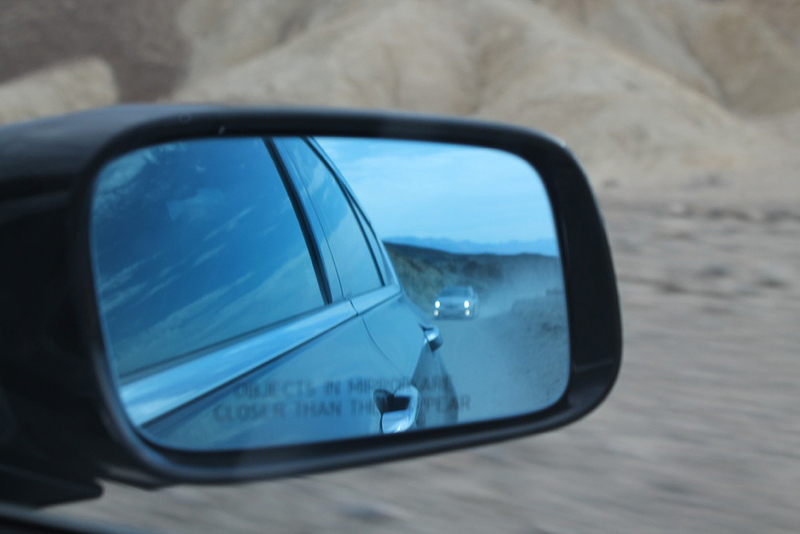 About 30 miles from the New Mexico border, AZ Highway Patrol pulled me over for my window tint being too dark. Luckily I just got a warning, but I’m still puzzled by the stop considering I don’t reside in Arizona! Back in Las Cruces and thanks to the rain, I was able to turn off the A/C for the first time in months. That concludes the drive. Thanks for stopping by! Let’s begin our travels back home! We did things a little different and took photos of the welcome sign as we departed. 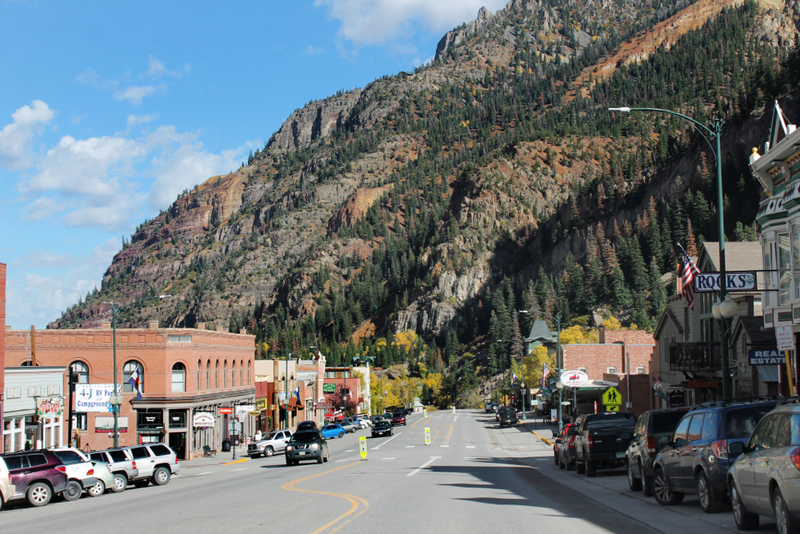 Couldn’t when we first entered Ouray as it was too dark. 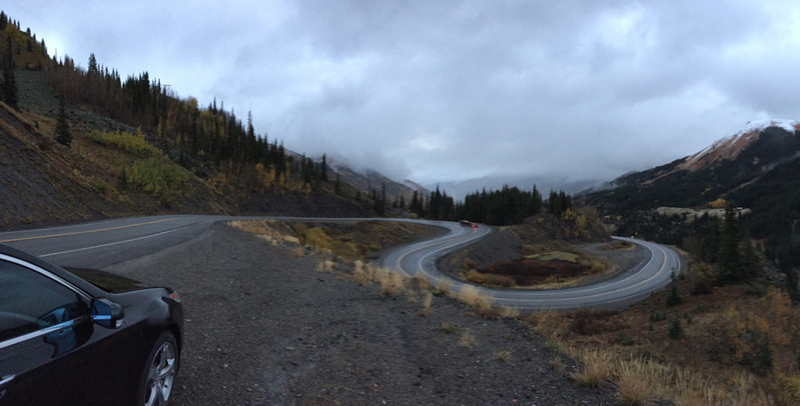 Then back down the Million Dollar Highway. This sign just reminds motorists of the dangers (and fun) that they are about in counter. 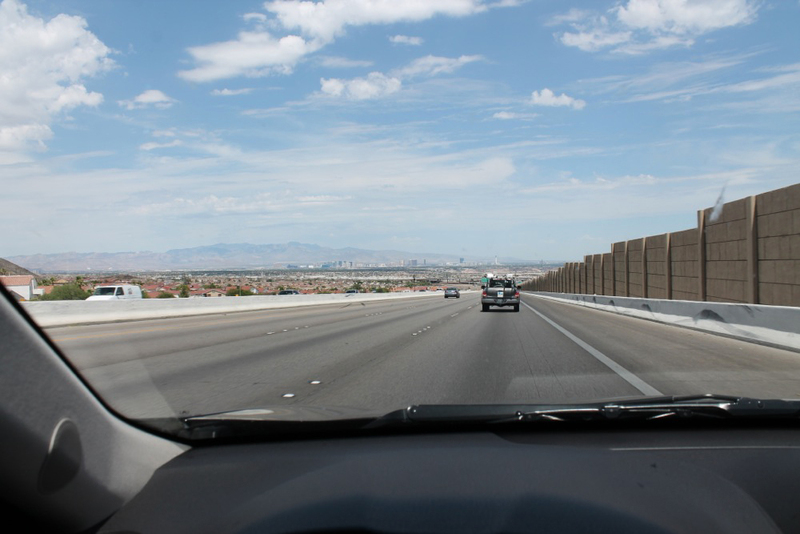 Here’s one of my favorite shots of the highway Jouhl managed to capture out the windshield. 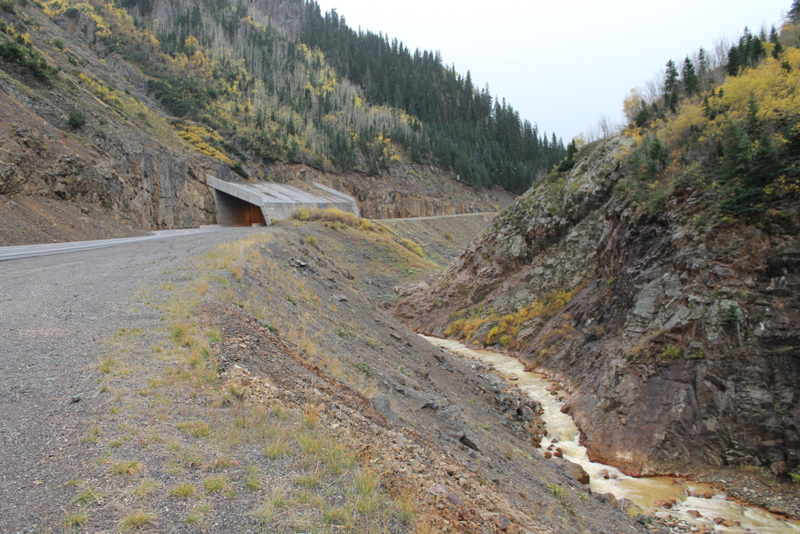 That tunnel there is slanted like to keep avalanches from taking out the road. 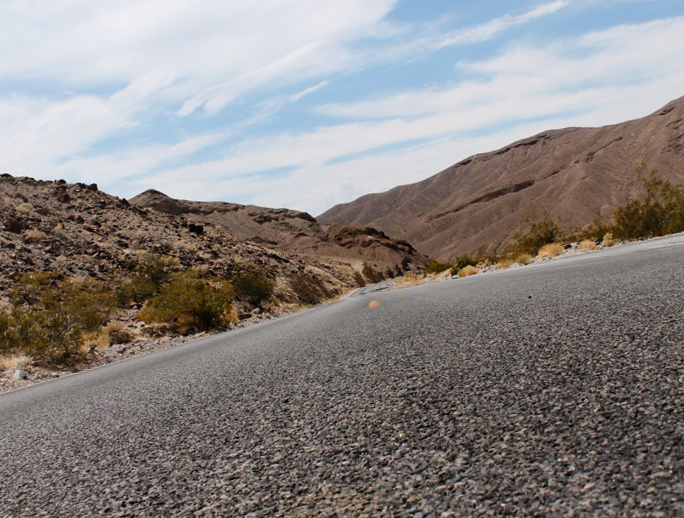 According to my Dad who does a heck of a lot more research into things than I do, the Million Dollar Highway is one of America’s most expensive roads to maintain. Access to Ironton was simple. 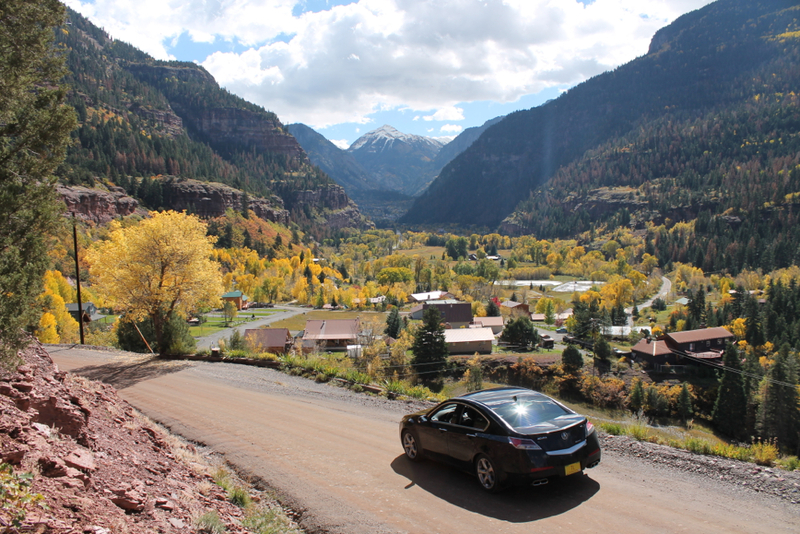 A narrow road covered in leaves off Hwy 550 takes you to the site. 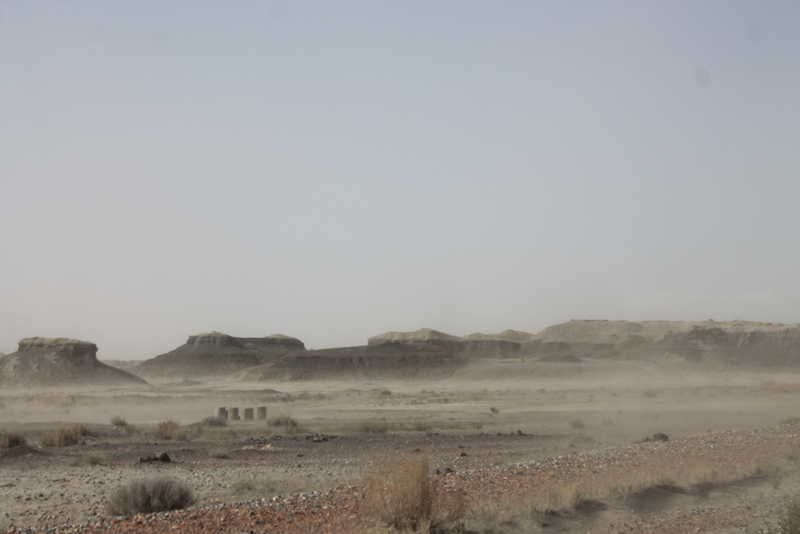 The weather was cold and misty…just the perfect atmosphere for some exploring. 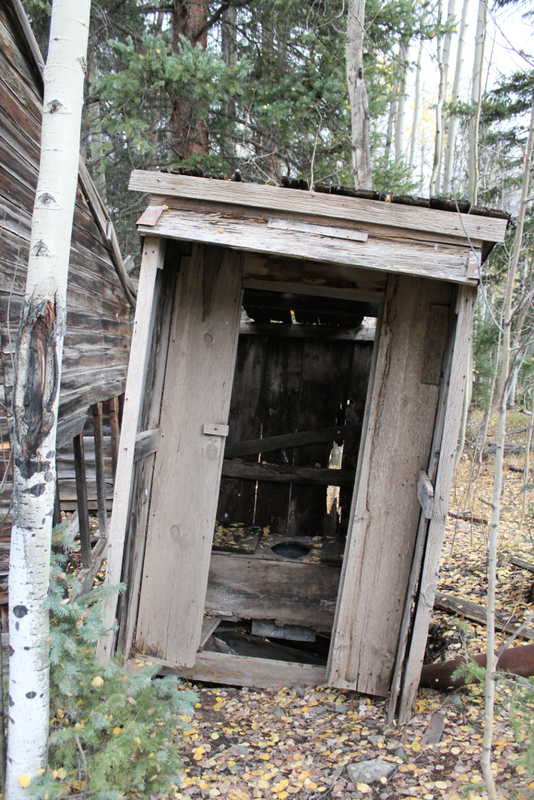 Believe it or not, I’ve seen worse bathrooms. 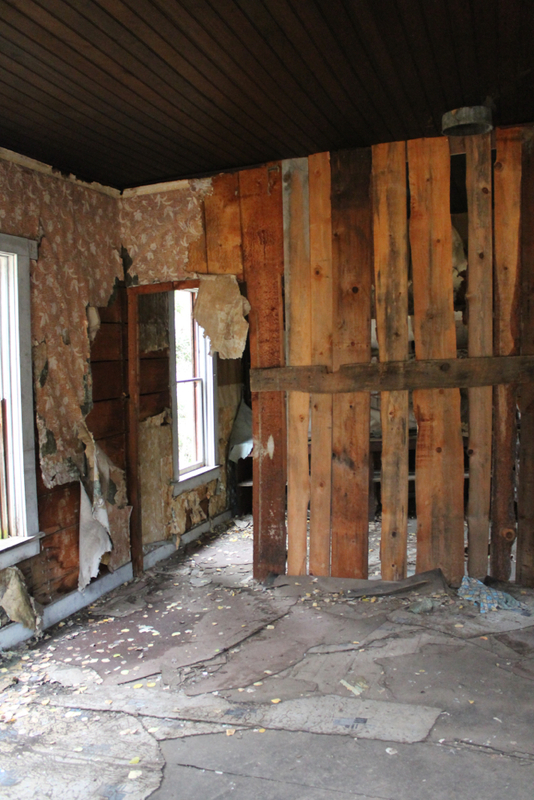 Most of us split and explored our own buildings. 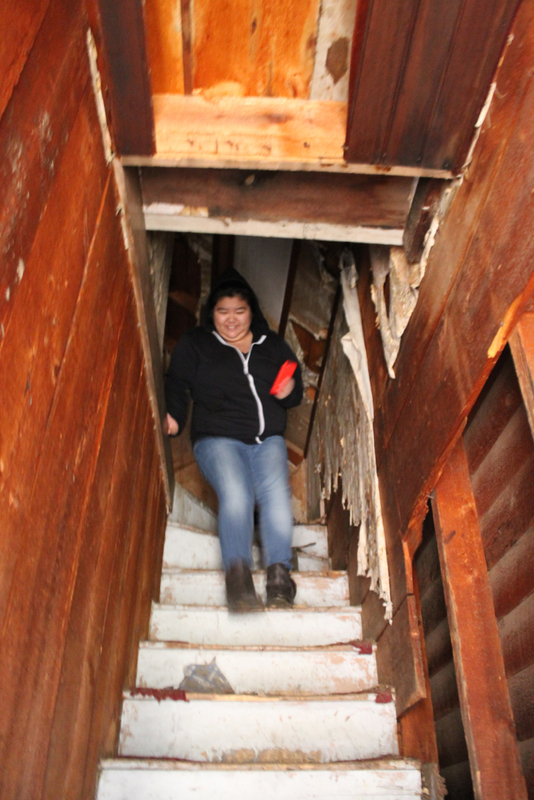 Here’s Jennifer coming down from one of the second floors. 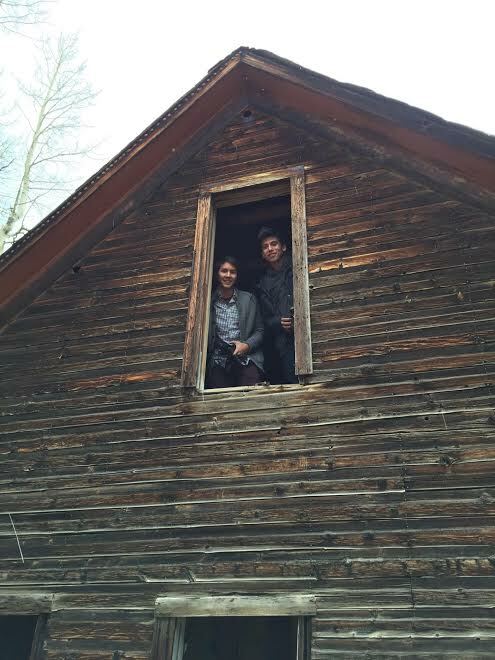 Alec and I braved the darkness of the second story of this rickety old house. Jouhl decided to wait for us at the entrance. 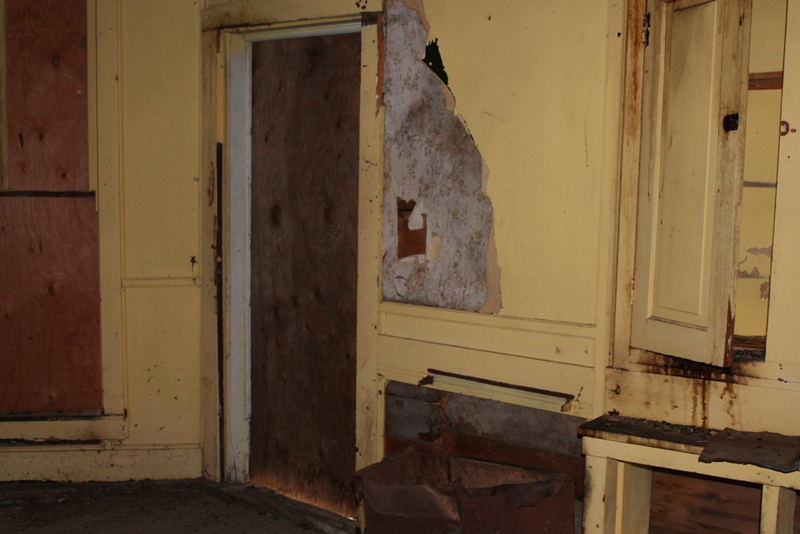 Nearly all the buildings were structurally sound enough to walk through. Some were quite creepy! 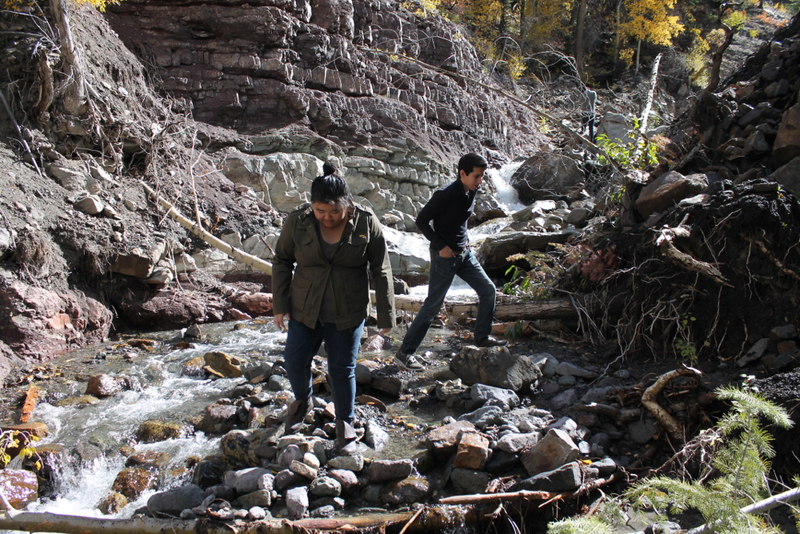 As usual, wandering around randomly ended up following the Red Mountain Creek for short distance. 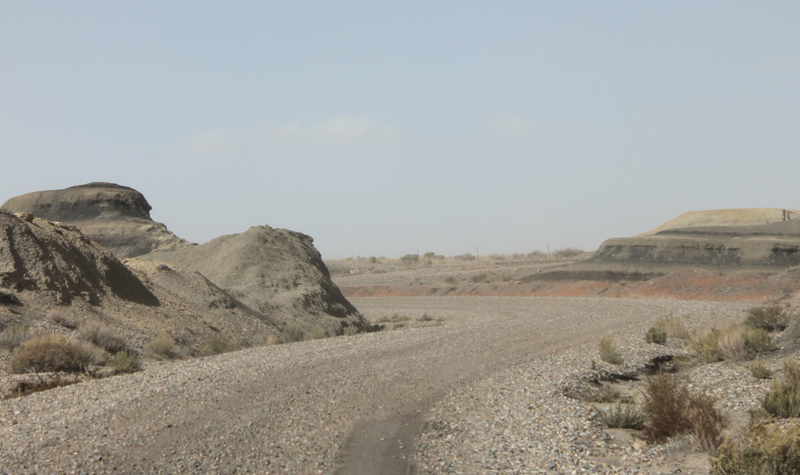 A 10 mile road layered with corse gravel and bumpy turns made for a rather exhausting ride. I felt for the TL’s shocks. 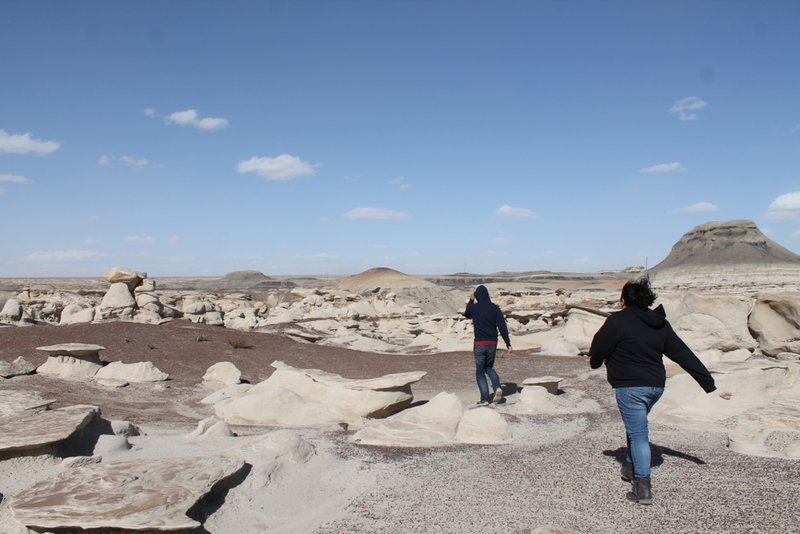 Rumor has it that the Navajo Tribe has gone to great lengths to keep the Bisti and nearby Chaco Canyon remote and not terribly easy to access. This is to minimize the amount of people entering and disturbing the land. I didn’t exactly take a defined path to this view point. 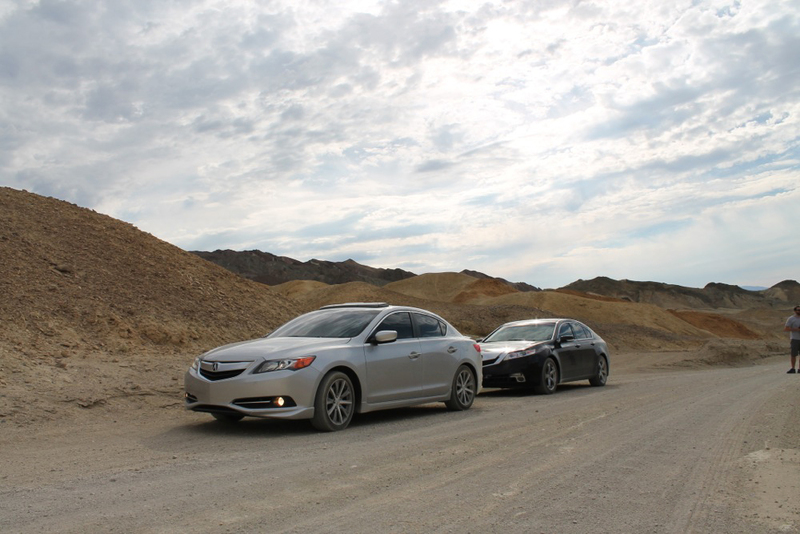 The AWD system handled the sand just fine though. This sure felt like a different planet. 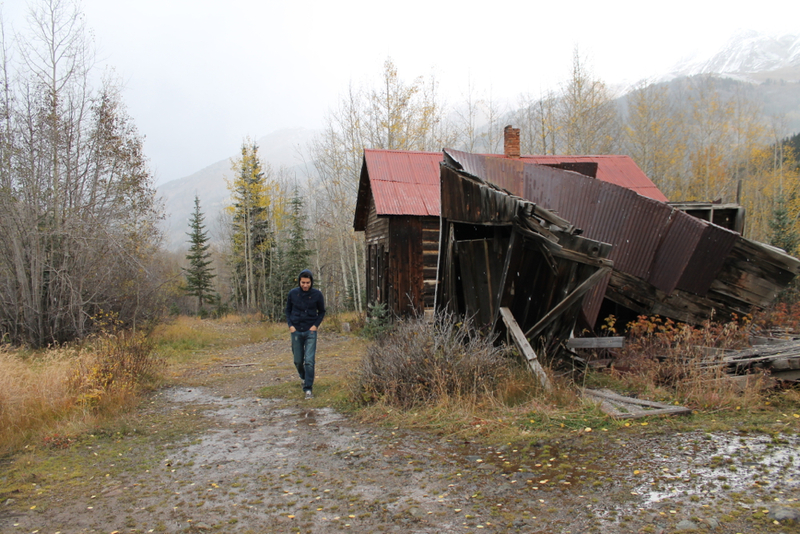 Despite the wind gusts of 50mph, we set out for some photos and exploring. Alec was going crazy taking pictures in every angle he could. 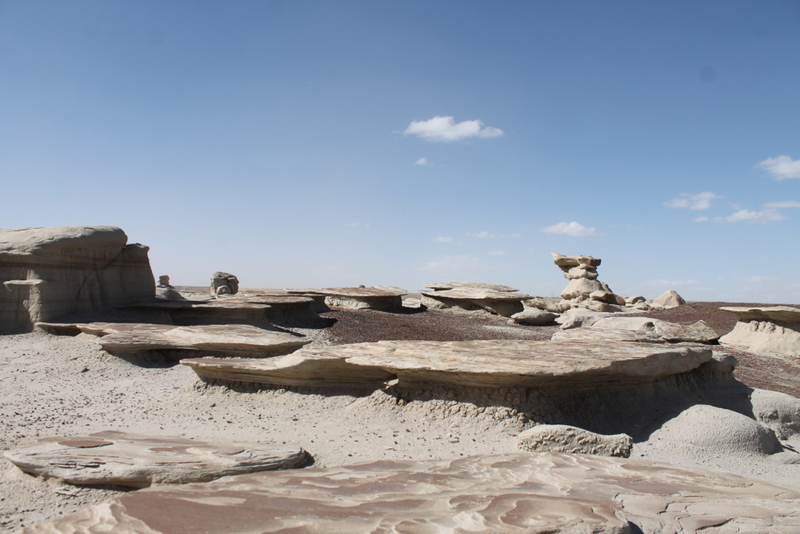 The Bisti was once a riverine delta that was west of the shore of an ancient sea. 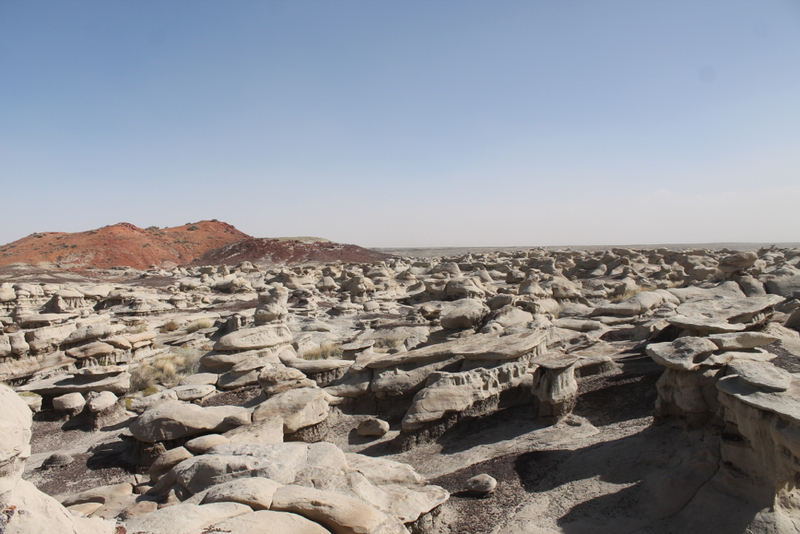 This sea covered much of New Mexico 70 million years ago. The waters of this sea washed a lot of sediment upon the shore and then swamps and the occasional pond bordering the stream left behind these large buildups of organic material and odd formations. Amazing! There’s only so much wind you can take. We soon hustled back to the TL and began our journey home. That’s a wrap for this trip…thank you all for joining us for this grand adventure. More in store for you very soon! 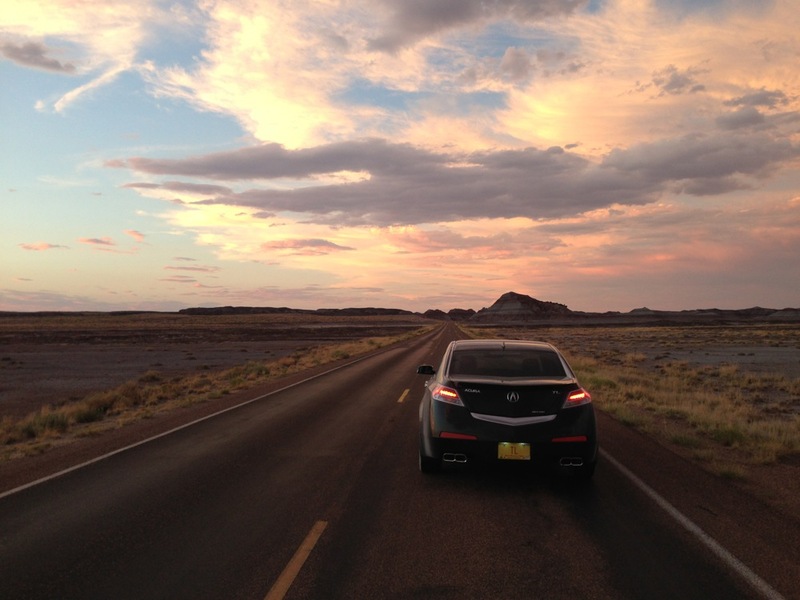 Nothing beats a nice weekend getaway. 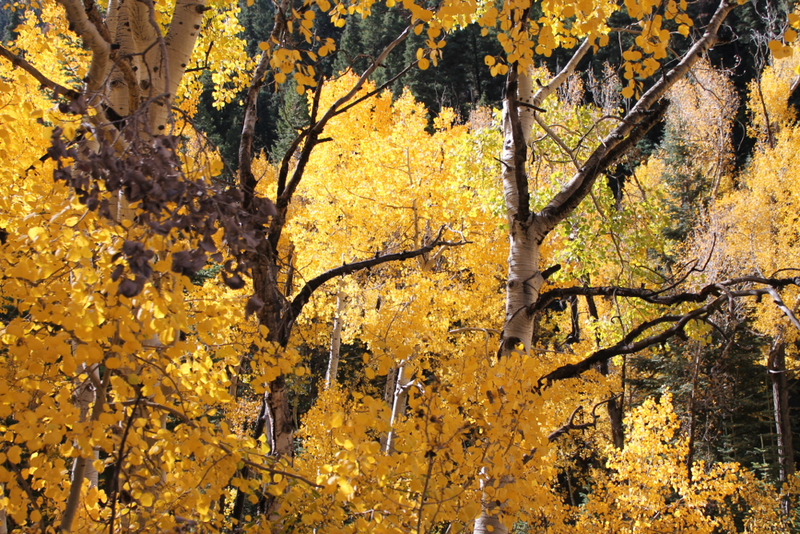 Especially when you’re growing bored of the sunny, dry climate of southern New Mexico and want to see some cool fall colors. 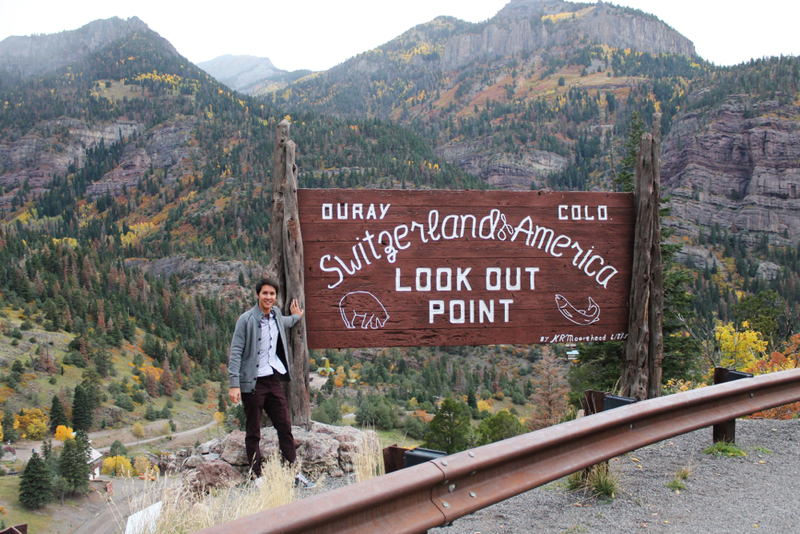 So, friends Jouhl, Jennifer and Alec all climbed into the TL and joined me in one of my bucket-list destinations: Ouray, Colorado. Let the miles pile on! 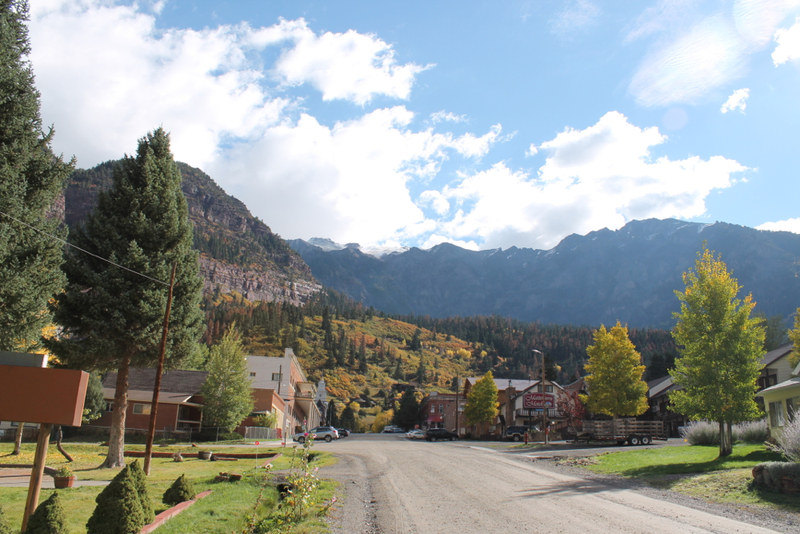 Nestled in the San Juan mountains north of Durango, Ouray was once a silver and gold mining town. Population isn’t much…just about 1,000 according to the 2010 census. 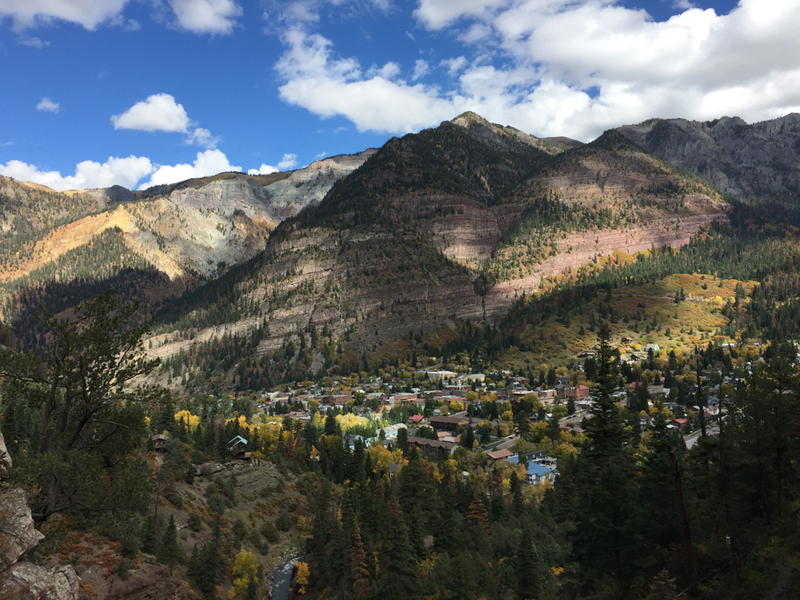 It was named after Chief Ouray of the Utes, a Native American tribe and it’s best known for the extensive scenery that’s gorgeous in all seasons. 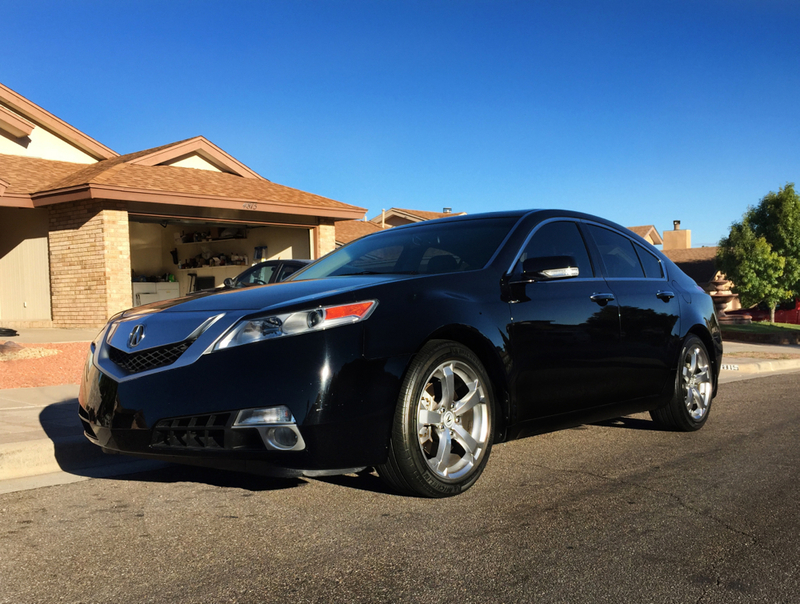 Got the TL all washed up and ready to roll. 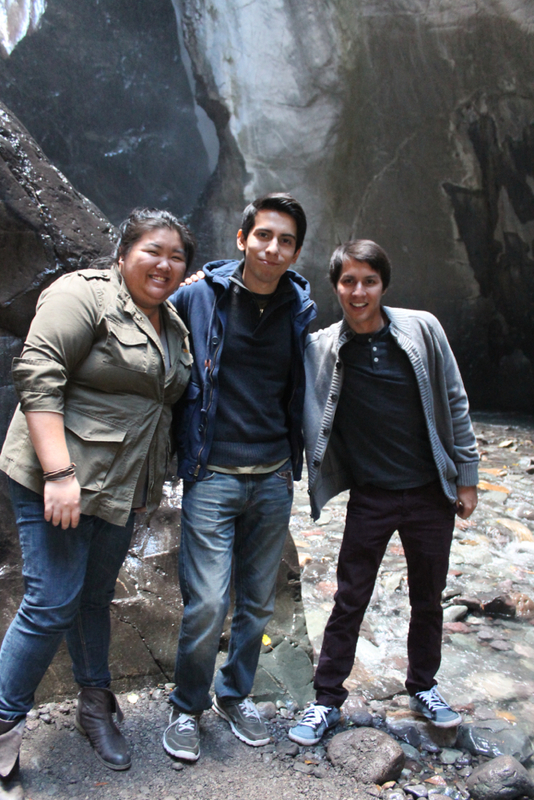 From left to right: Jouhl, Jennifer and Alec. Jennifer and Alec had never been to Colorado so this was going to be quite a treat for them. 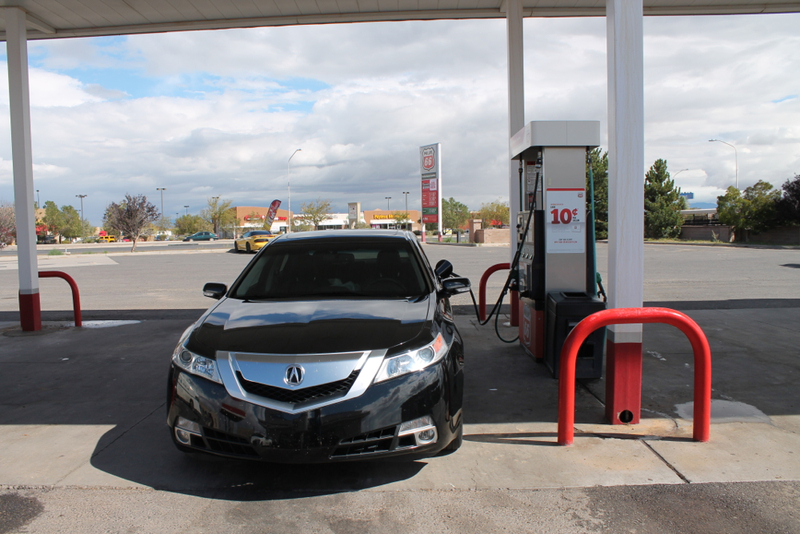 Gas stop in Los Lunas before going through Albuquerque. 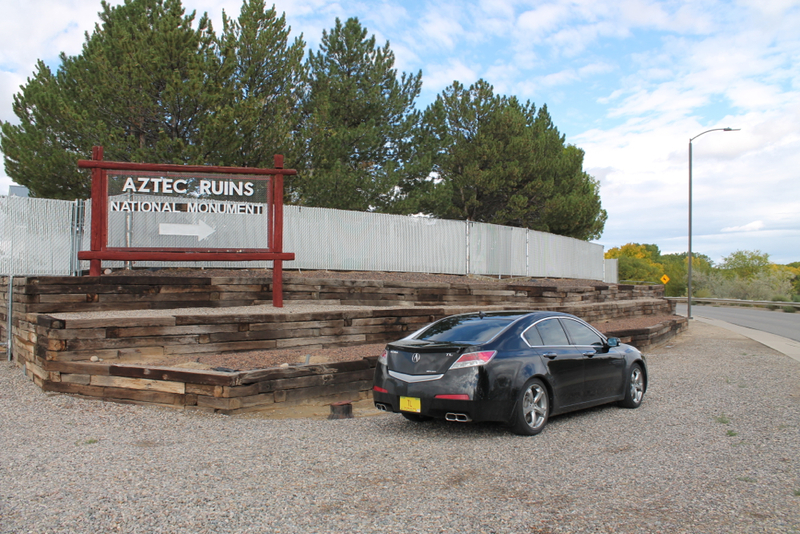 First official stop was in Aztec, NM where we’d check out the Aztec Ruins National Monument. 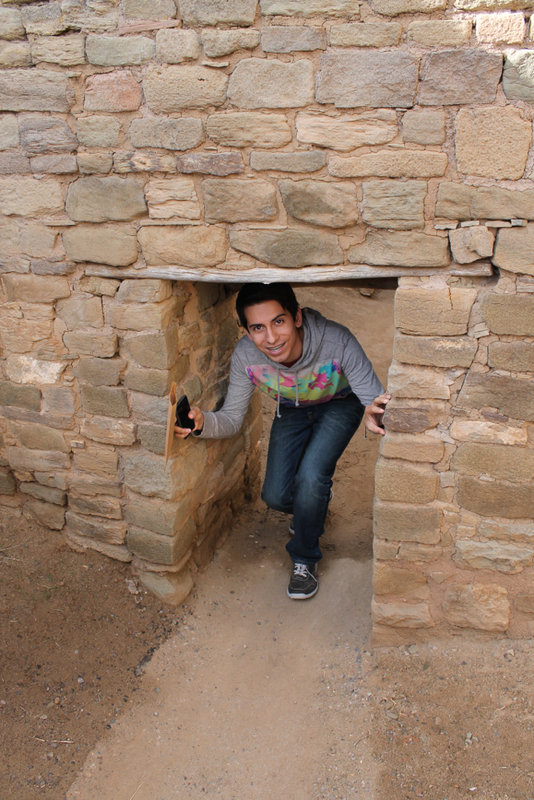 Contrary to the name, these were built and inhabited by the Pueblo Indians. 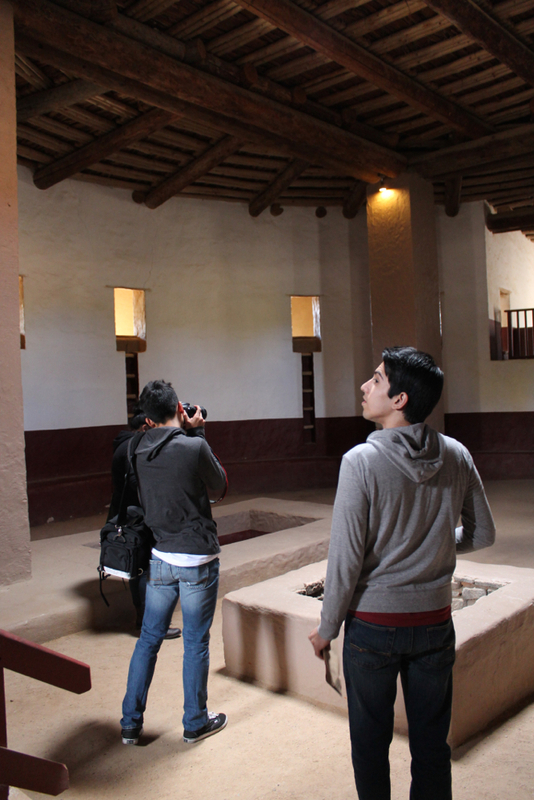 The dwellings date back to 11th century and most are in their original, unrestored state. Always have to prep the cameras! 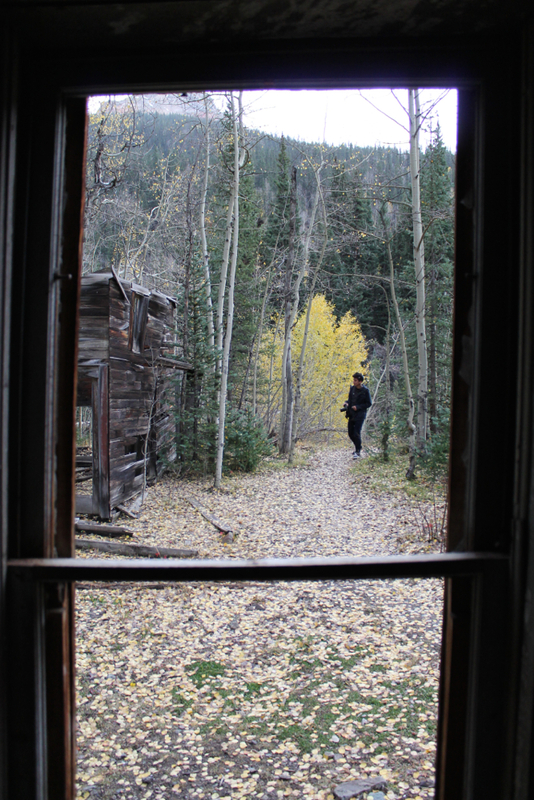 One of the coolest parts is we actually get to explore within the ruins. Here’s Jouhl crouching down to enter the small doorway. 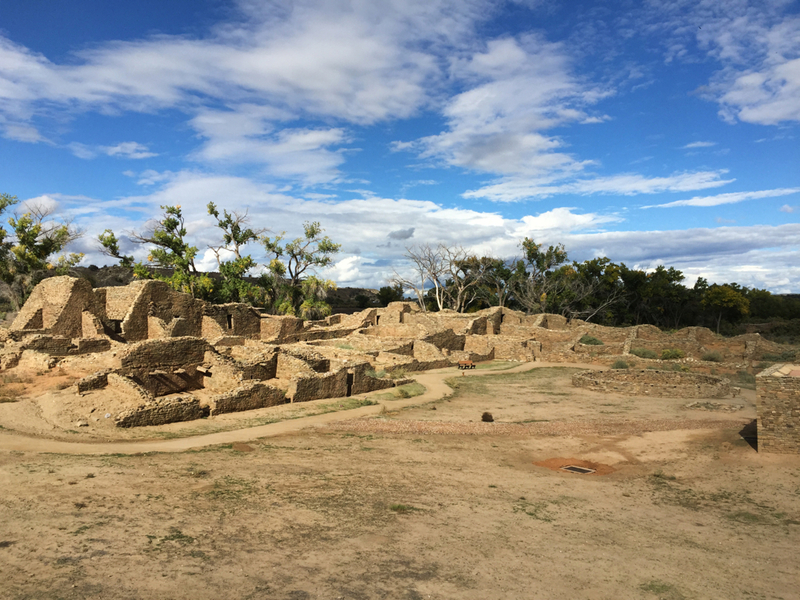 Here’s an overview of the ruins. Looks like a video game. No time to waste. 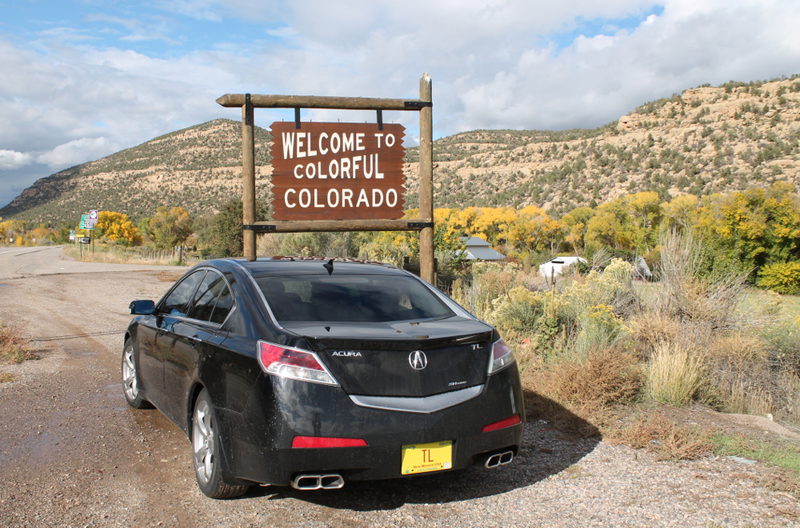 Back on the road towards Colorado. Clouds formed and threw a few rain drops our way. Just enough to get the TL nice and spotty. 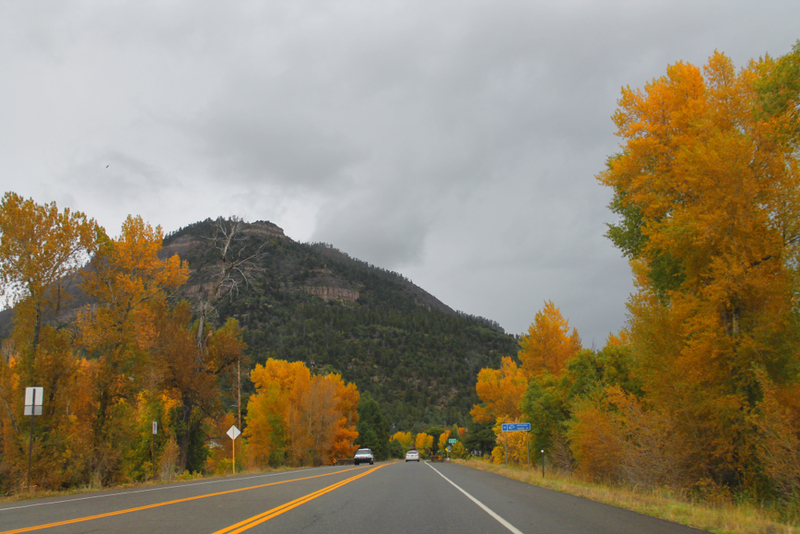 Almost immediately, we started to see the fall colors. Man, I miss seeing this! 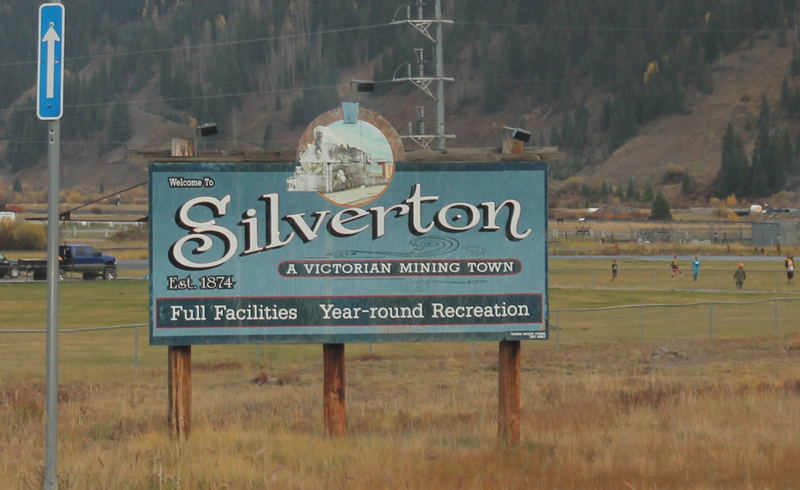 The long, winding US 550 took us past the small mining town of Silverton, CO. And when I say small, I mean it as there are a total of 530 residents here. (2010 census) It was raining pretty good by now, so we opted to just take a short drive through instead of getting out and walking around. (Well, I did have to sneak out for a quick photo of the TL. Now, one of the best parts of the trip is about to begin. 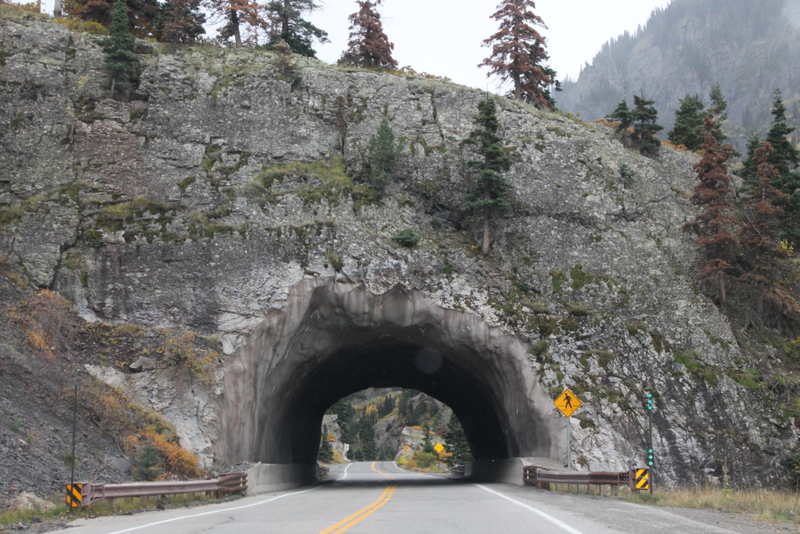 We now were on the “Million Dollar Highway.” Many refer to this as one of America’s greatest driving roads for its scenery and smooth twisty nature. In fact, it was so twisty that I didn’t have many opportunities to pull off for photos. This is one of the money shots of the trip. The temperature was dropping pretty quickly to the low 40s, so jackets were in order. The rain kept coming down, but in moderation. It was such a grand experience. 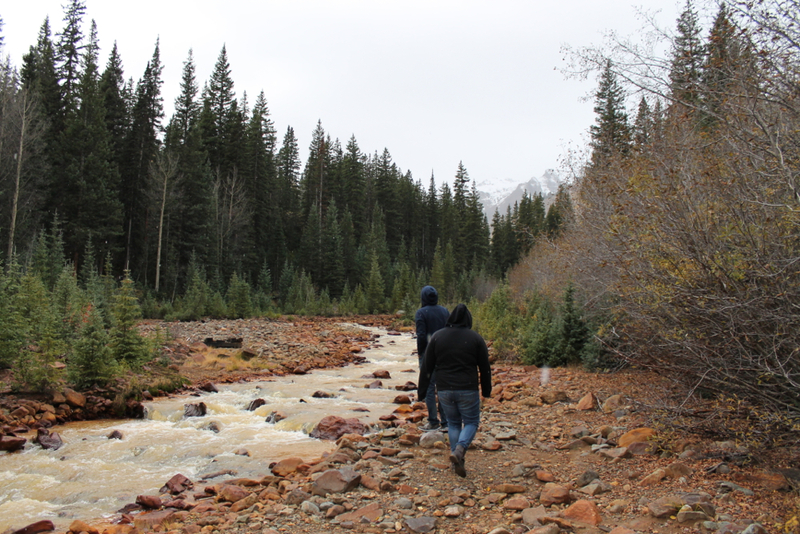 As we ascended in elevation, we could see the rain was turning into snow at the surrounding peaks. Here’s a cool “selfie” Jouhl took of us. Darkness was approaching and this was the last photo of the drive today. 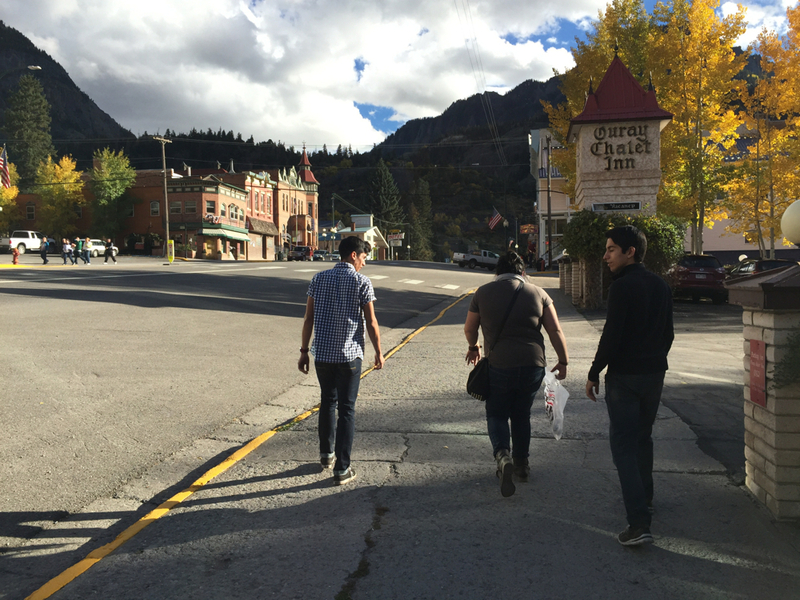 We got into Ouray fairly late around 8pm and we wasted no time to grab some dinner. 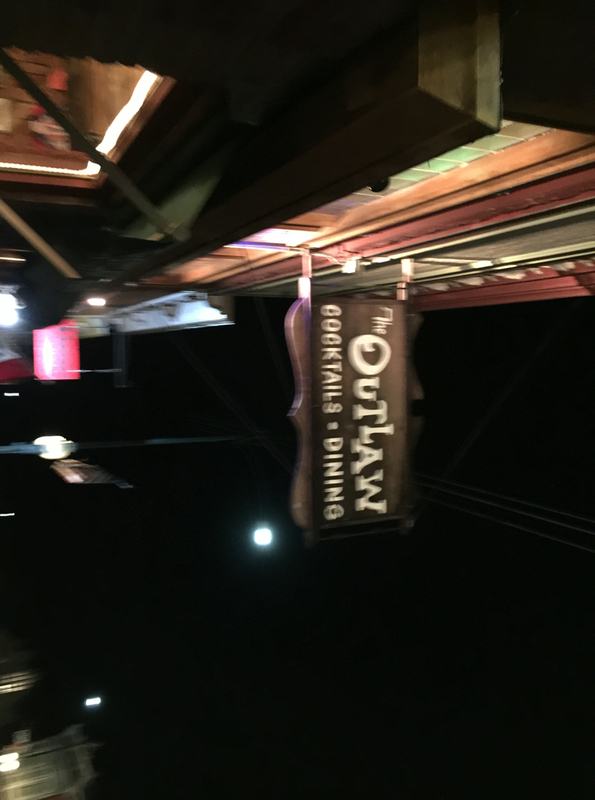 Our place of choice, The Outlaws. 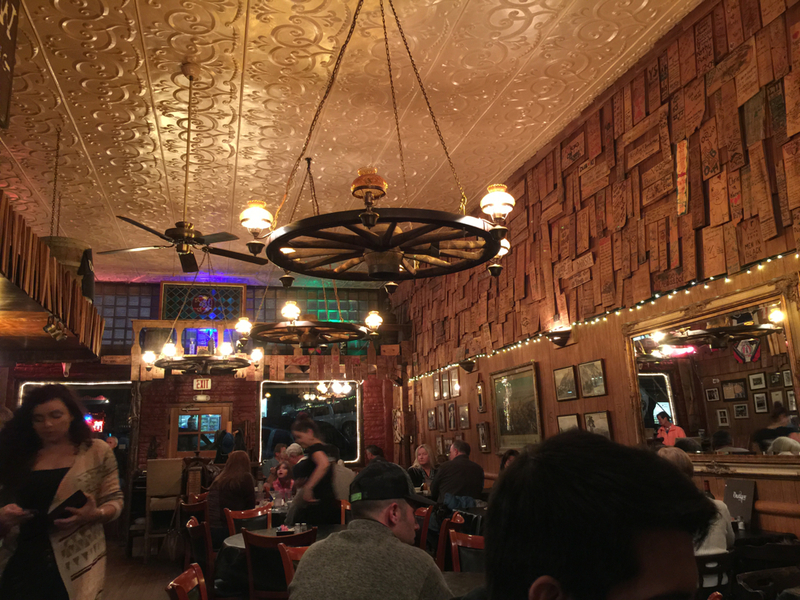 Folks were friendly, restaurant very hospitable, and atmosphere inviting. Food however, was disappointing. Regardless, we had fun. The next day was going to be full of outdoor fun. 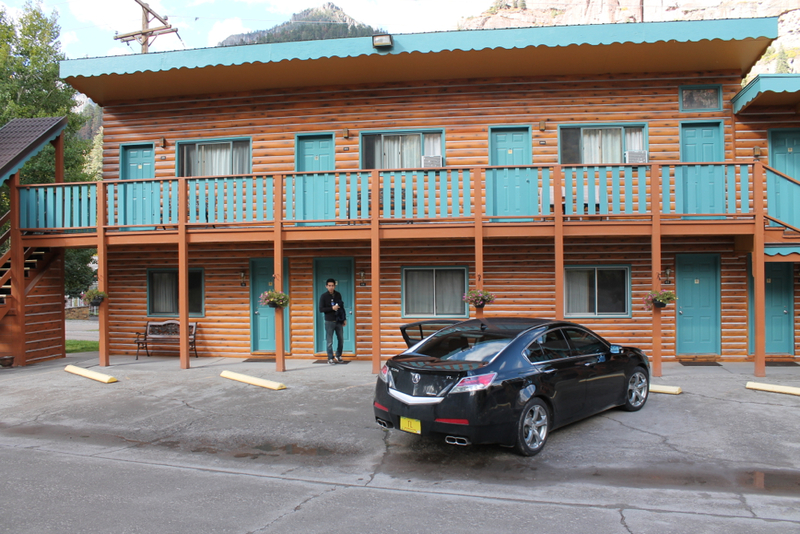 Here’s a shot of the hotel where we stayed. 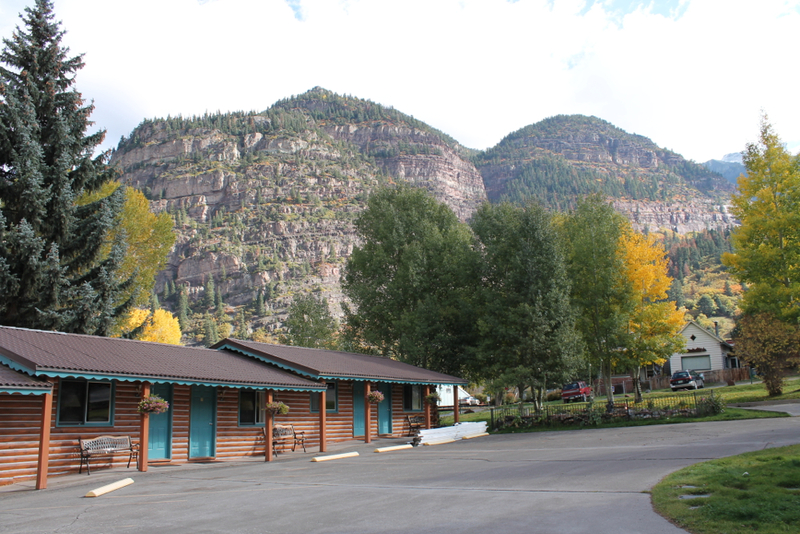 We caught the end of the tourism season, and the hotel was actually going to shut down for winter the following day. Yup, we were a few of the last guests of 2014. After a quick breakfast in the lobby, I wanted to drive around and see what we couldn’t the night before. 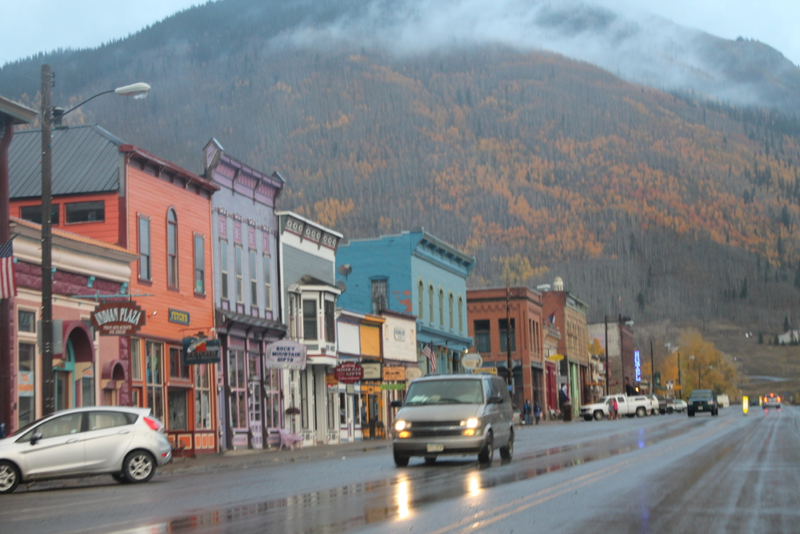 Here’s downtown Ouray. Most of my “short-drive-around-town” moments end up taking half the day and in some of the most remote and interesting places. Today was no exception and luckily the gang loved it. I found this cool looking road leading into the forest. I just kept going and going. 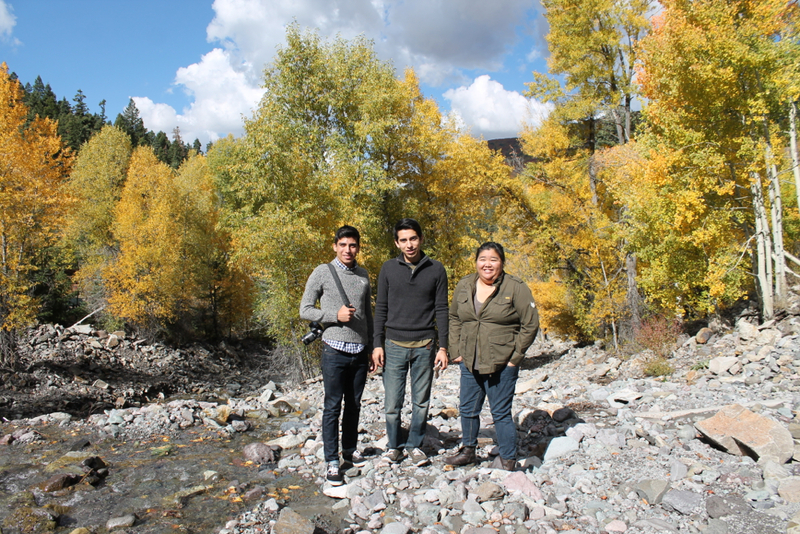 The fall colors were so beautiful. The road came to an end (well at least for us in the low slung TL). 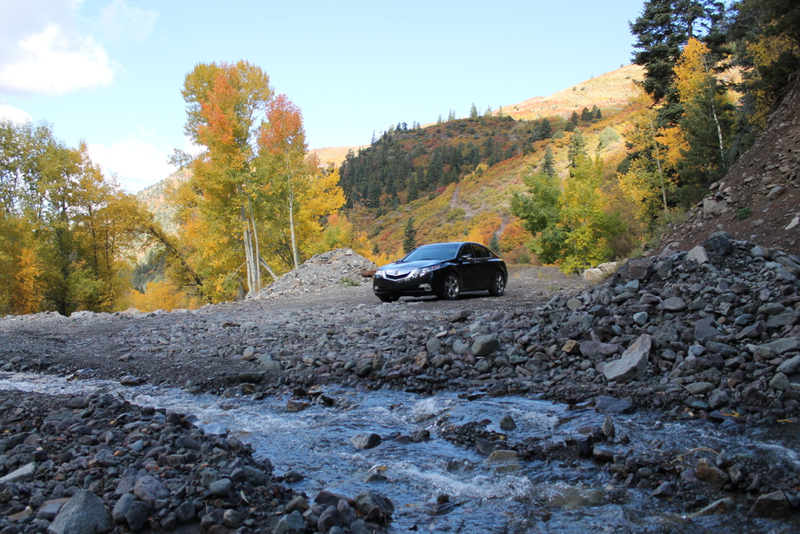 A higher vehicle could easily cross the creek and keep on going. 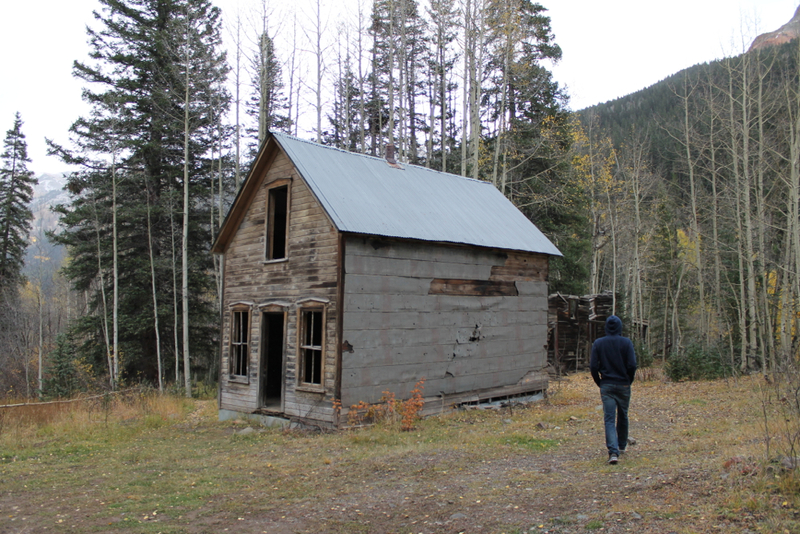 We got out and just randomly walked around exploring the area. No joke here: this is where I was meant to be. Yup, that’s one happy Jason. 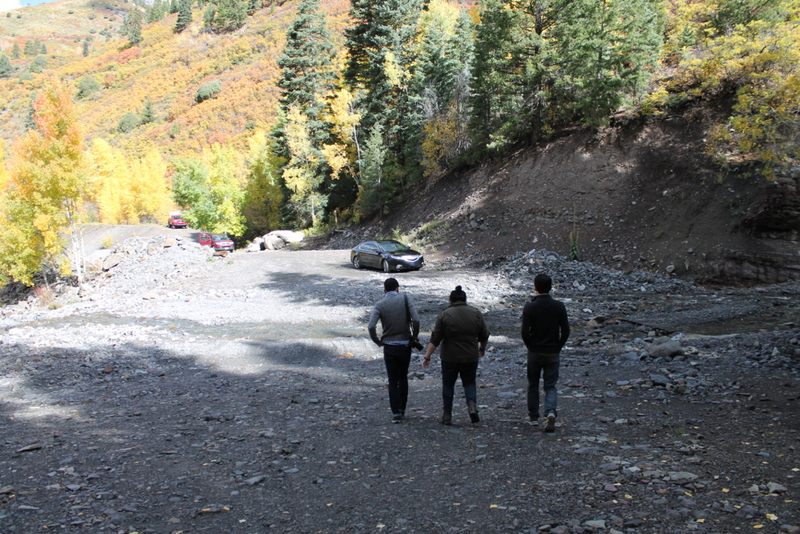 We found a hiking trail, and ran with that for a while. 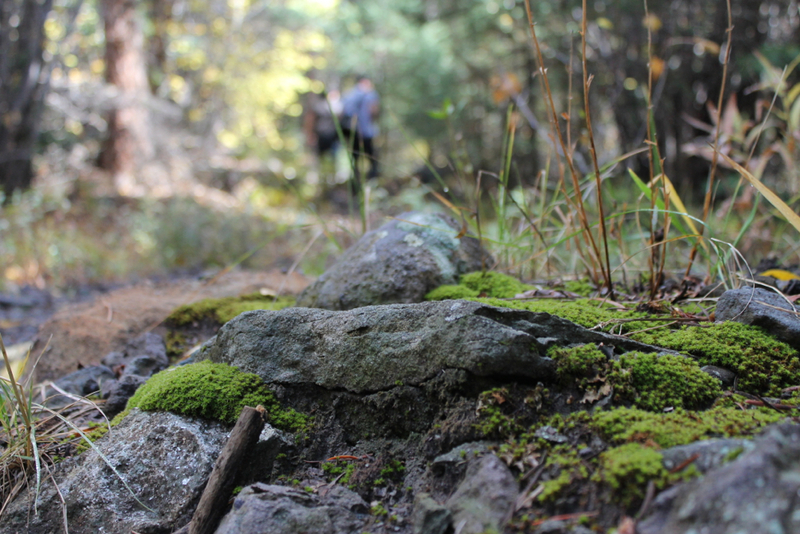 The moss covered rocks caught my attention. This is another of my favorite shots. Wait, did I make a wrong turn? How did I drive to Switzerland? The road back down the mountain had an awesome view of the town. 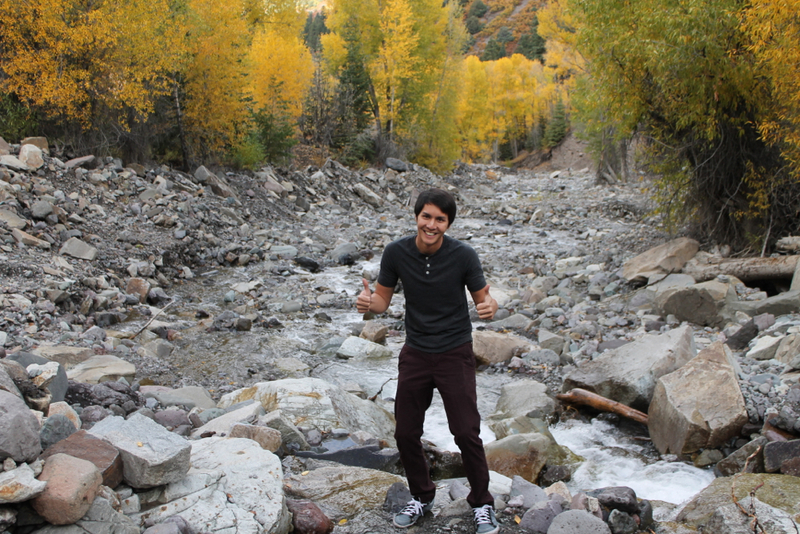 Next on my list was Box Canyon Falls. 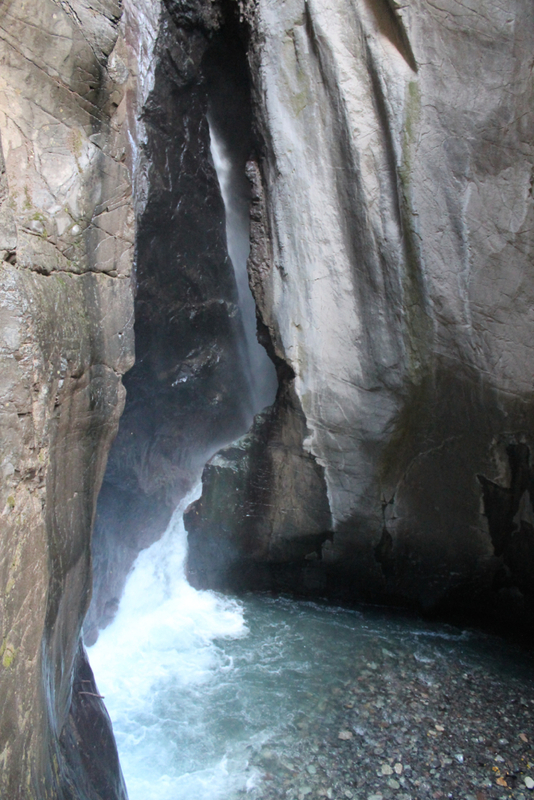 The canyon was formed by the vicious rushing waters of Canyon Creek. 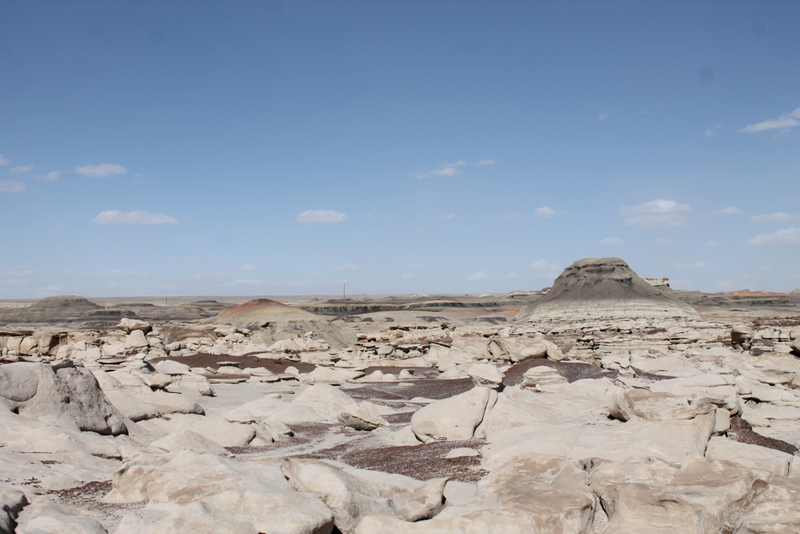 Over time, they formed a deep and narrow box canyon. 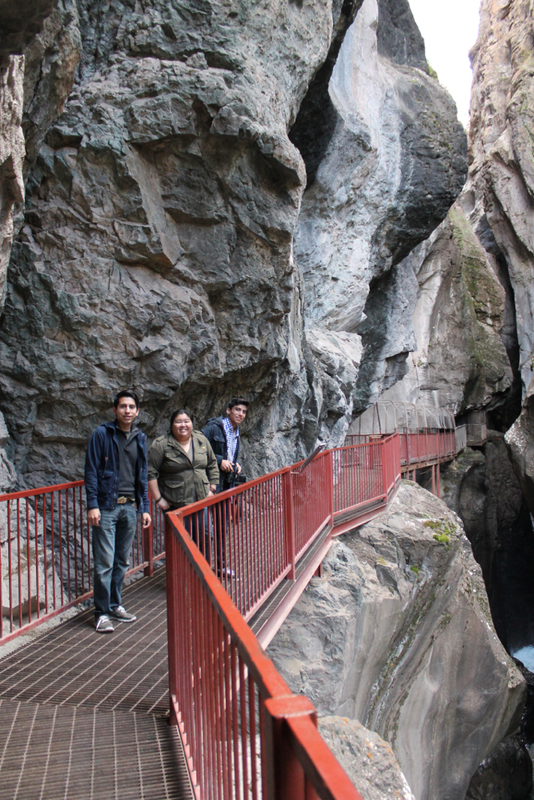 Here we are walking to the falls. The falls were actually somewhat hidden, but they sure made a lot of noise and mist. Next we checked out the Perimeter Trail which leads to some more breathtaking views of the town. This is scariest and most dangerous part that has taken lives. 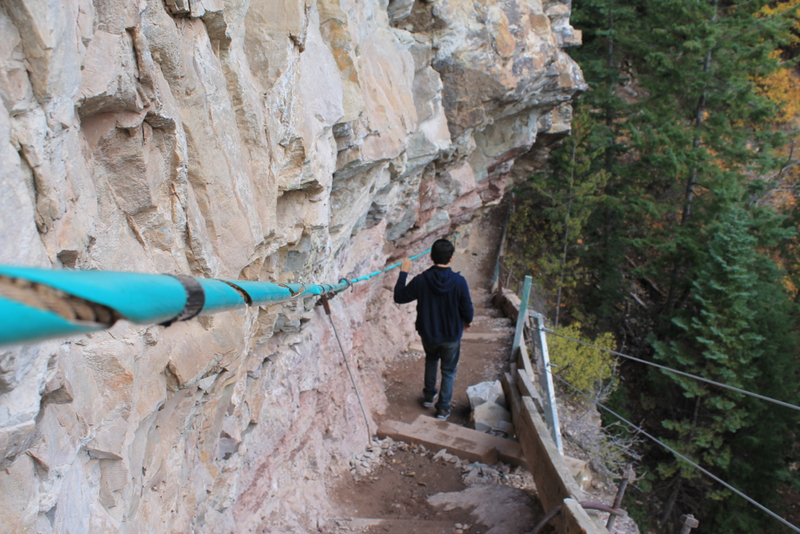 You hike along a narrow trail carved into the side of the cliff with only a cable to hang on to. Now on to browsing the shops! 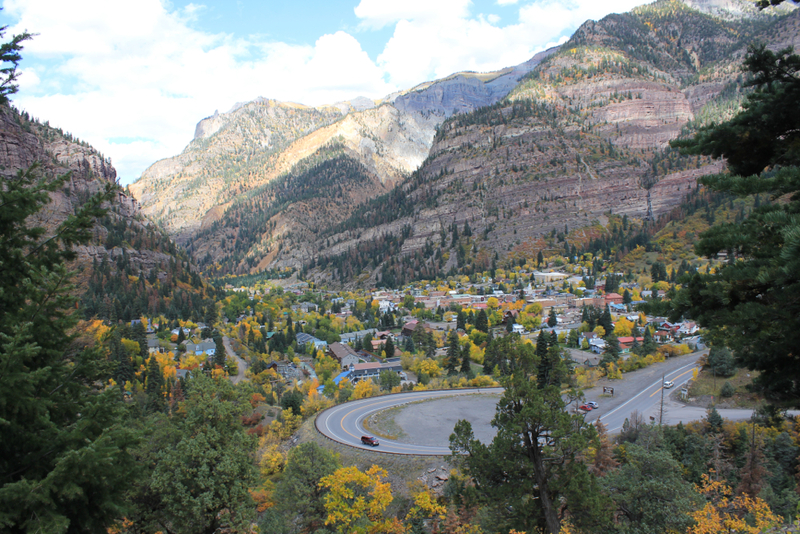 Ouray locals claim they are the Jeep capital of the world. Not sure how accurate that is, but there were indeed a lot of Jeeps around. 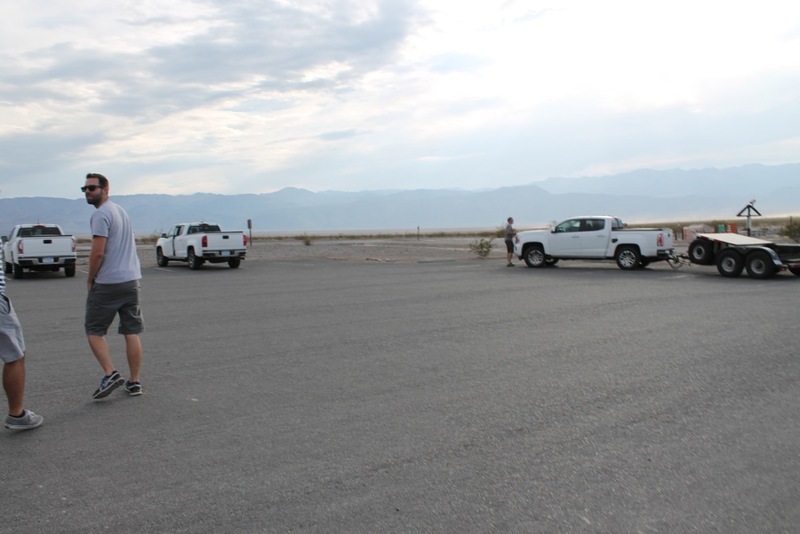 Many locals will even rent out their Jeeps. Never seen that before. Then we settled down in the Irish Pub for dinner. Our bodies were sore, tired and hungry. The food really hit the spot. 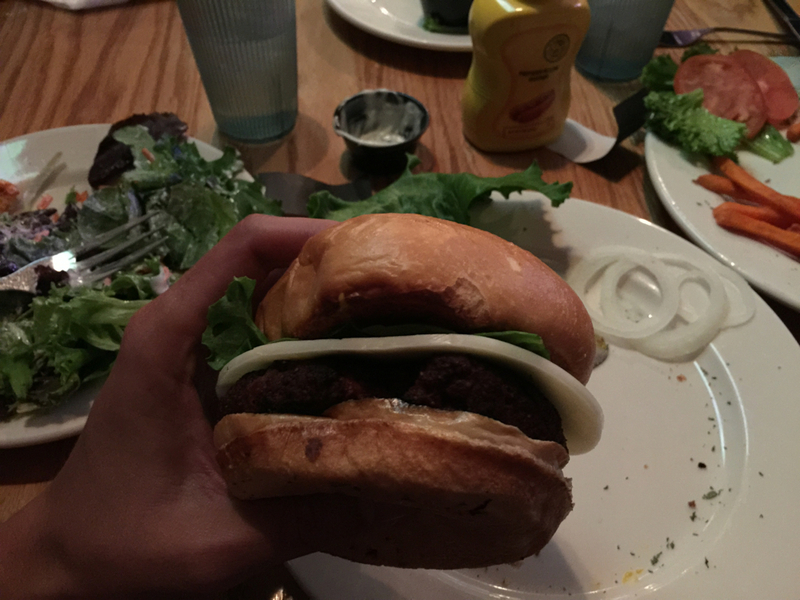 My burger had bacon mixed in the patty and to make an already great burger better, Jennifer order some Guinness based BBQ sauce. Oh man, meat lovers rejoice! Okay, maybe I’m exaggerating a bit for the title of this post, but I was excited to share such a grand trip with you all. 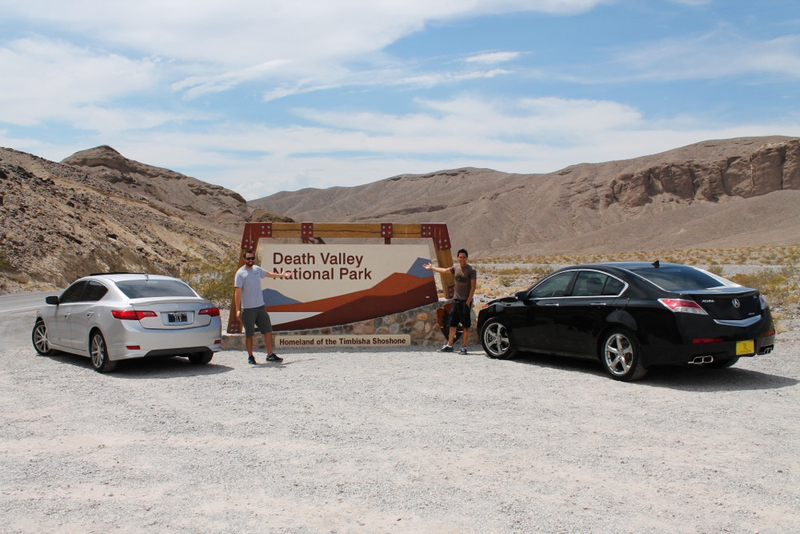 That grand trip was an 1800-mile drive to Death Valley National Park with my friends, Tyson Hugie from DrivetoFive, Sofyan Bey from 2theRedline and Tyson’s friend Peter Kulikowski. 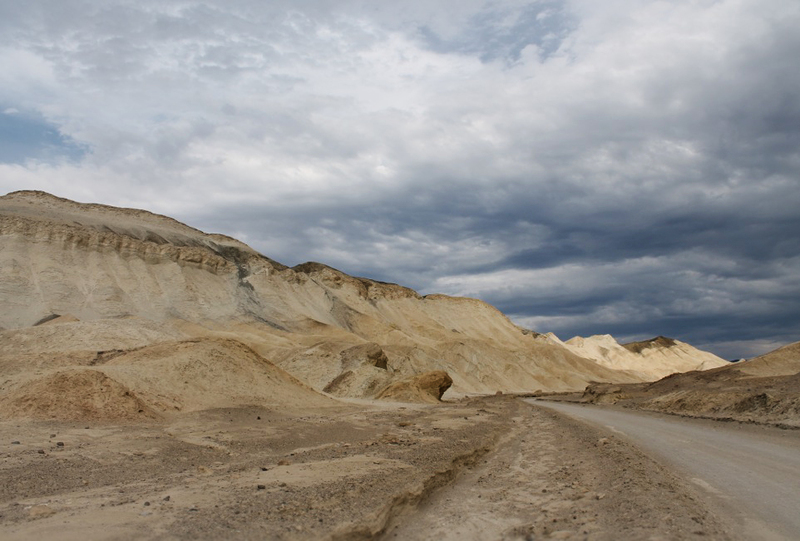 Death Valley is a desert valley in the eastern portion of California’s Mojave Desert. 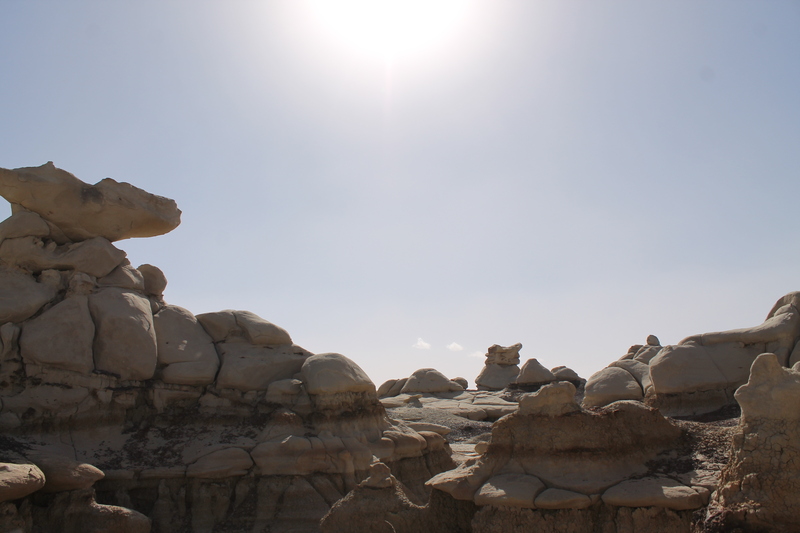 This is the lowest, driest and hottest area in North America. 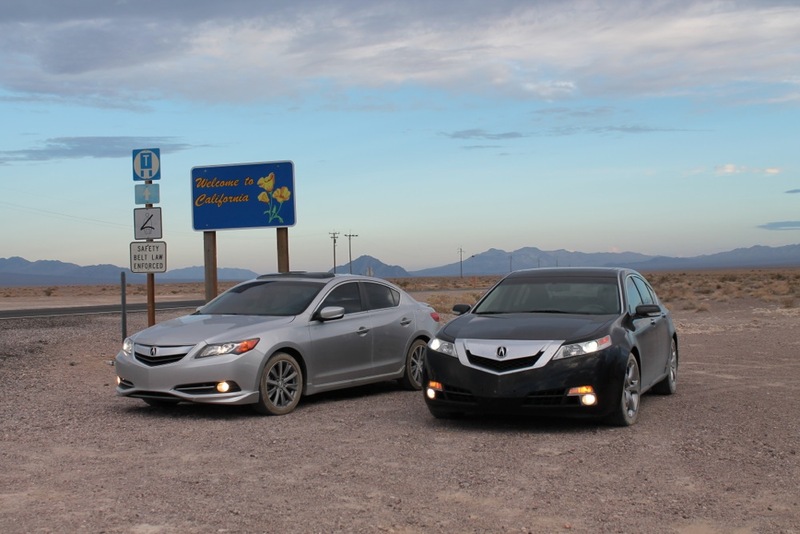 We had this trip planned for some time now and wanted give our Acuras a good run for their money. Mine especially considering it’s the middle of July, and I’m rocking Crystal Black Pearl over black leather. 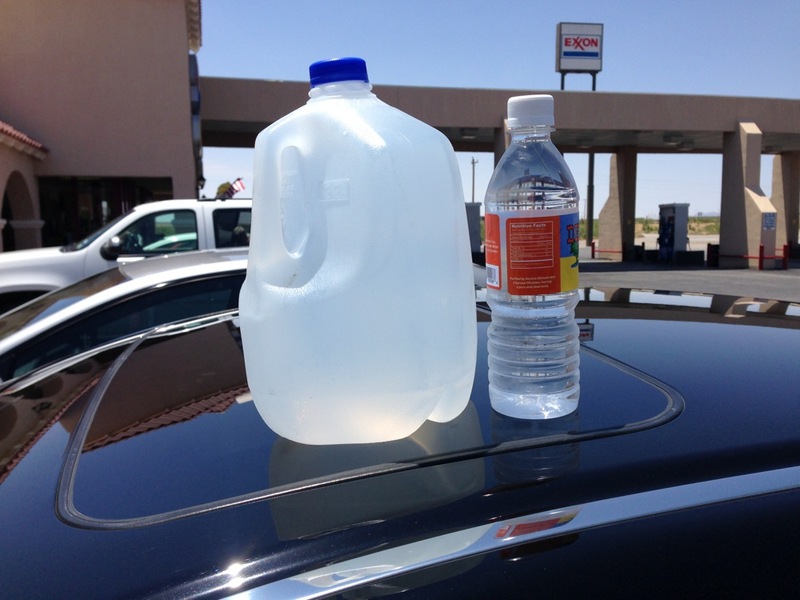 Good combo for an area known to have temperatures soaring well over 100˙F in the summer months. The record high in July 1913 was a scorching 134˙F! 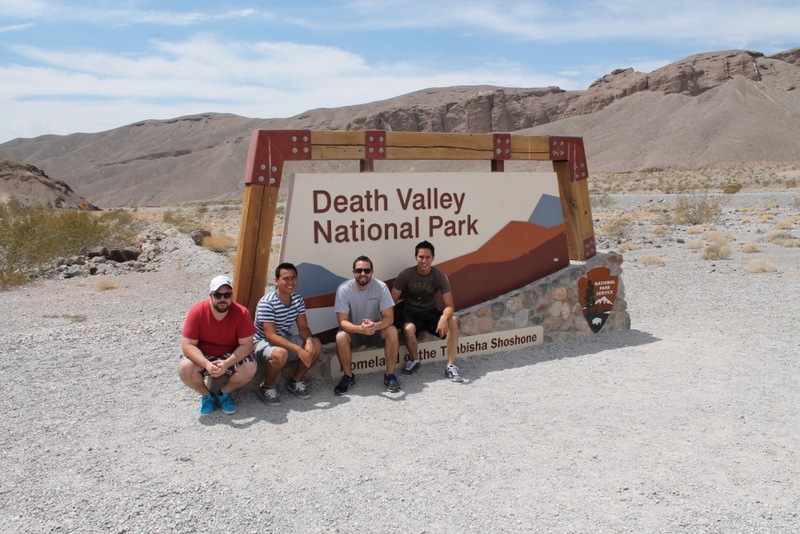 Within the park, we visited Badwater Basin (this is the lowest point in North America at 282ft BELOW sea level), Furnace Creek and Stovepipe Wells. Get ready, this is going to be a hot one! 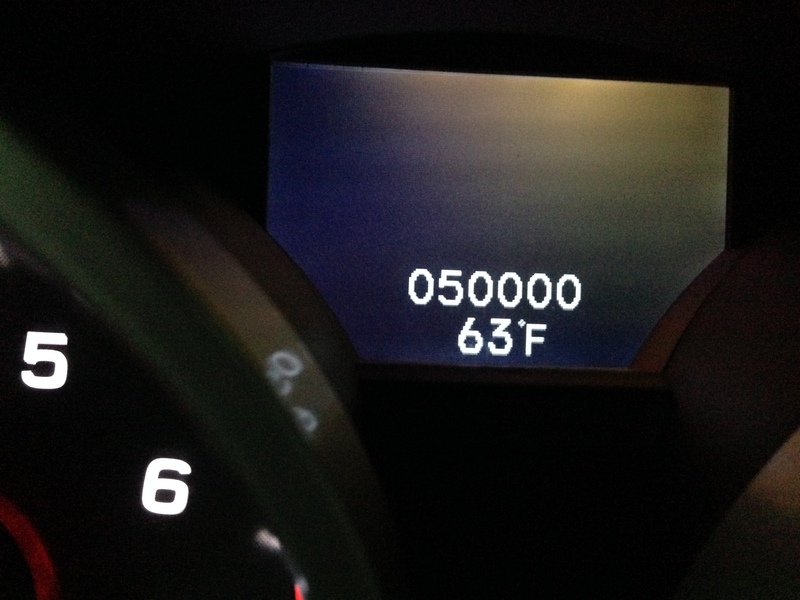 I officially hit 50,000 miles on July 1st. Only half way now to the big 100K! After coming home from my East Coast trip, I found my custom plate in the mail which I had been waiting for about 3 months! 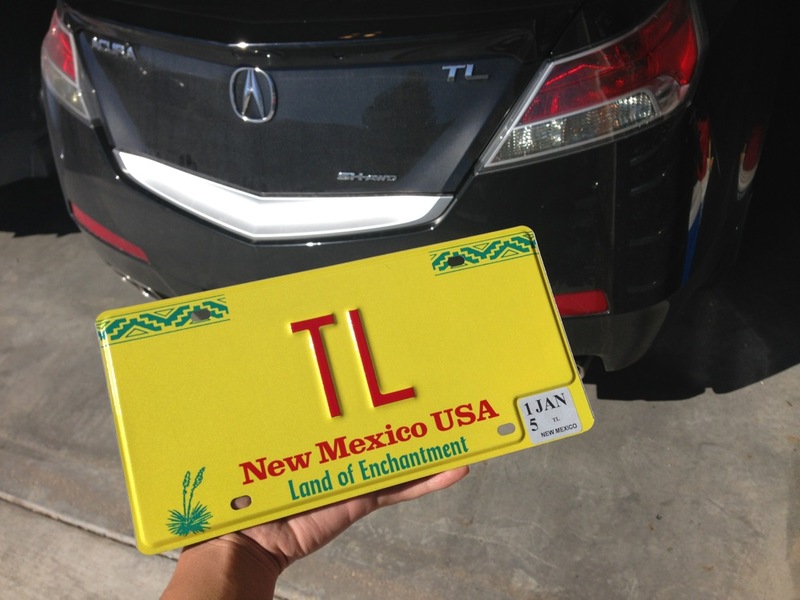 In New Mexico, our plates are rather bright. 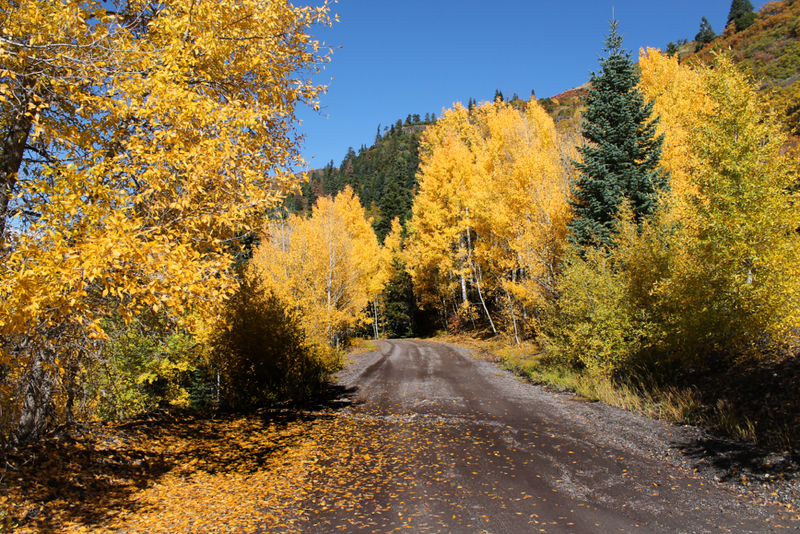 I had two choices: the Centennial bright green or this traditional New Mexico yellow. I obviously went the traditional route. Now, let’s get a move on with the trip. 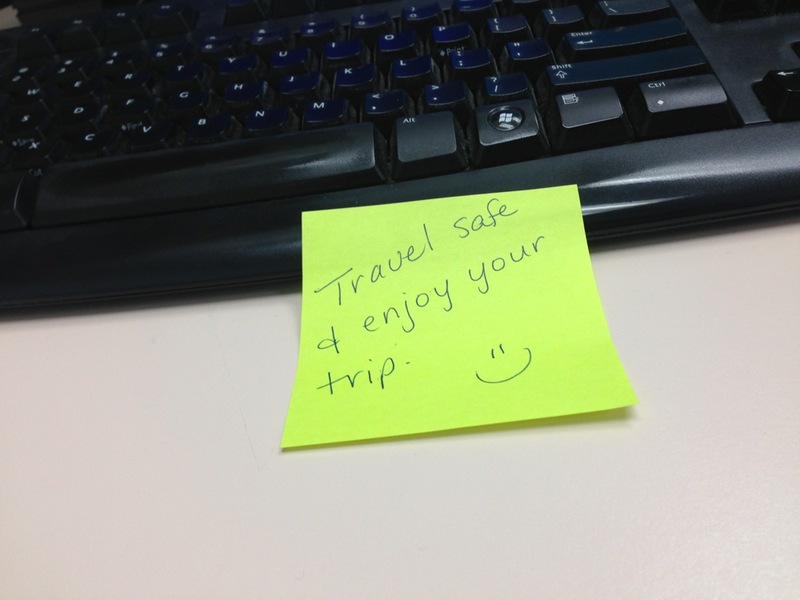 Before setting out Friday afternoon from work, one of my favorite co-workers left me a farewell “sticky” which made my day. I had the TL all washed up and packed. My general prep for the trip was making sure I had sufficient water. Side note: the sunroof is the ONLY surface I will set anything on. Otherwise, I don’t want to face the scratches on the paint that would arise. As the miles piled on, the day was ending. 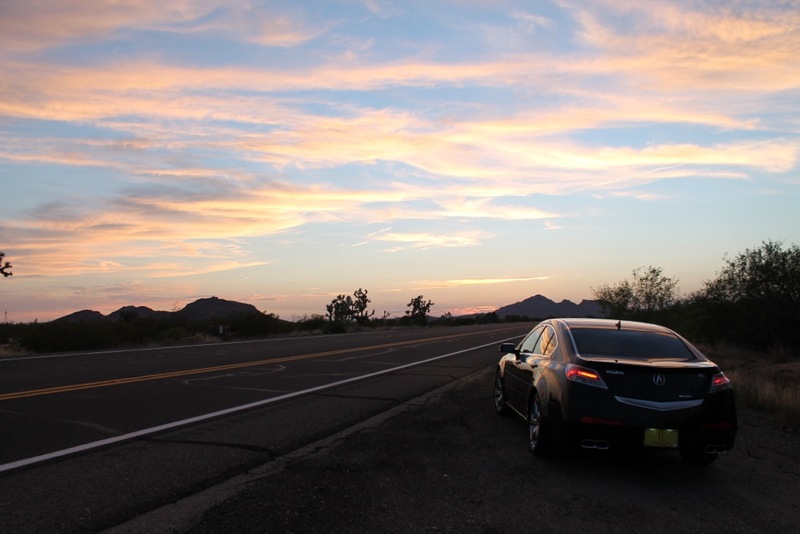 I had the privilege of being able to drive into the colorful, Arizona sunset. This is my favorite time of day to drive. 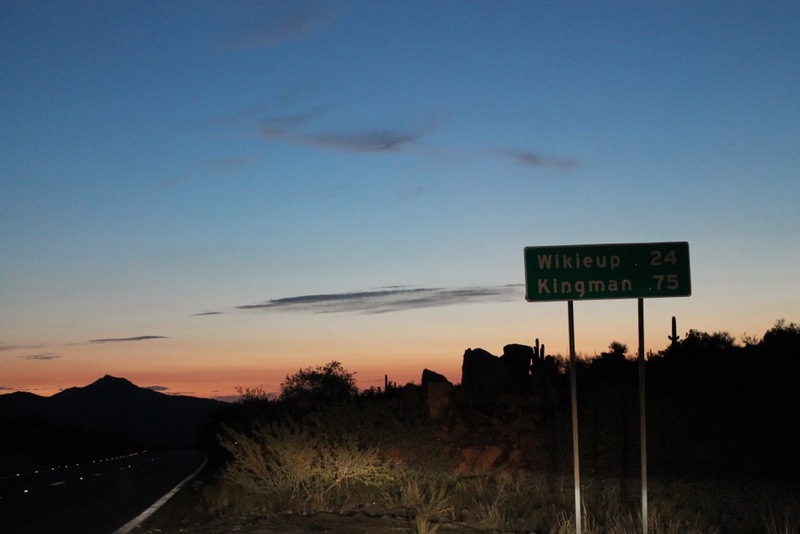 I drove to Kingman, AZ and got a good night’s rest for the adventures that awaited the next day. 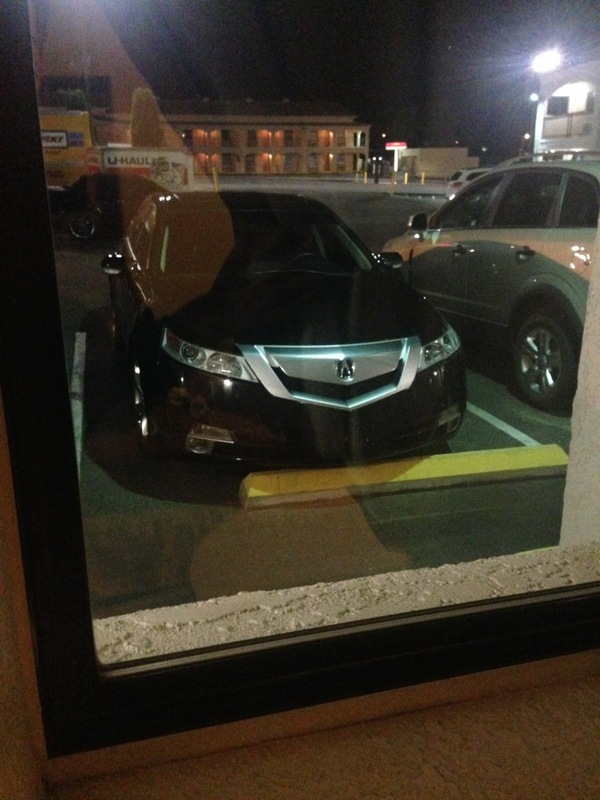 The modest Travelodge allowed for parking right in front. 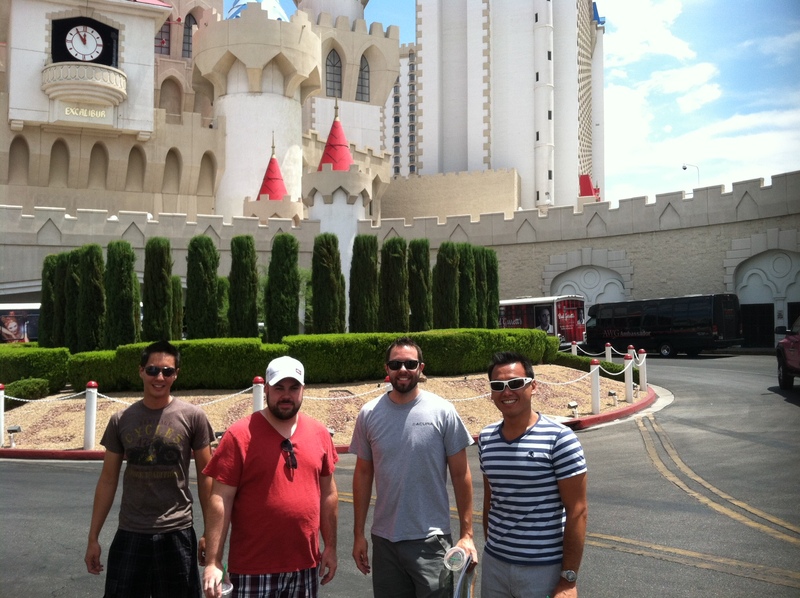 Next day, I made my first stop in Las Vegas, NV where I’d meet up with Tyson, Sofyan and Peter. 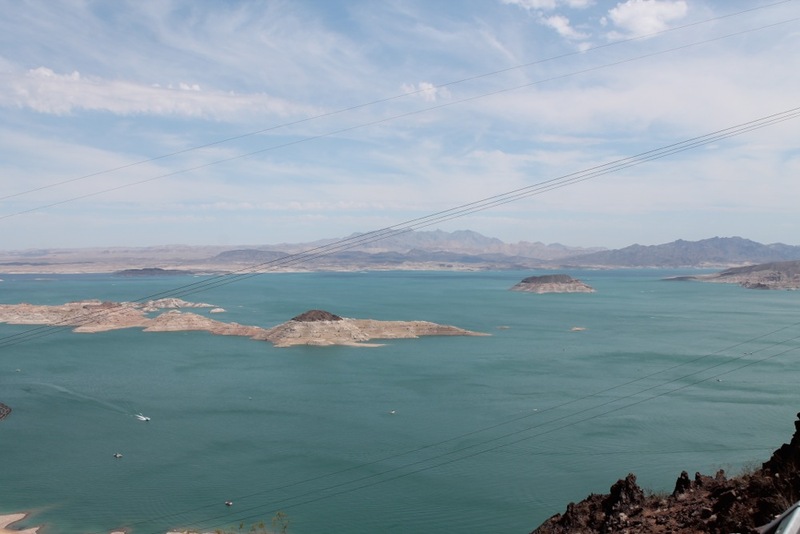 Another great pull out to view the mighty Lake Mead. After a few hours rolling down Hwy 93, I approached ‘Vegas! Here I am next to Peter, Tyson and Sofyan. 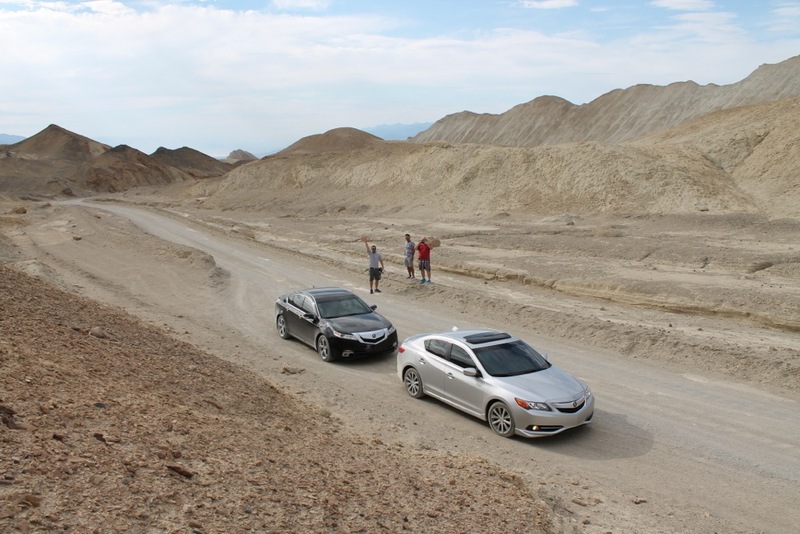 We wasted no time and hopped in our Acuras and Tyson led the way to Death Valley. 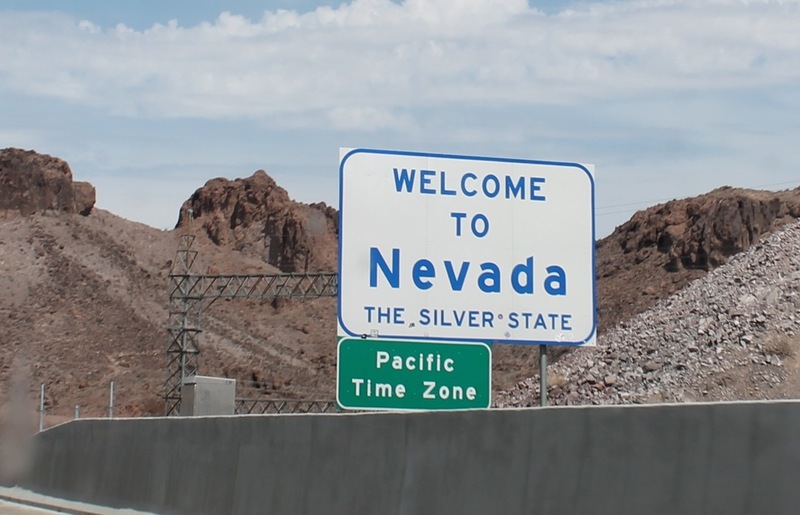 It was an easy 125 miles from Las Vegas. 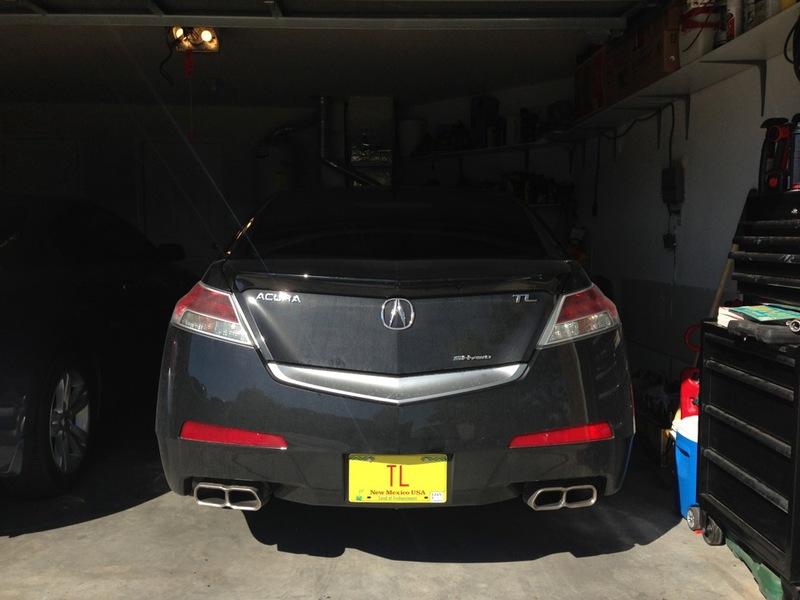 As usual, he was in his 2013 ILX 6-speed. 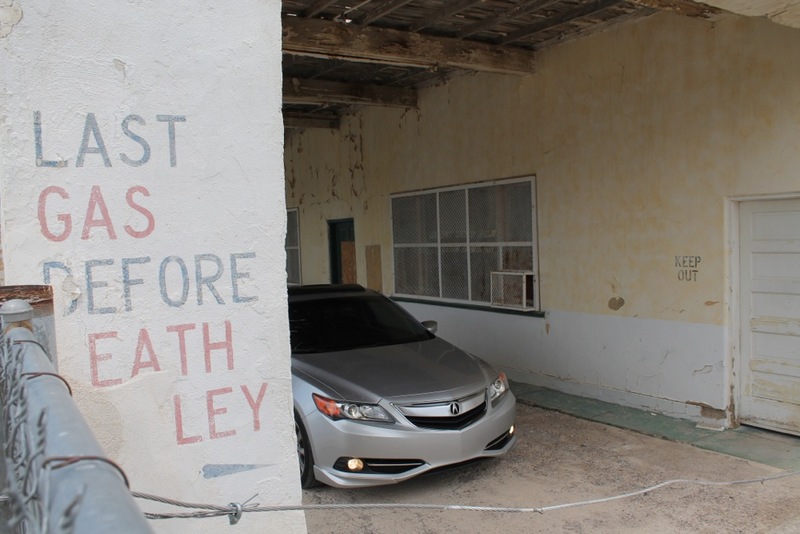 We made a quick stop in an abandoned Nevada town for a few pix. 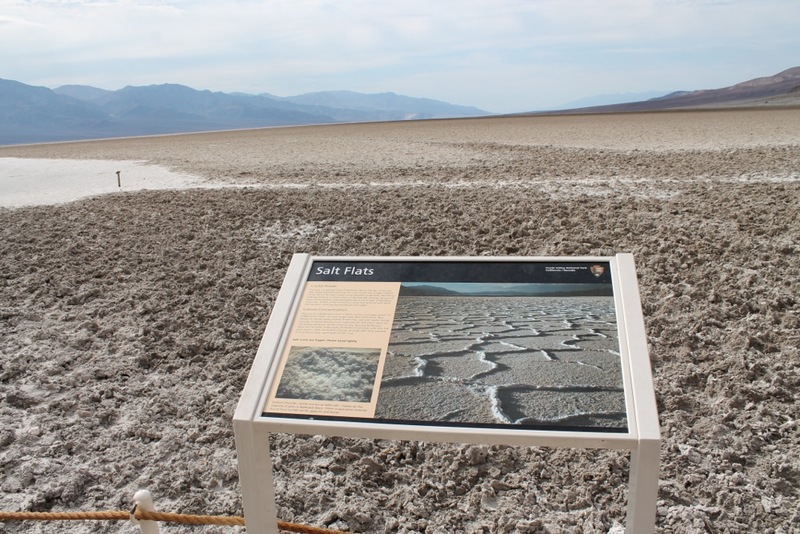 Next on the list, Furnace Creek in Death Valley. The heat was certainly a surprise. At this time, the TL had a reading of 110˙F. Here’s the sign notifiying us that we achieved sea level. 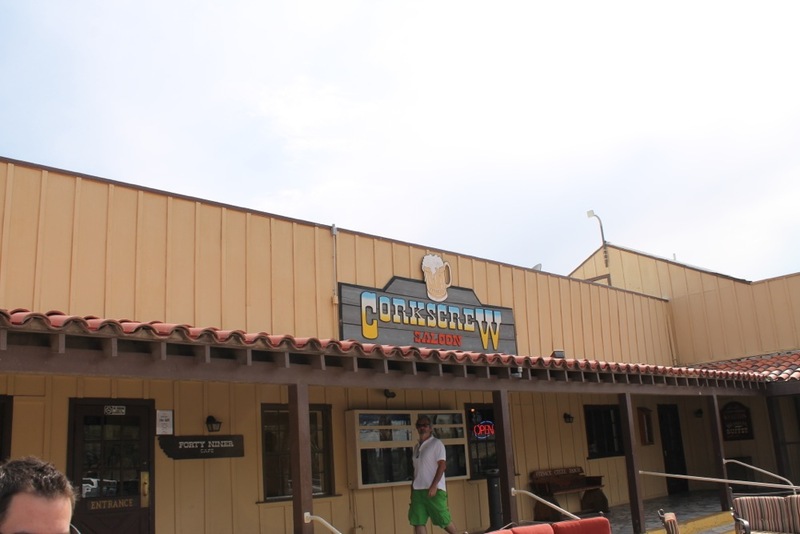 Next stop in the Park, Furnace Creek. 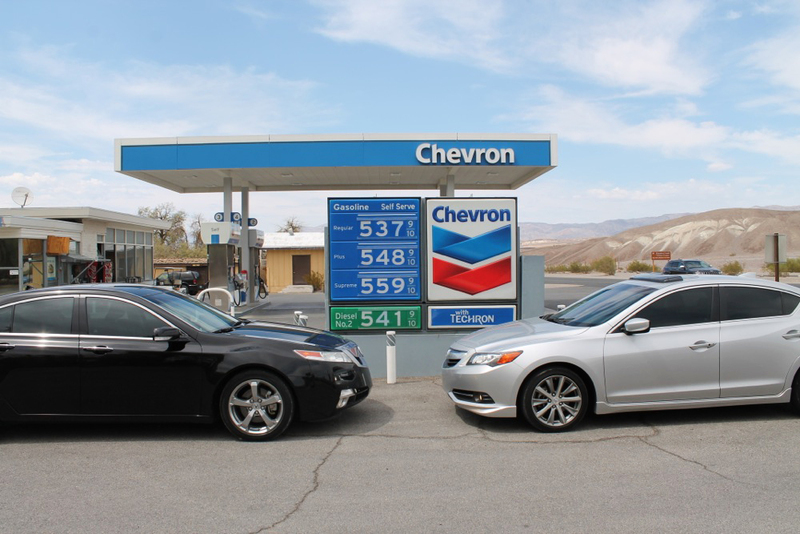 I got the shock of my life when Tyson showed us the norm gas prices in Furnace Creek. If I had the need to fill up, that would be a nice round $100 for premium. Ouch! Lunch was at a simple yet tasty cafe called the Corkscrew. Luckily, they had good air conditioning to relieve us of the heat. We stopped in the National Park’s Visitor Center. 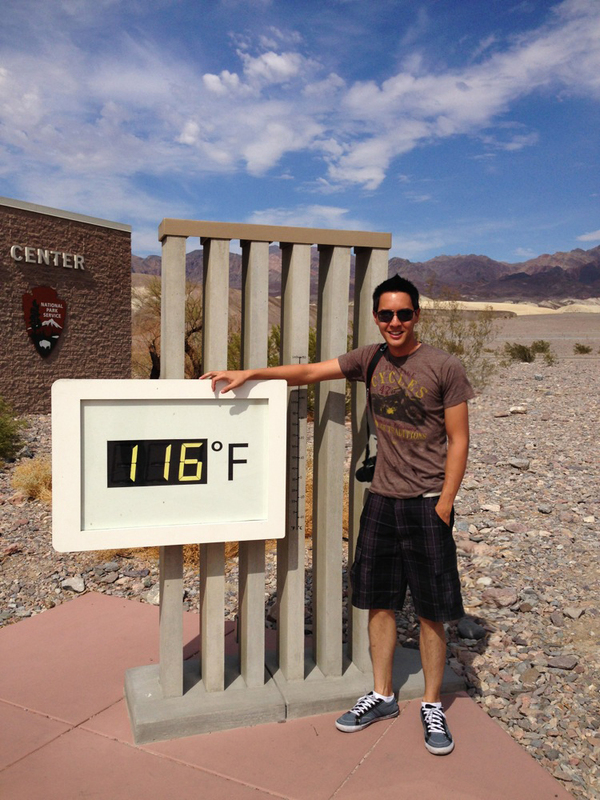 Here I am in front of their large thermometer reading 116! First sign you see when you walk in the doors. 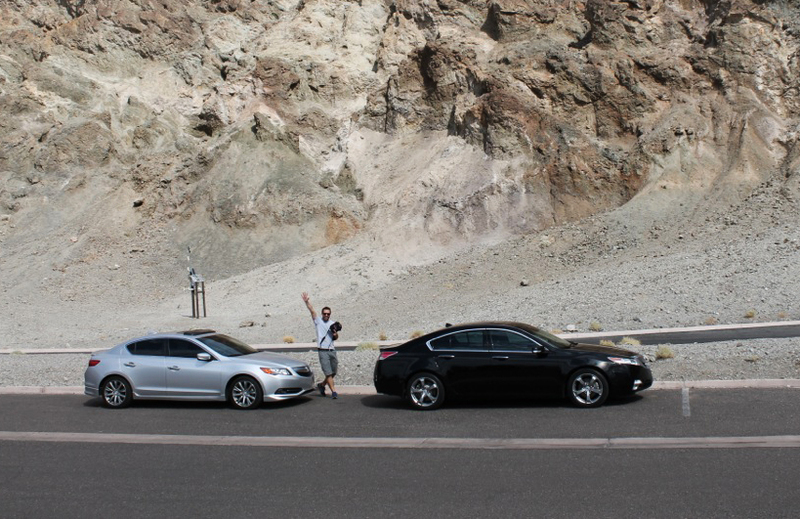 After that stop, we swapped cars and I took the reins of the ILX for while Tyson led the way in my TL to Badwater Basin. Always a cool feeling when I see my own car driving in front of me. 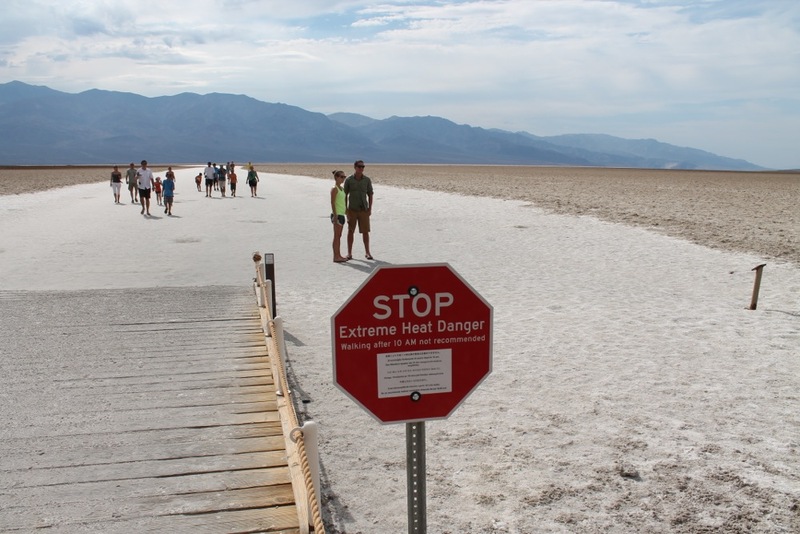 So, what is Badwater Basin? 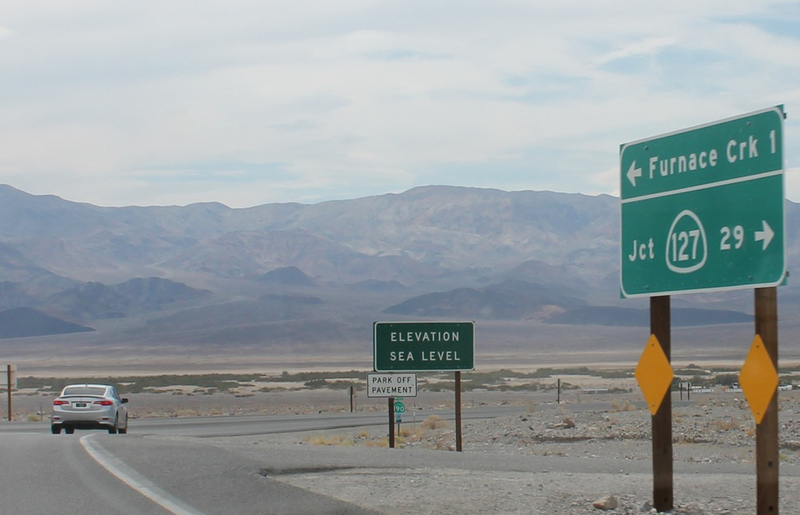 It’s the lowest elevation point in North America. That’s a good 282 feet below sea level. 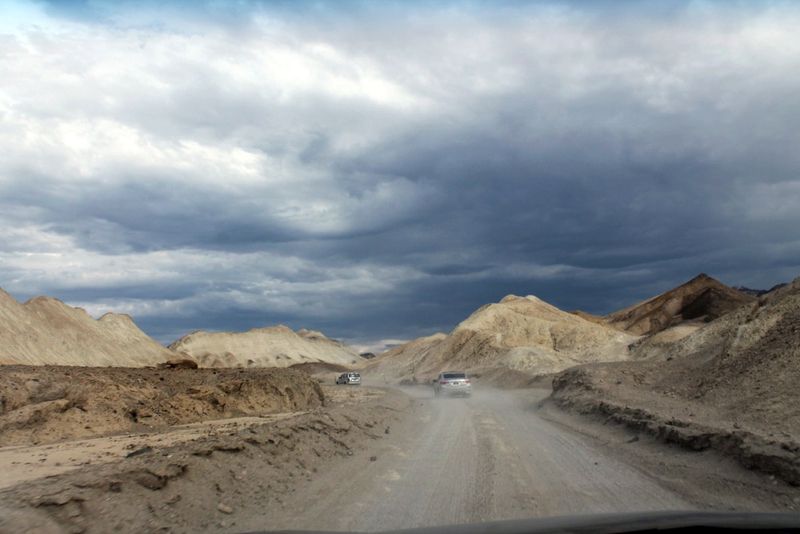 The gound was crusty and hard from the dried salt deposits. 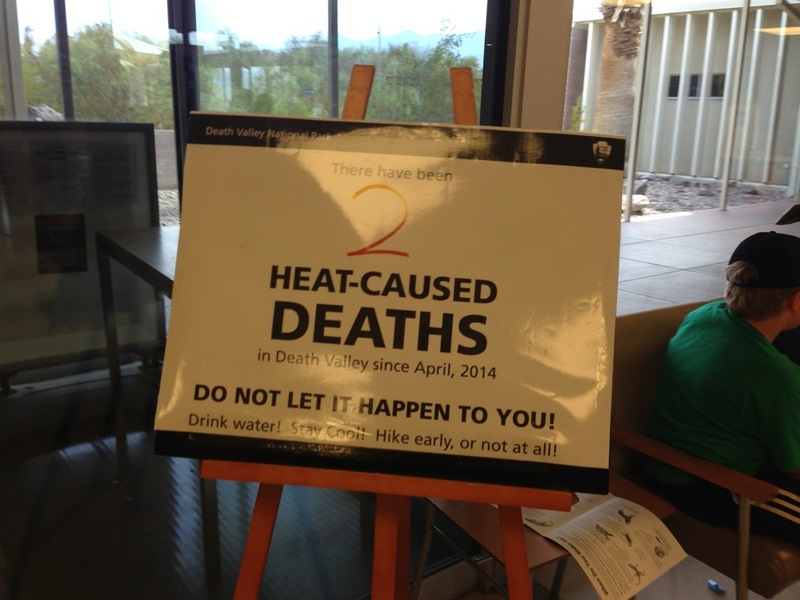 Another danger sign of the extreme heat. It said that walking after 10:00am was not recommended. So, here we go! It’s only 2-3pm in the afternoon. 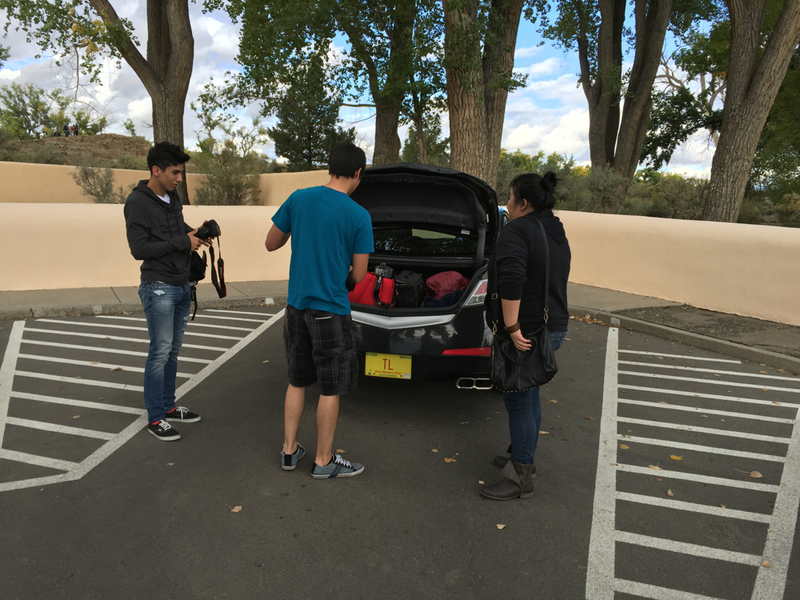 After we felt like we got a good dose of heat, we all swapped the keys again. 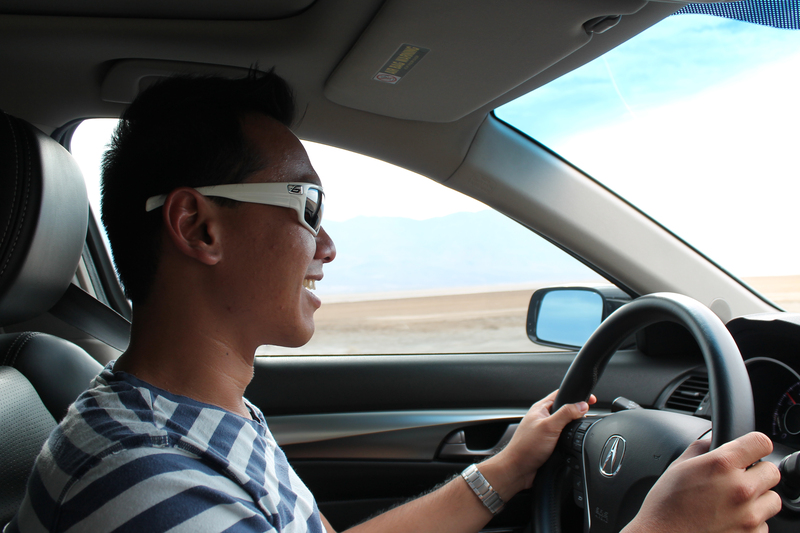 This time, Sofyan took the wheel of the TL while Peter was in the ILX. 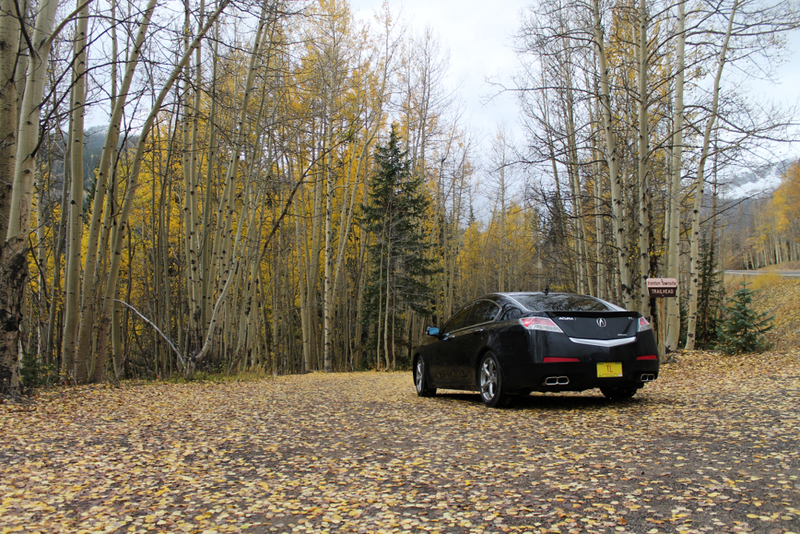 Now off to a scenic dirt road recommended by Tyson. 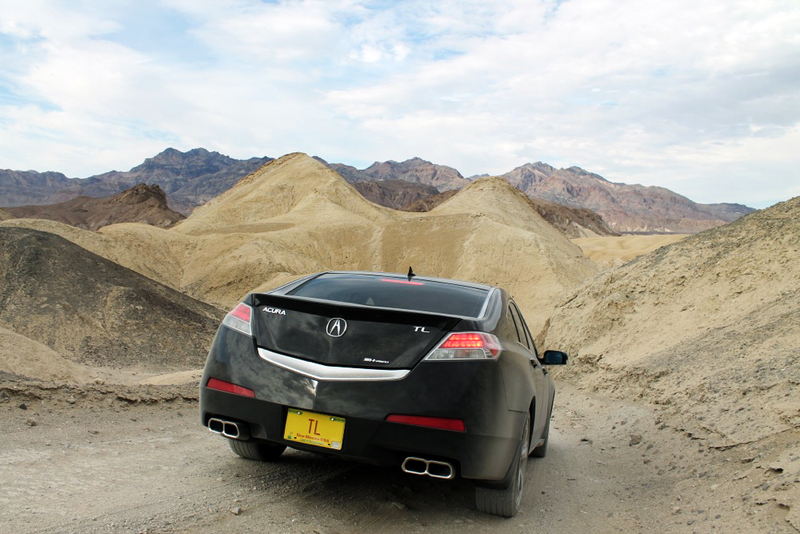 We were determined to bring some Death Valley dirt back home on our cars. 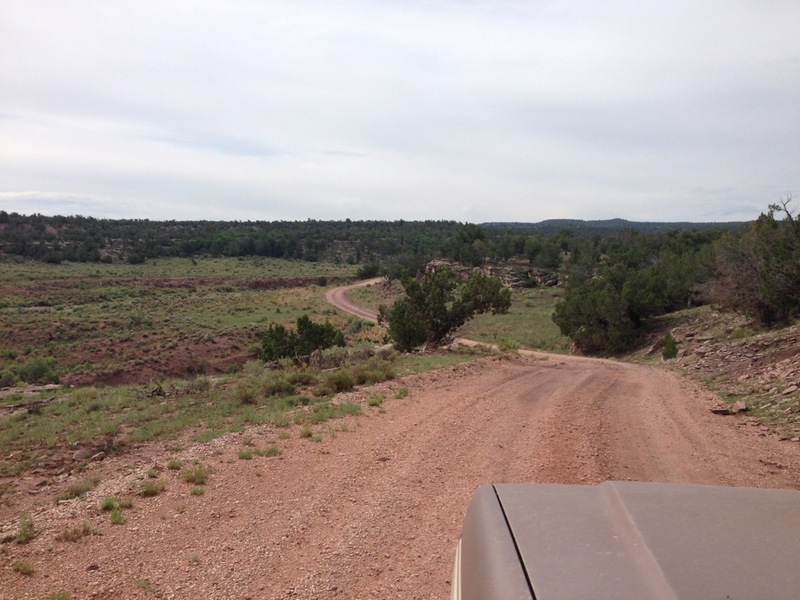 This is “20 Mule Team Canyon” trail. This was just 2.7 miles of heaven! It was so much fun, we drove this route twice! Peter and Sofyan got to try the TL on both runs. 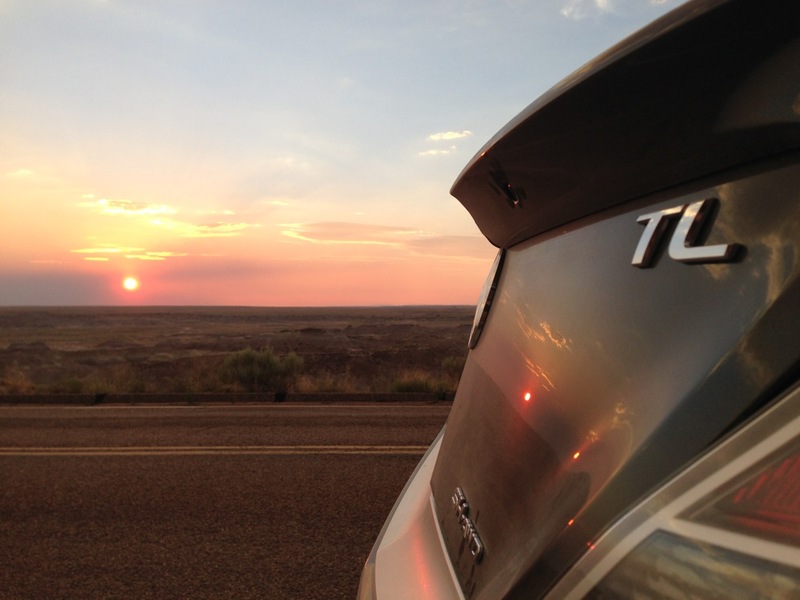 Thanks to Tyson for capturing this great angle of the TL. 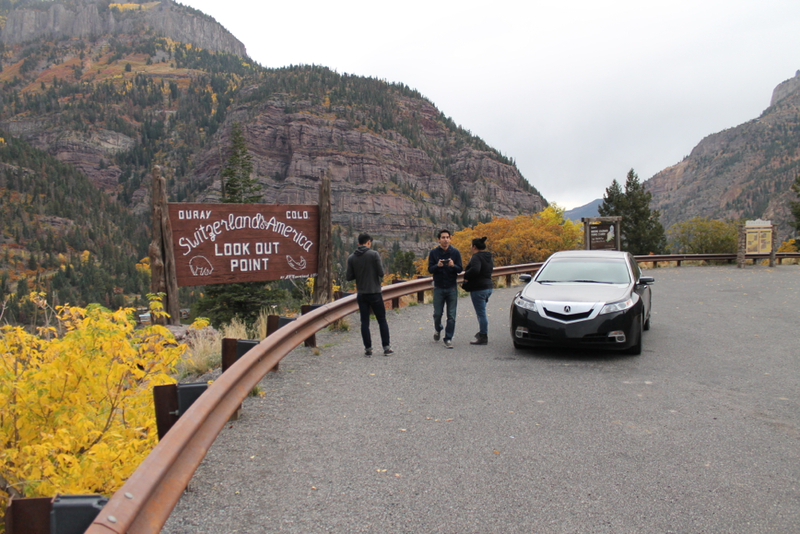 As you can see by my face, this road was one of the highlights of the Park. 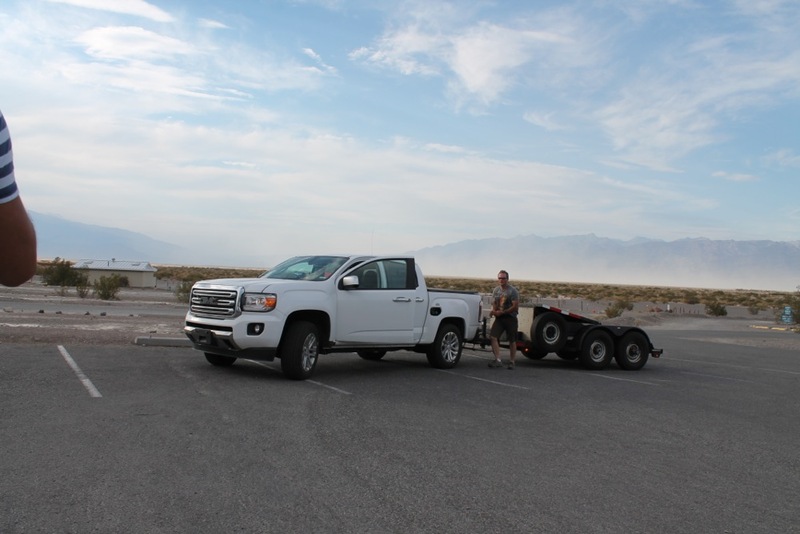 Upon further examination, we all concluded these were the 2016 GMC Canyon trucks in pre-production testing in the heat of the valley. So, there’s a teaser for you. We might have a diesel offering of the next Canyon. Peter took the wheel of the TL as we headed out of the park to the hotel for the evening. 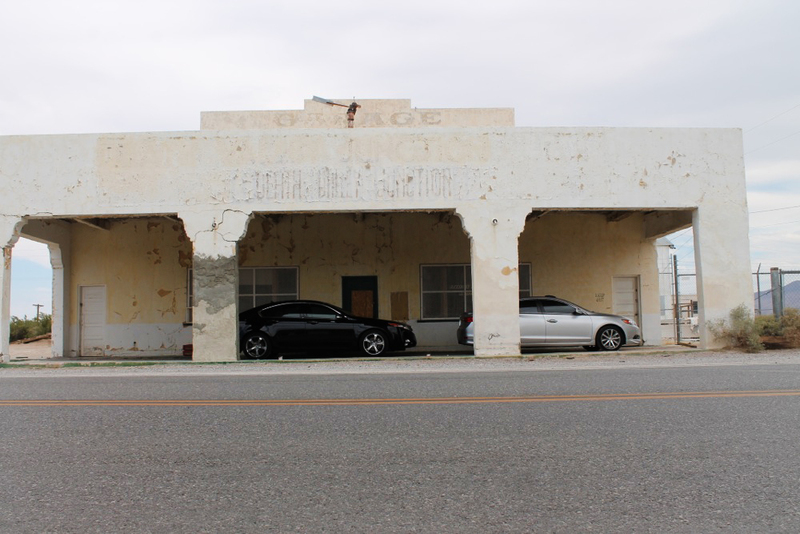 Night’s stay was on the California/Nevada border in the village of Amargosa Valley. 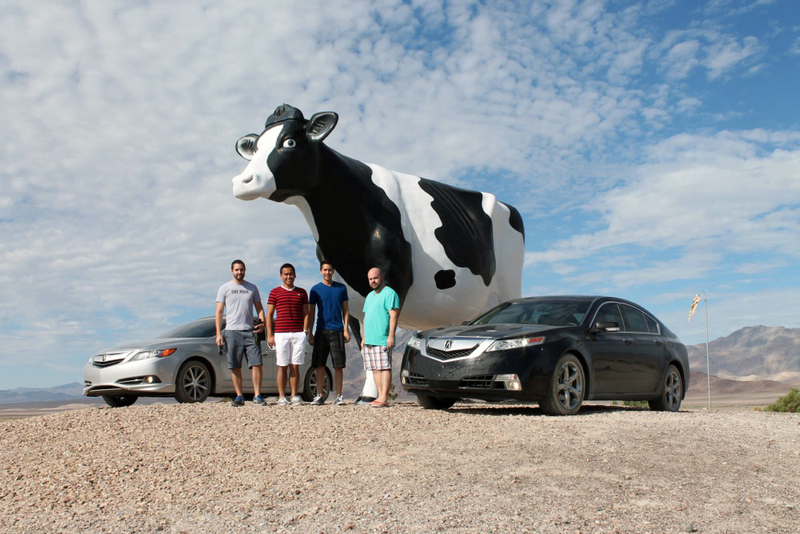 The next day, we grabbed a photo at the giant cow that was by the hotel. 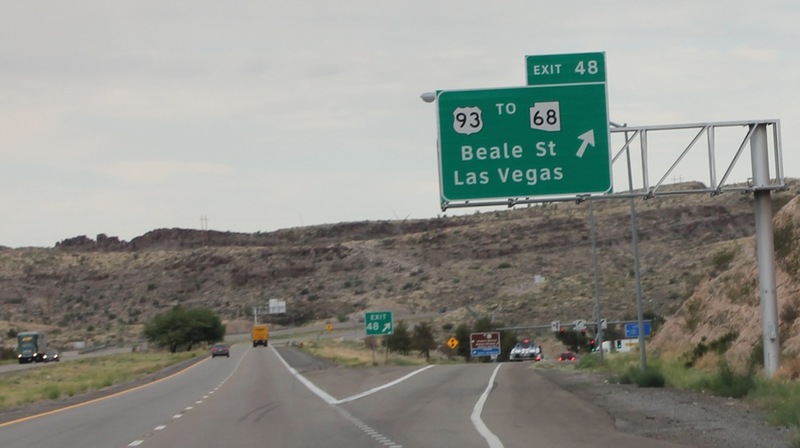 After we parted ways in Kingman, I took I-40 back to New Mexico where I’d stop by my grandpa’s house for the next night. 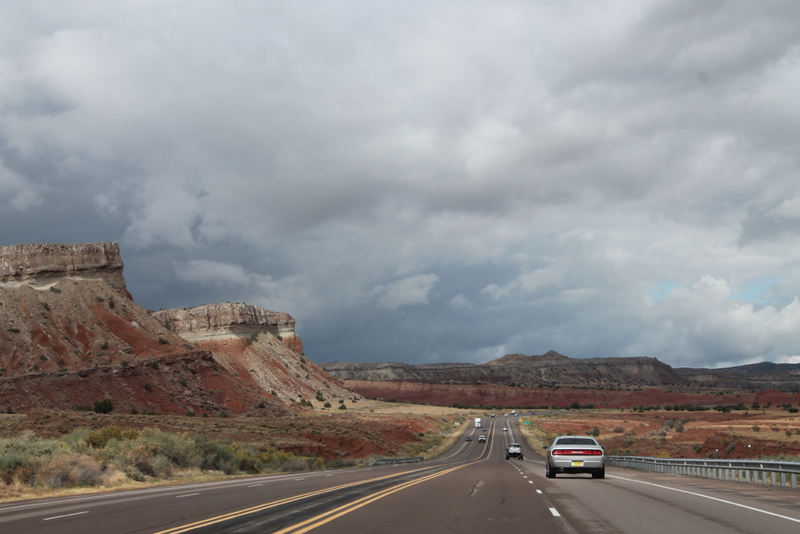 Here’s on the way to Flagstaff, AZ. 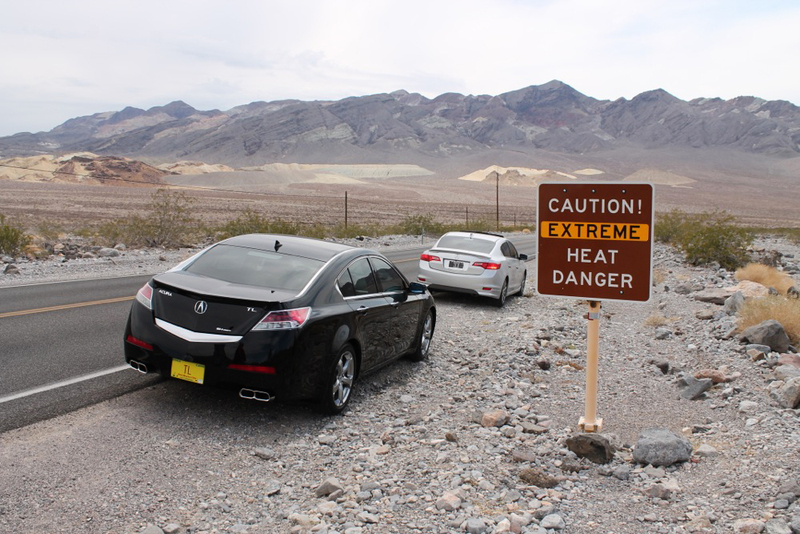 70˙F was sure a welcome compared to the heat of Death Valley. Normal stop at my old stomping grounds to see what the area looks like. It’s been 8 years now since I’ve resided here! Pit stop for a few sunset photos. Smoke in the sky from a nearby forest fire gave the sun a nice red glow. 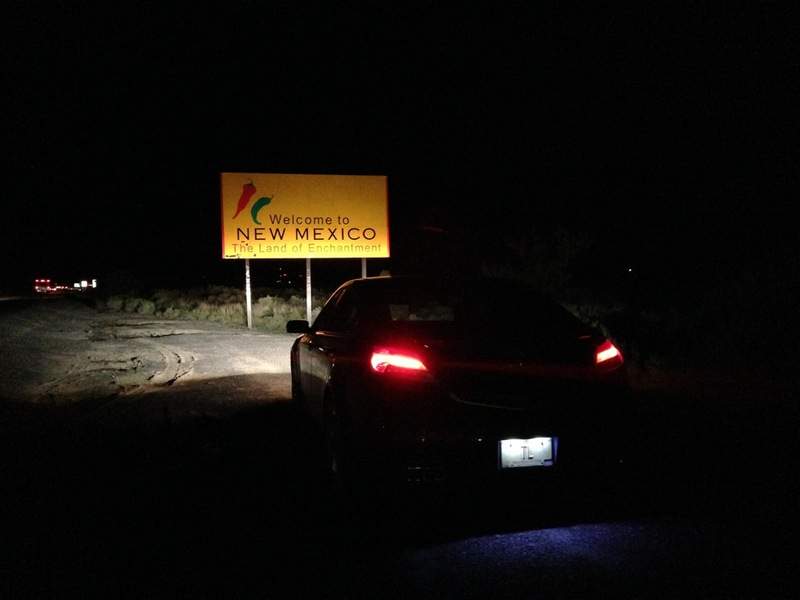 I got to New Mexico around 9pm. My grandpa is on vacation for about 3 months in Canada so it was a goal of mine to check up on his house and mail. 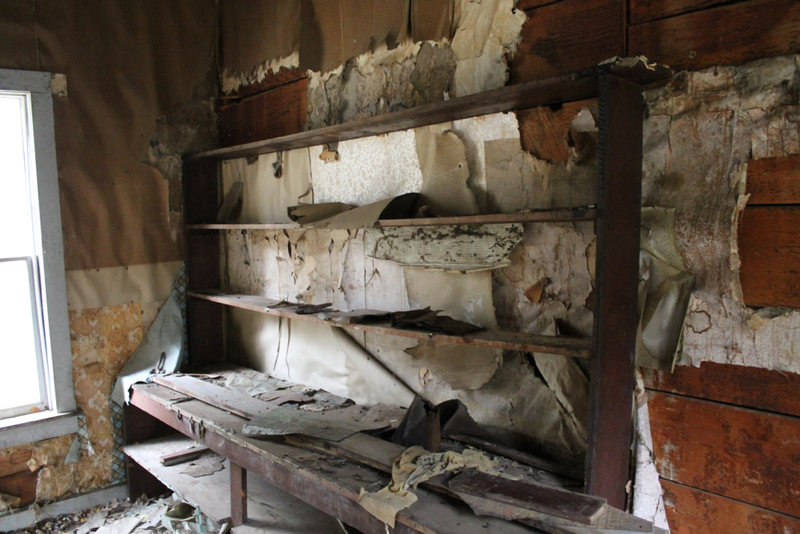 Remember my grandpa’s stable? The next day, I took a few of his cars out for a quick drive to run some oil through and clean away any cobwebs. 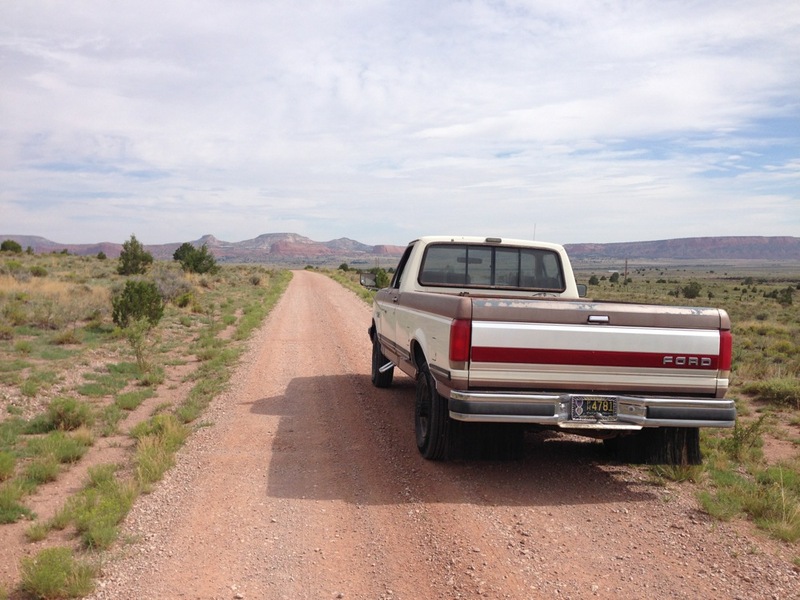 Here’s the old ’87 F-250 Diesel prowling the back roads of northern New Mexico. I love this thing. 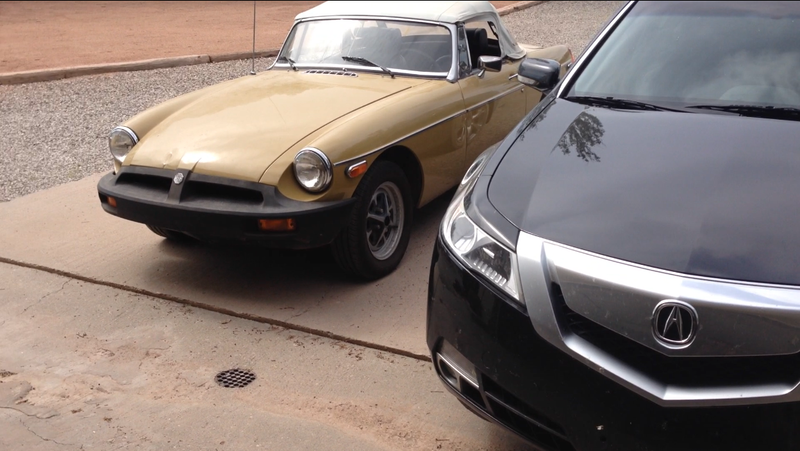 Also, got the ’74 MGB out to run around a little. This hadn’t been started in about 6 months. I always like to challenge myself and the TL. How about borrowing a gas lawn mower and weed wacker? Snug, but it fit! 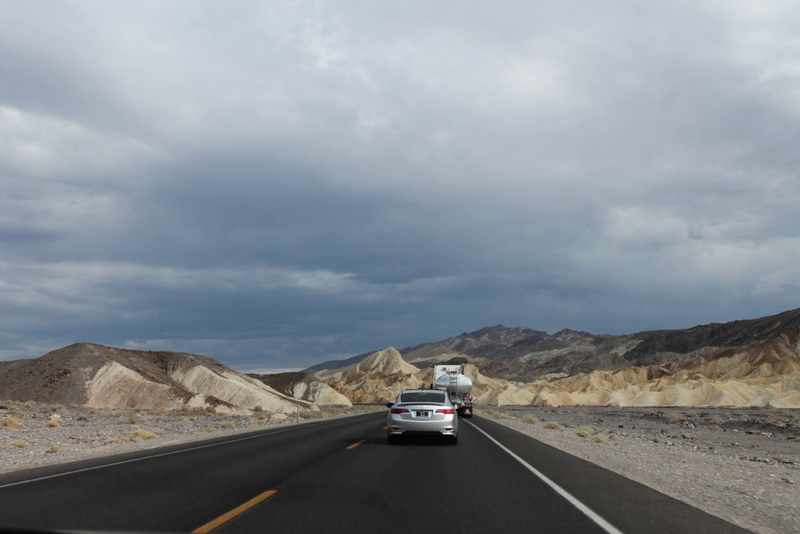 And that concludes the Death Valley trip. Here’s my ending mileage. Thanks all for coming along!